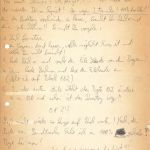 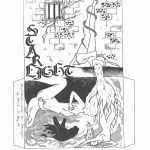 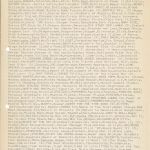 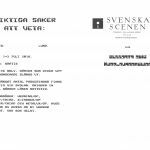 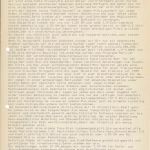 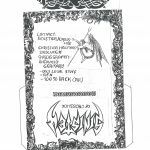 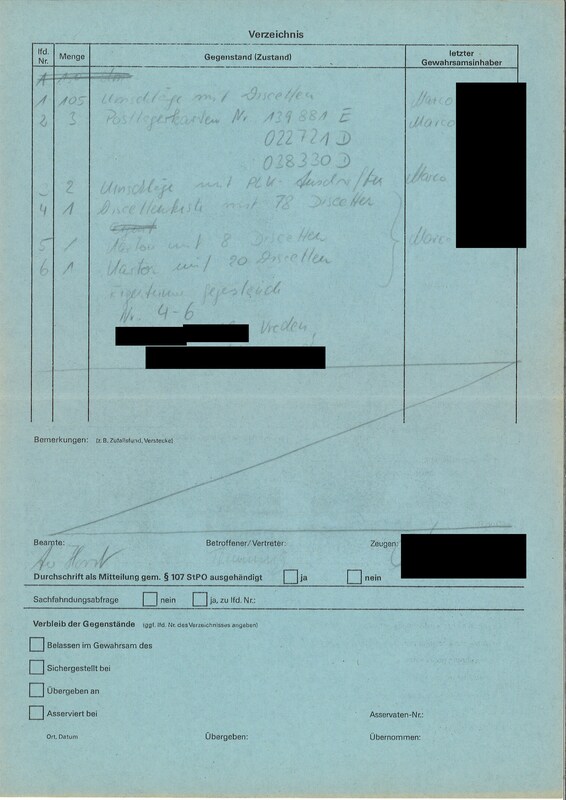 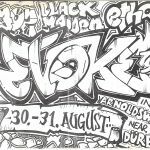 Once again we are proud to present a few documents from a rare genre – criminal proceedings against scene members. 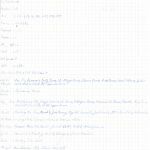 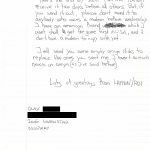 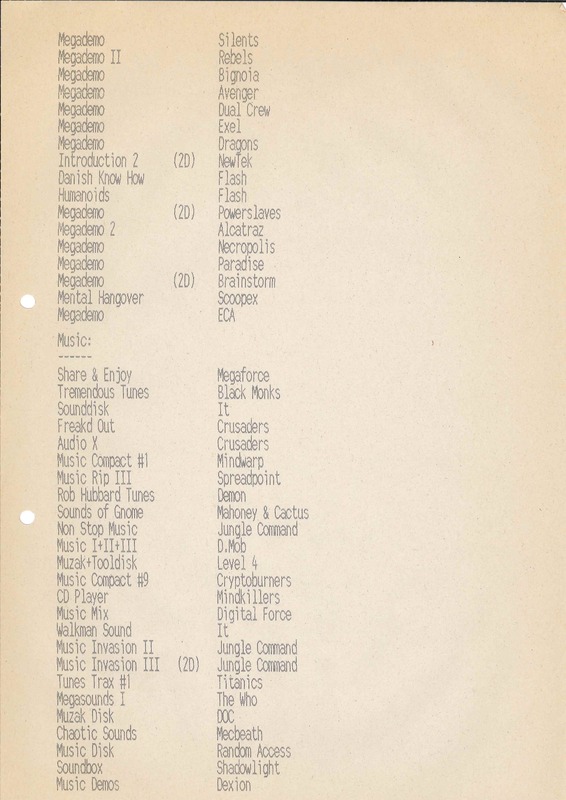 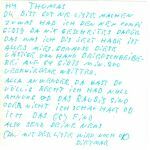 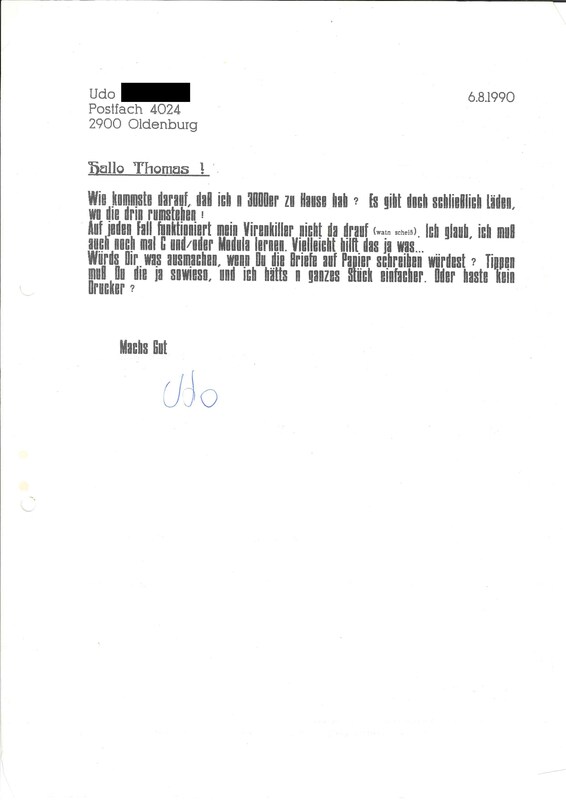 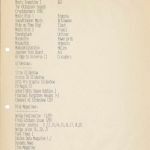 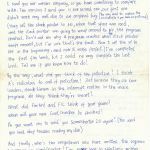 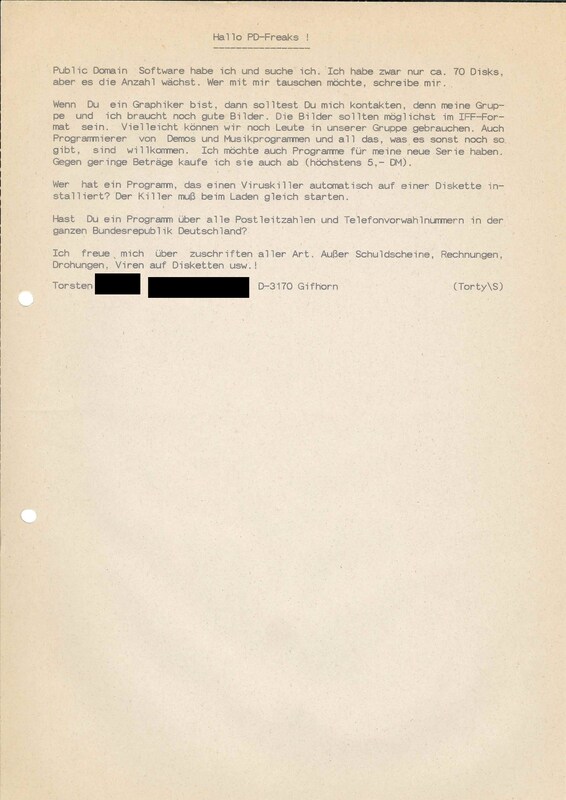 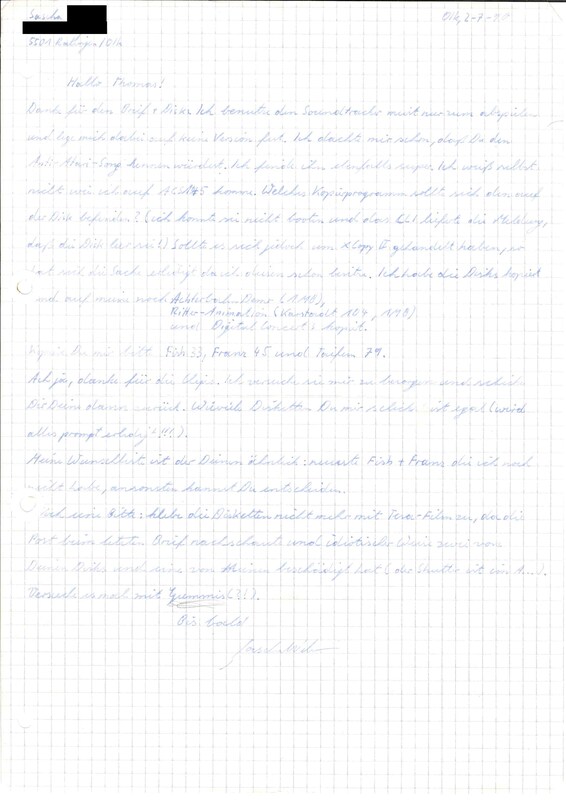 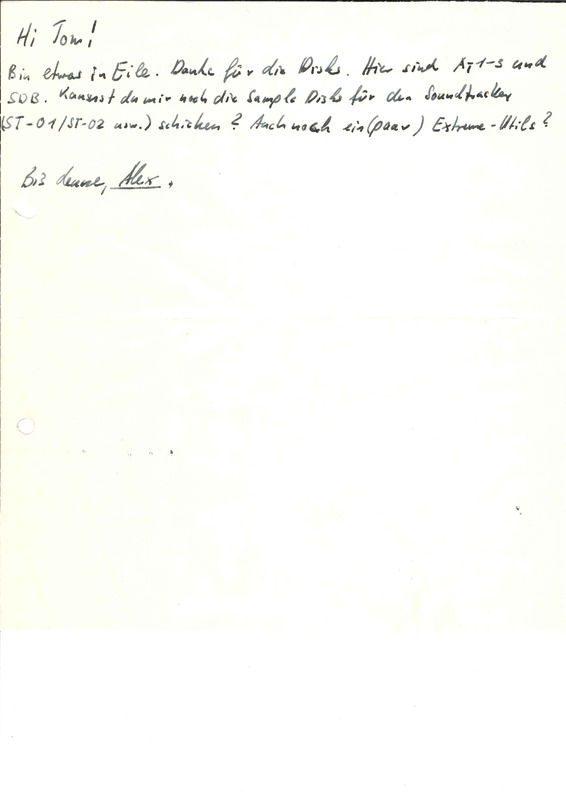 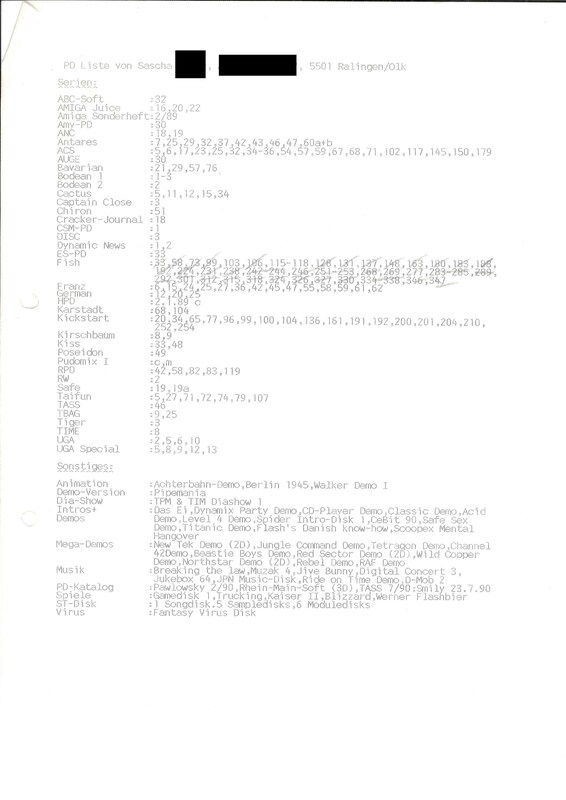 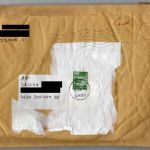 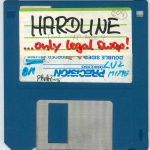 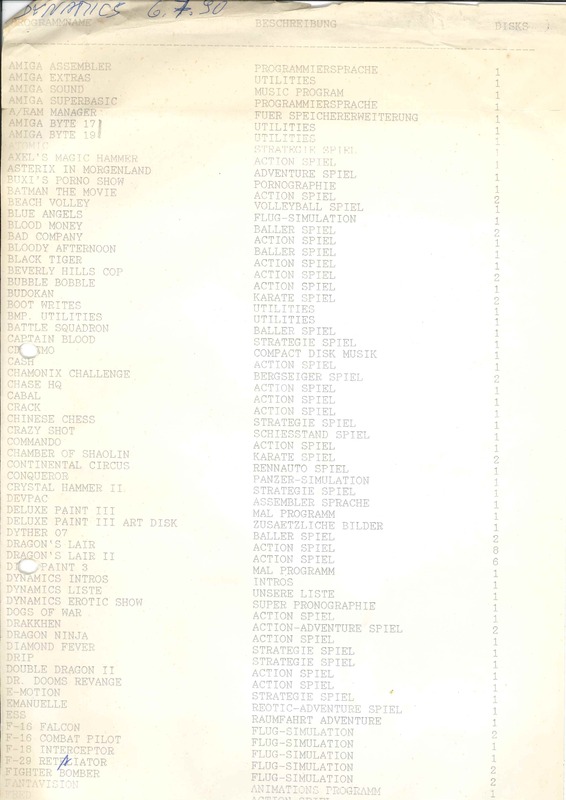 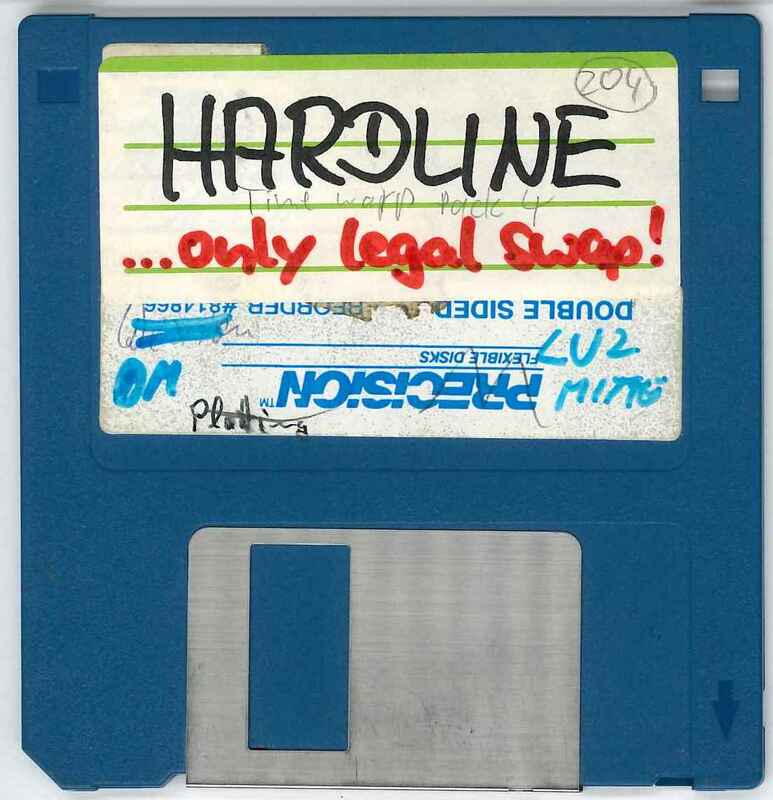 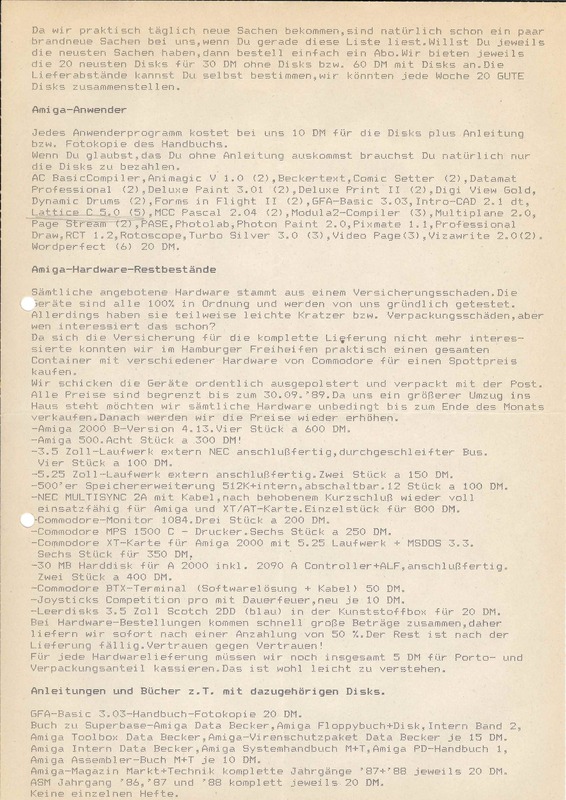 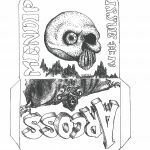 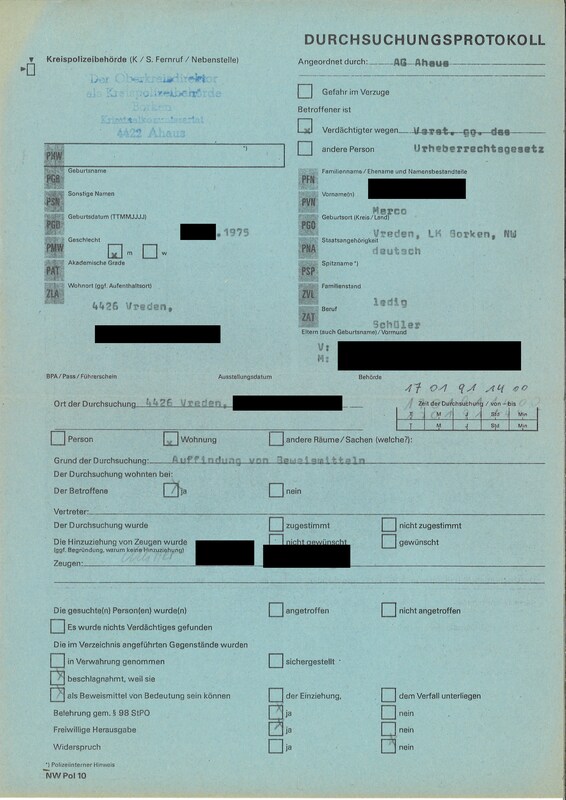 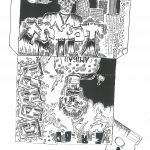 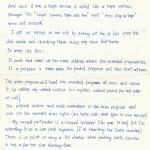 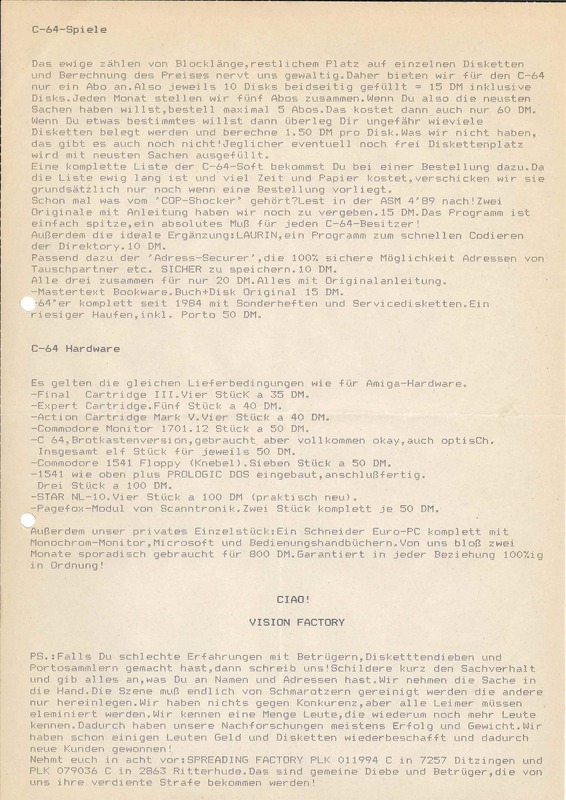 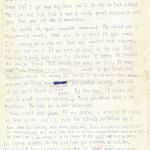 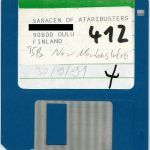 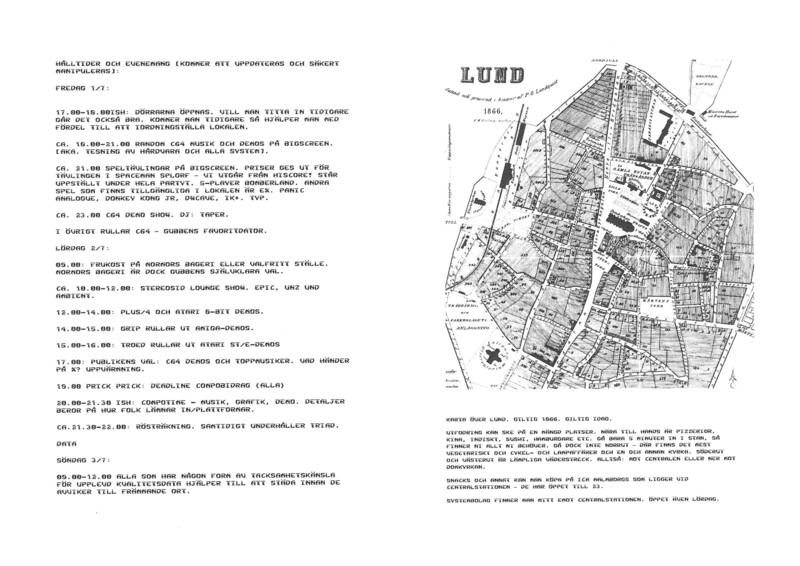 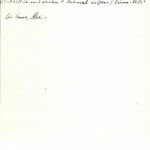 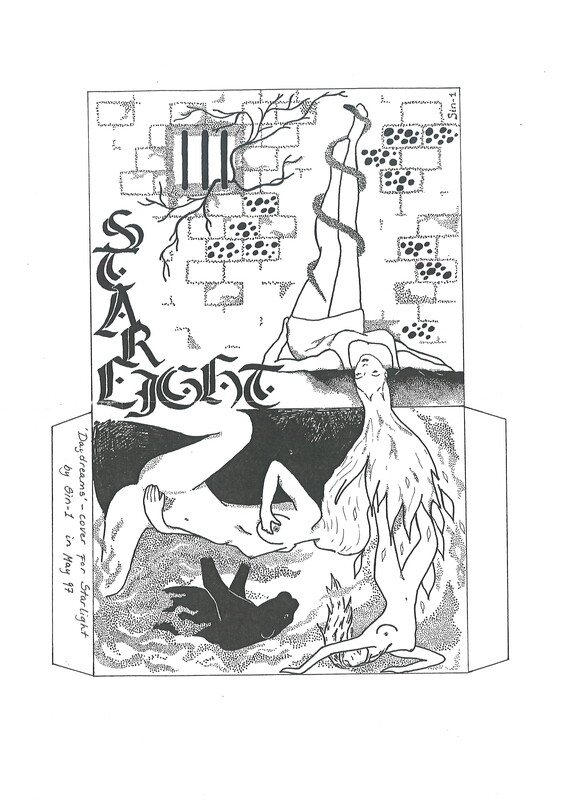 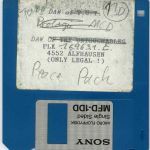 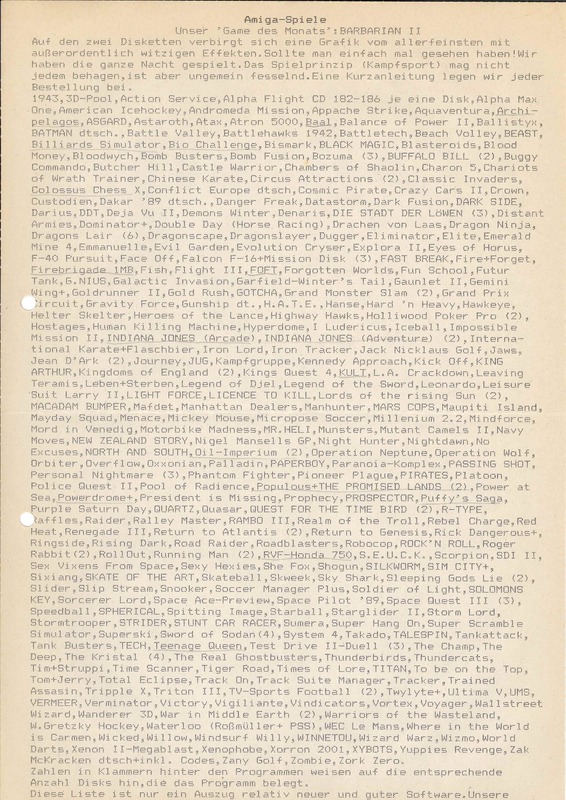 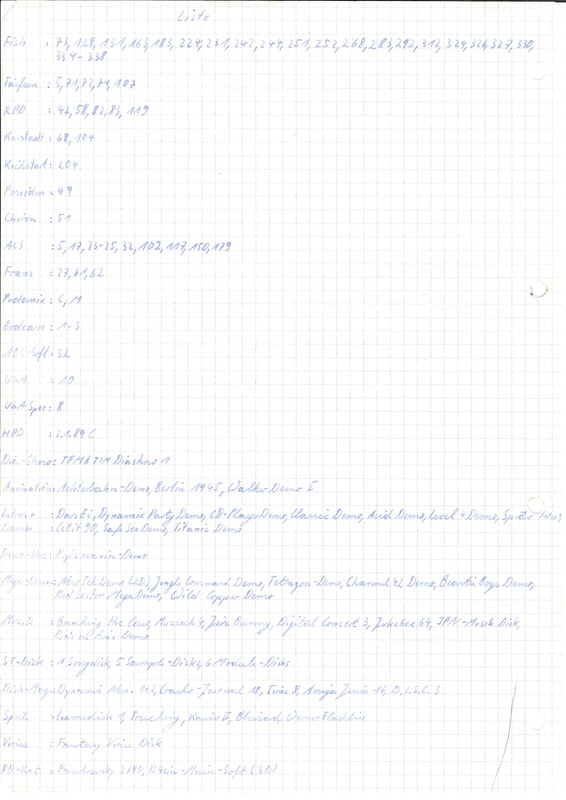 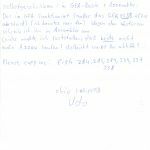 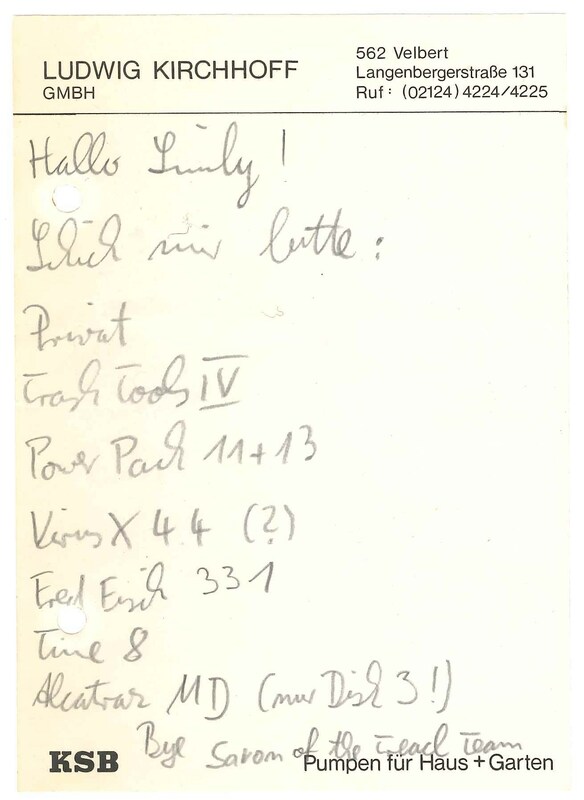 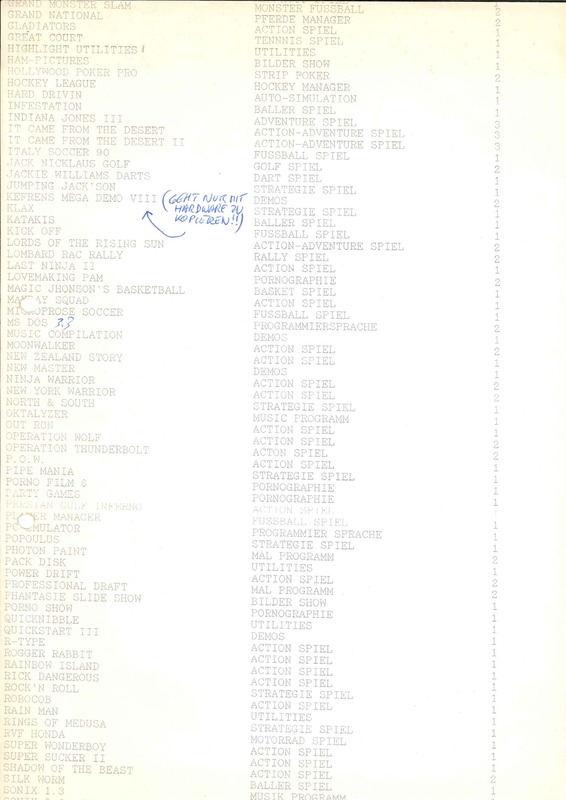 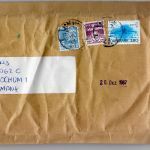 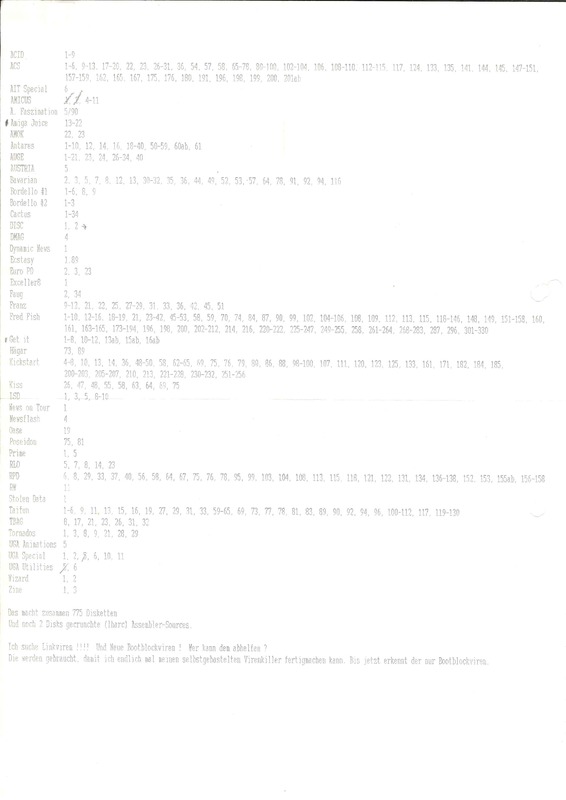 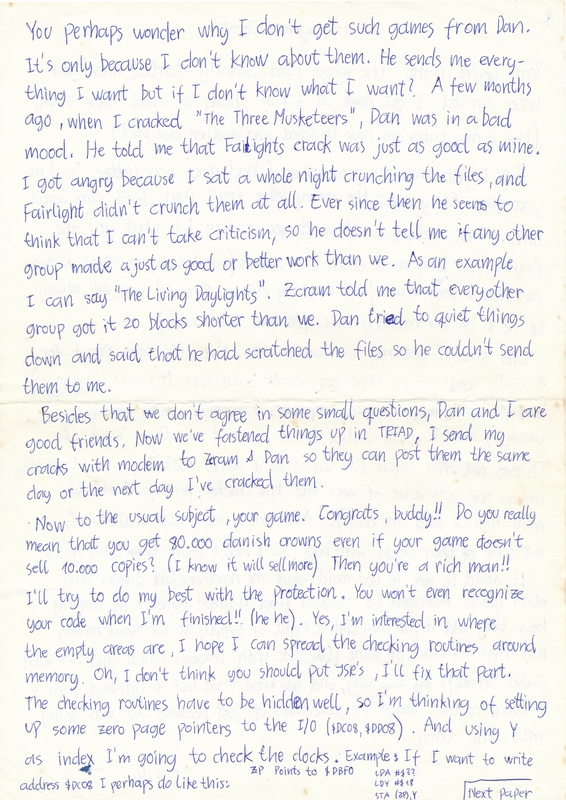 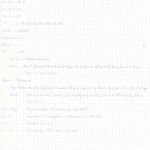 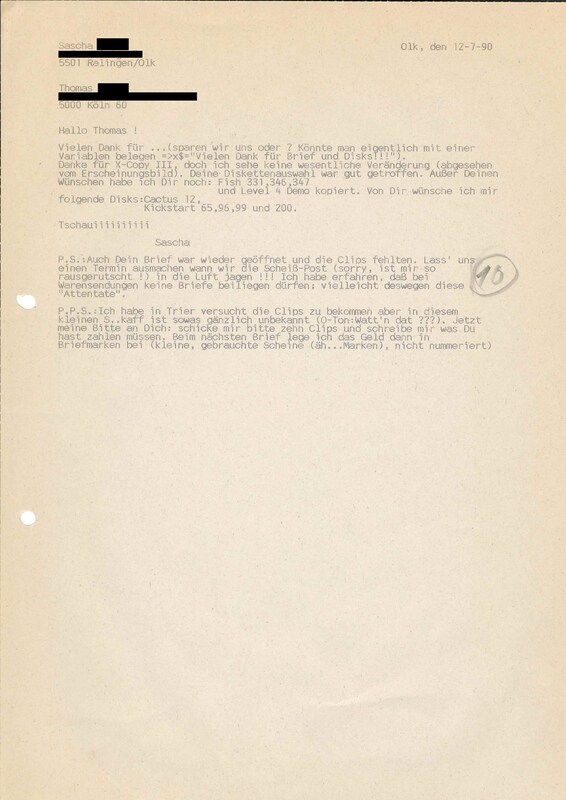 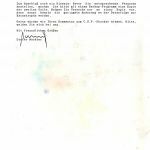 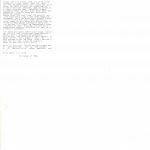 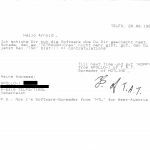 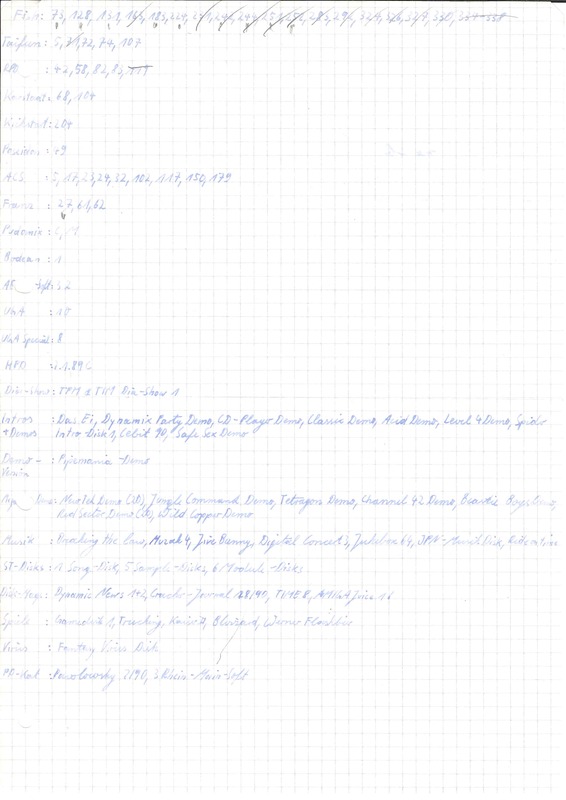 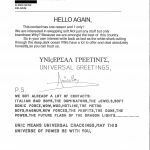 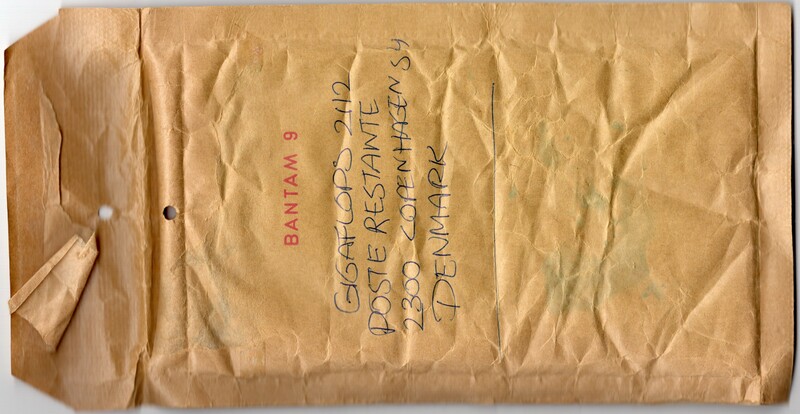 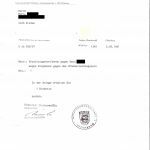 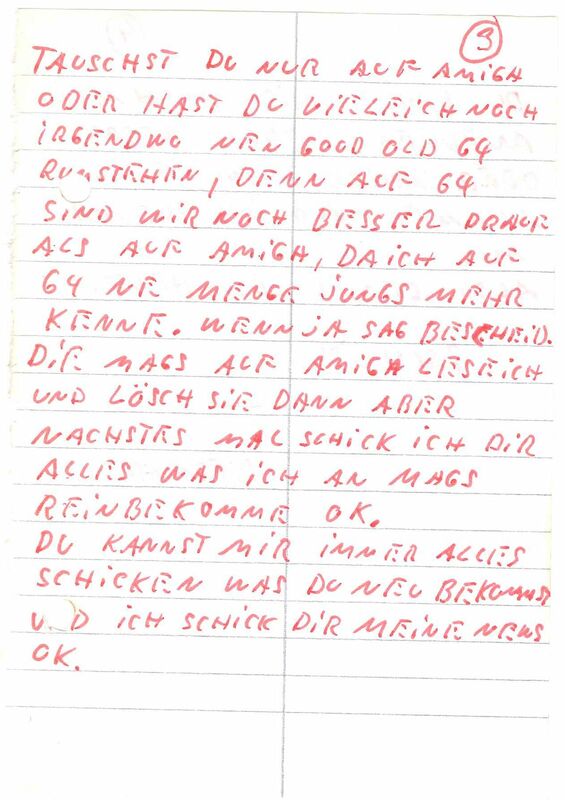 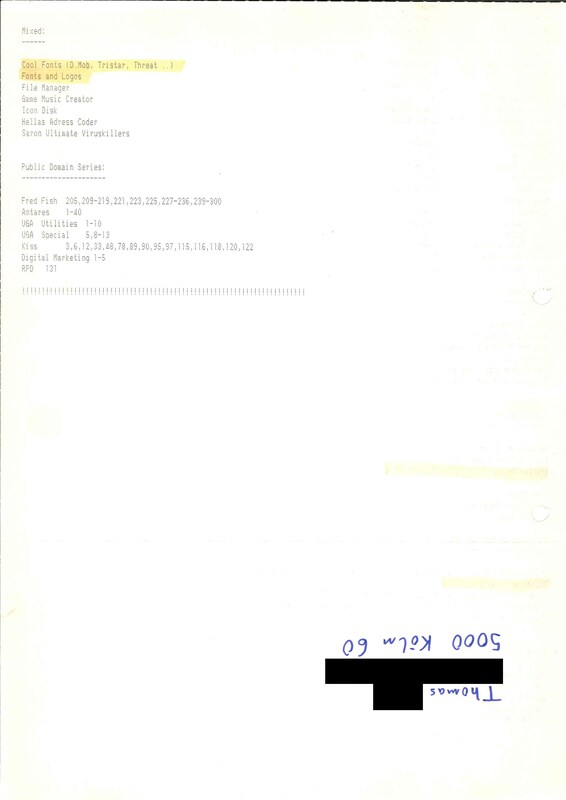 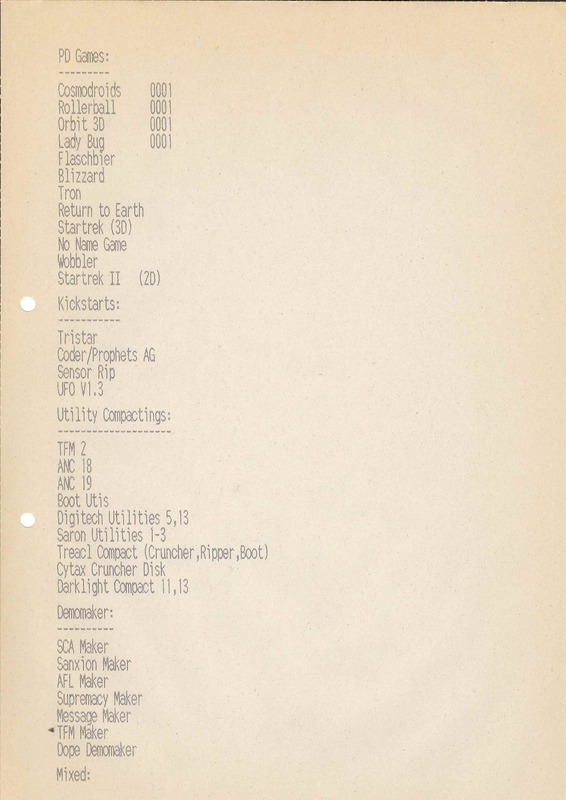 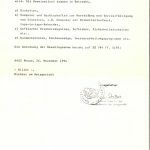 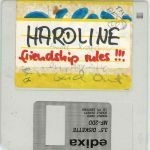 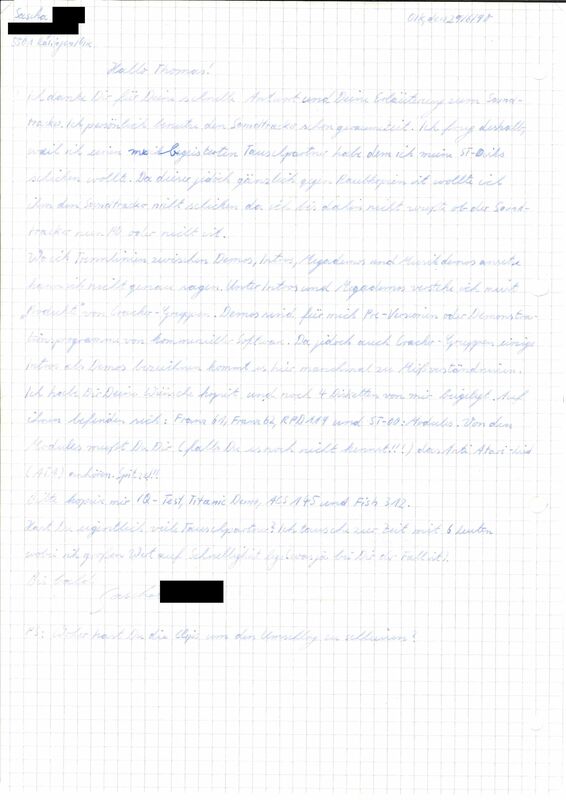 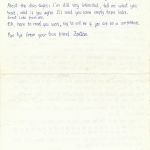 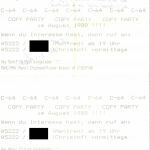 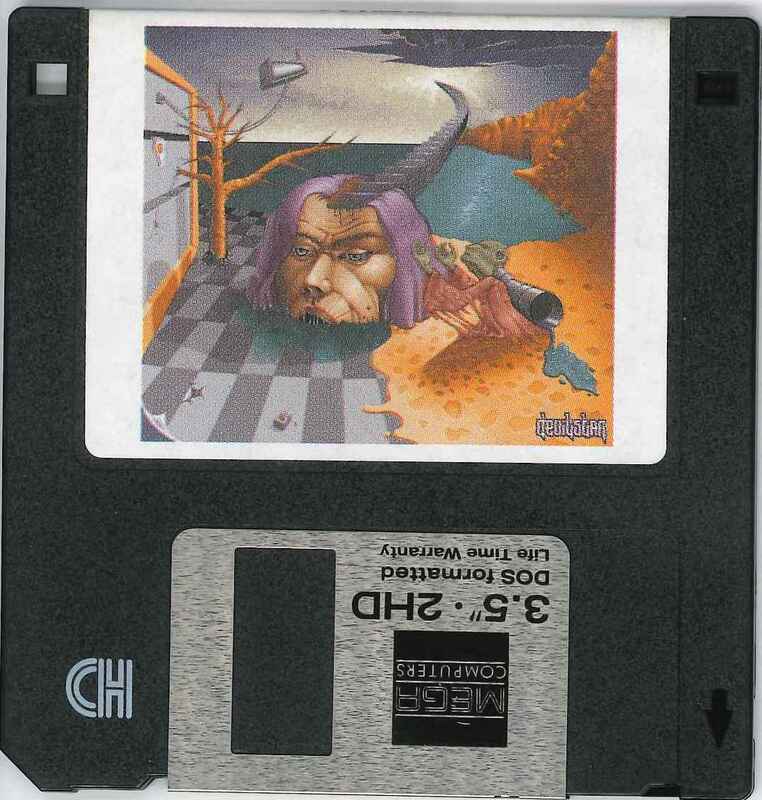 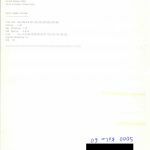 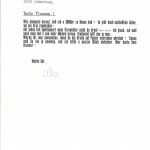 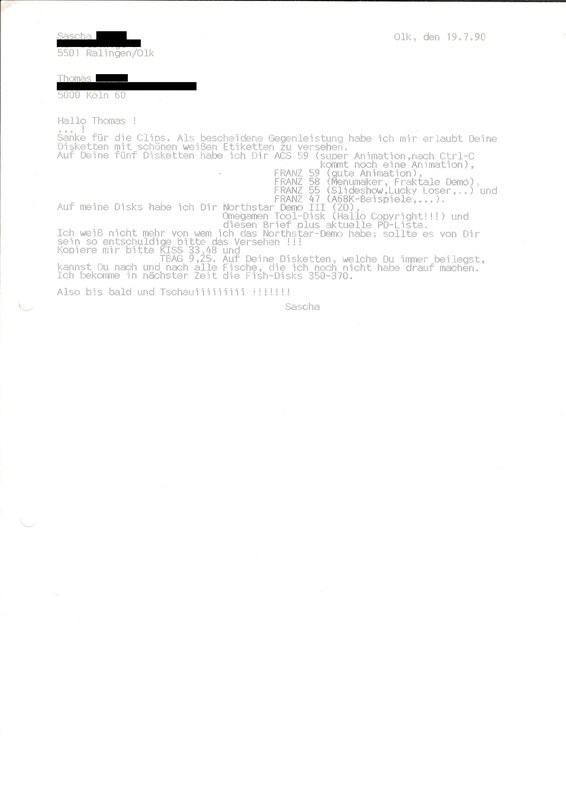 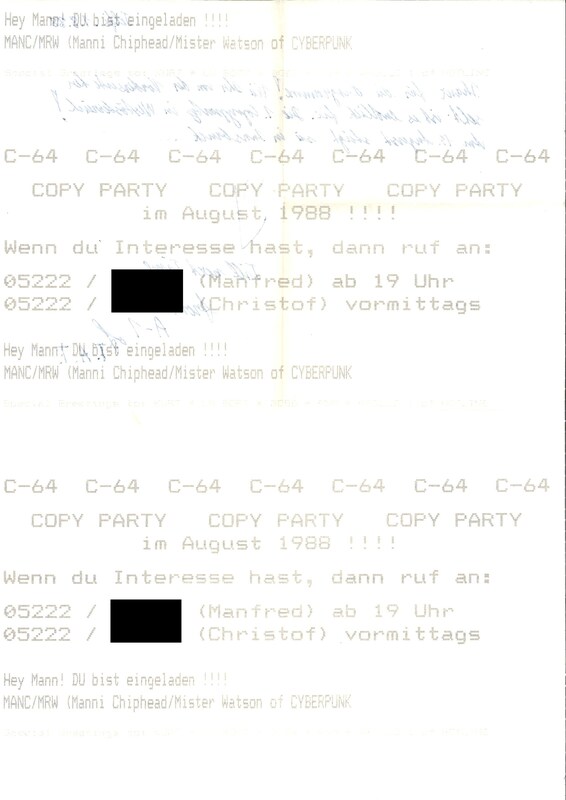 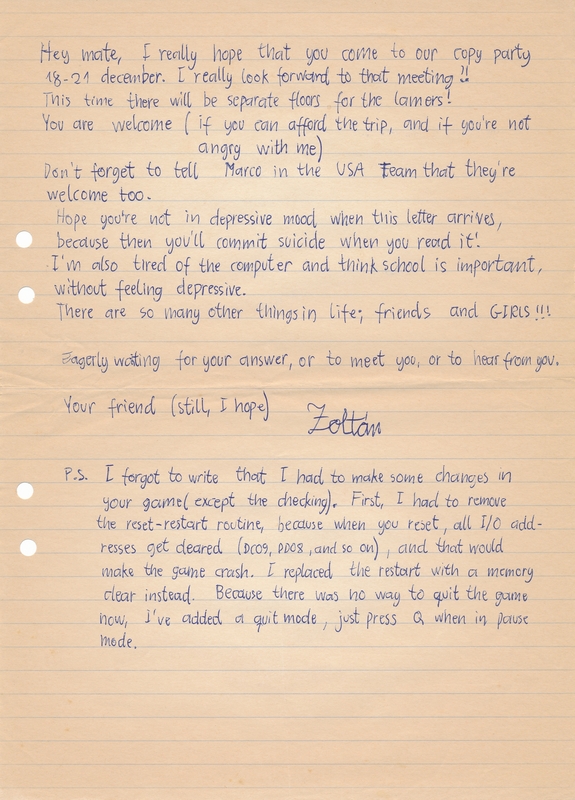 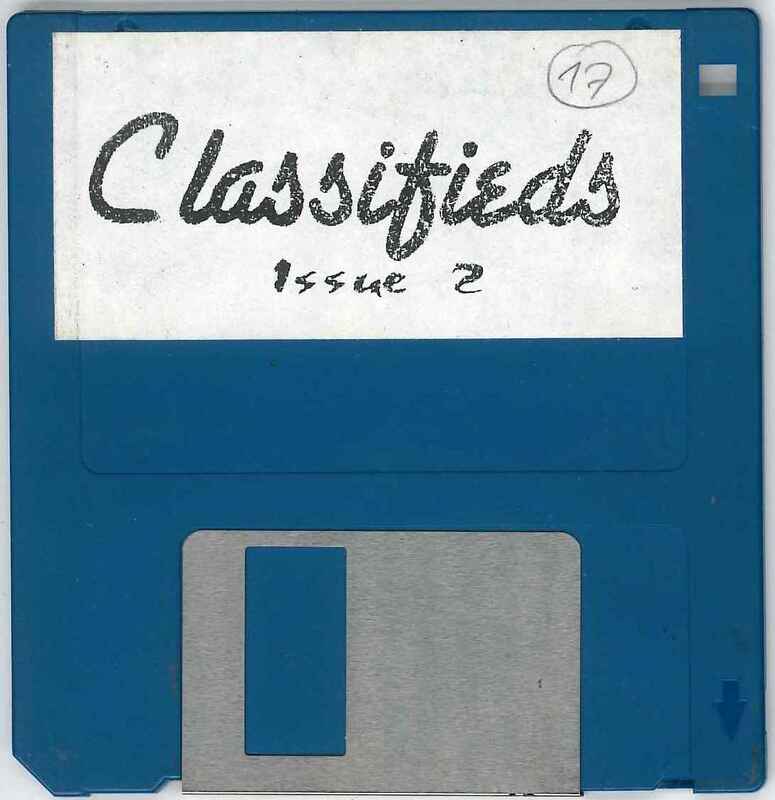 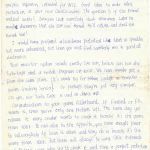 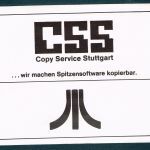 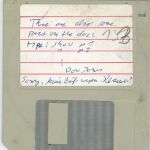 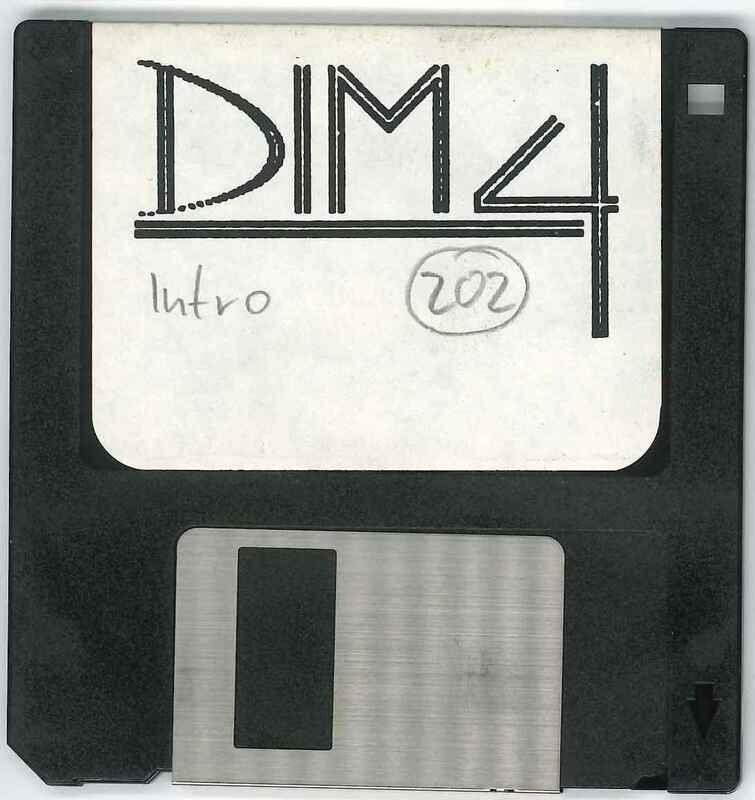 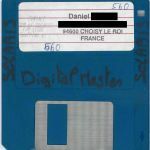 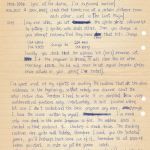 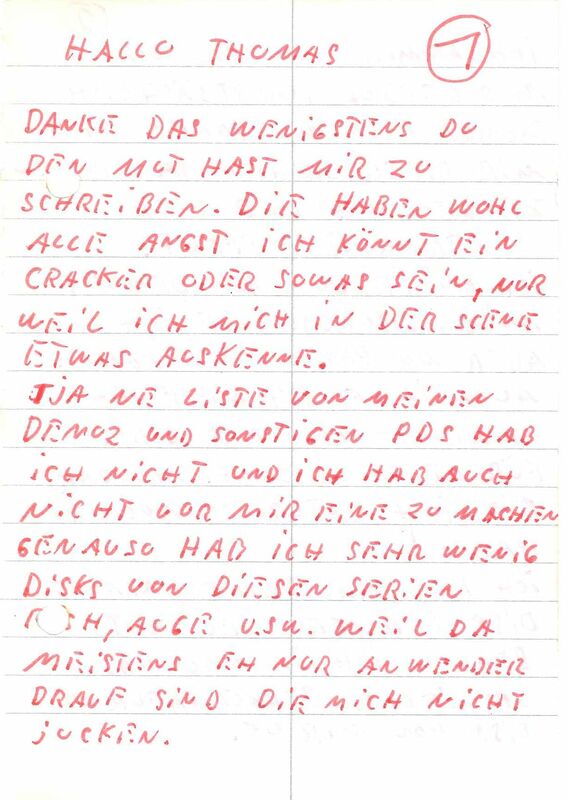 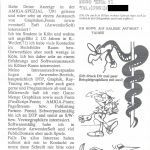 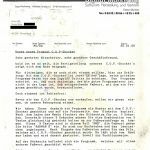 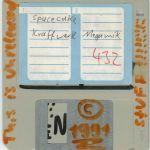 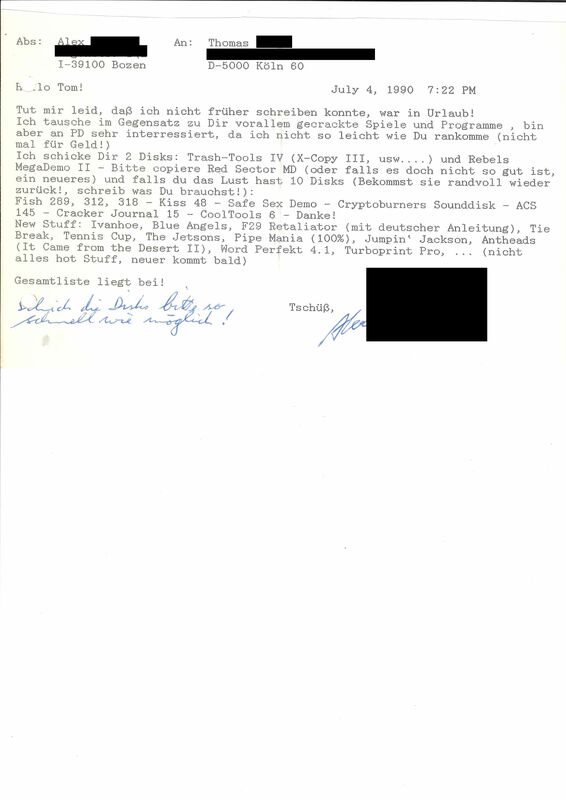 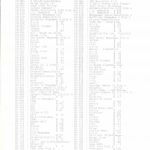 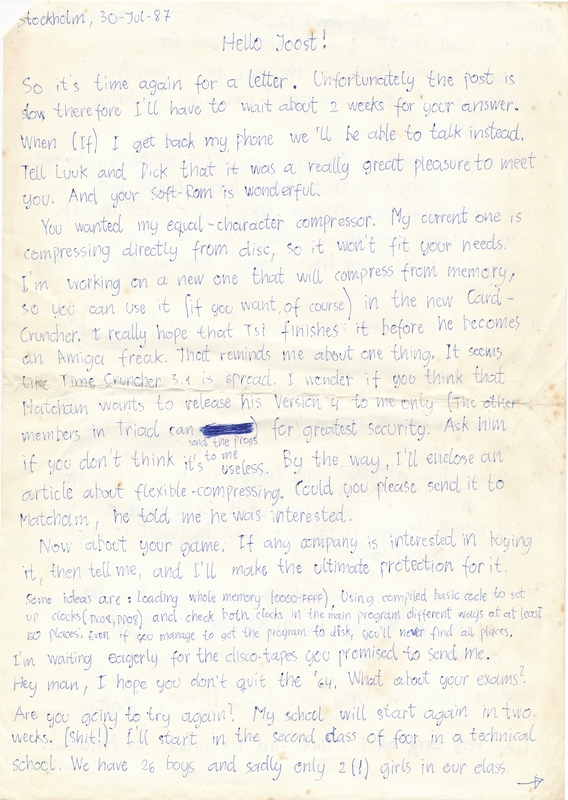 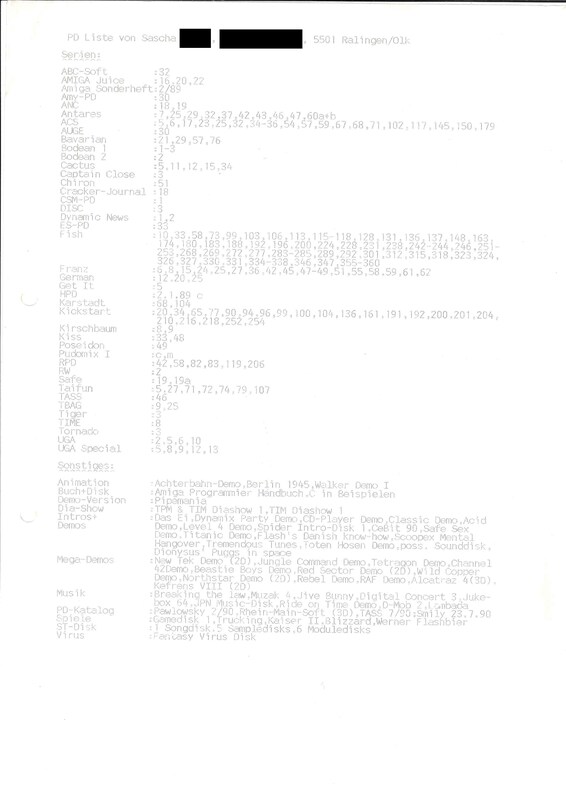 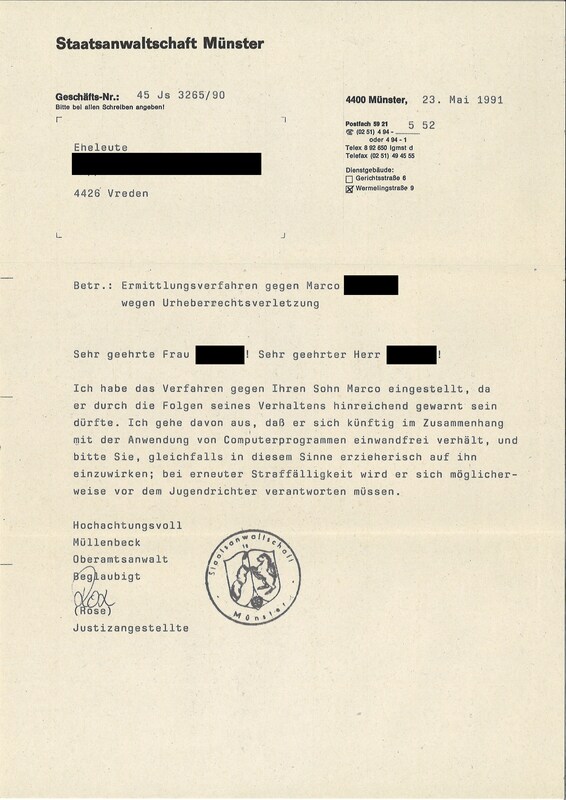 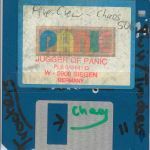 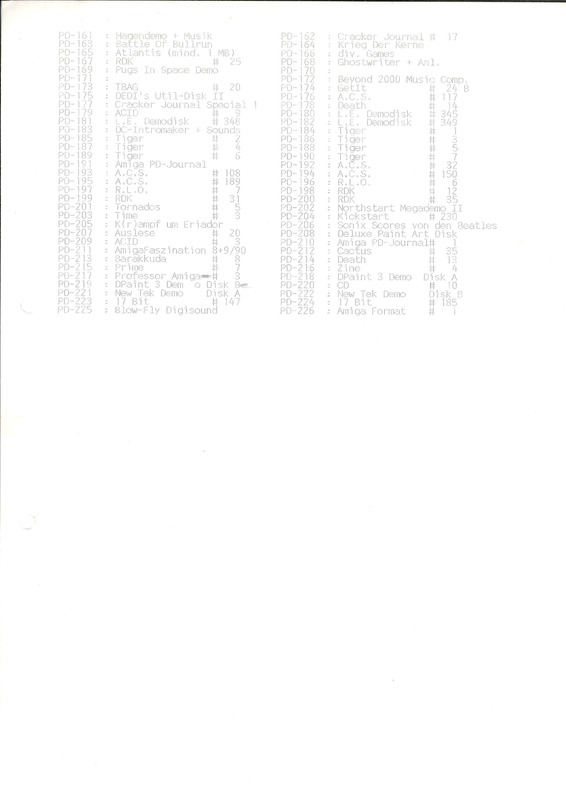 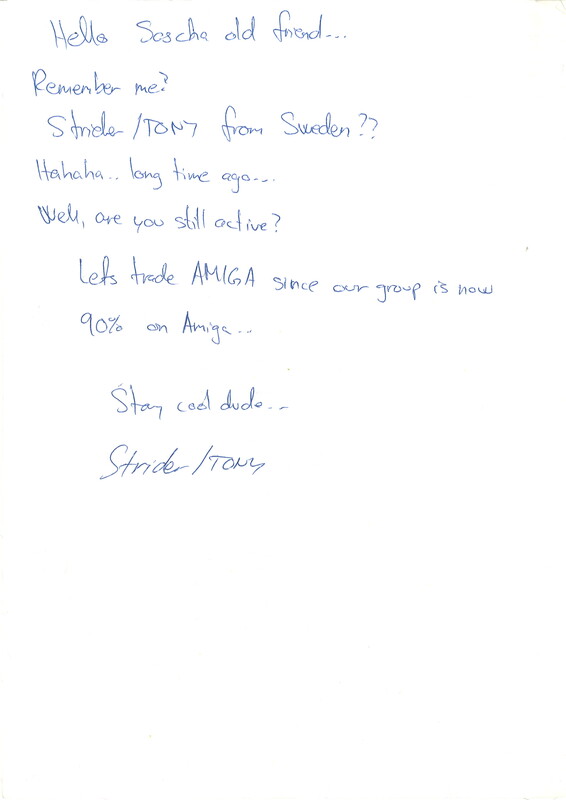 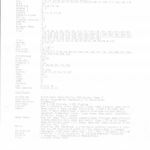 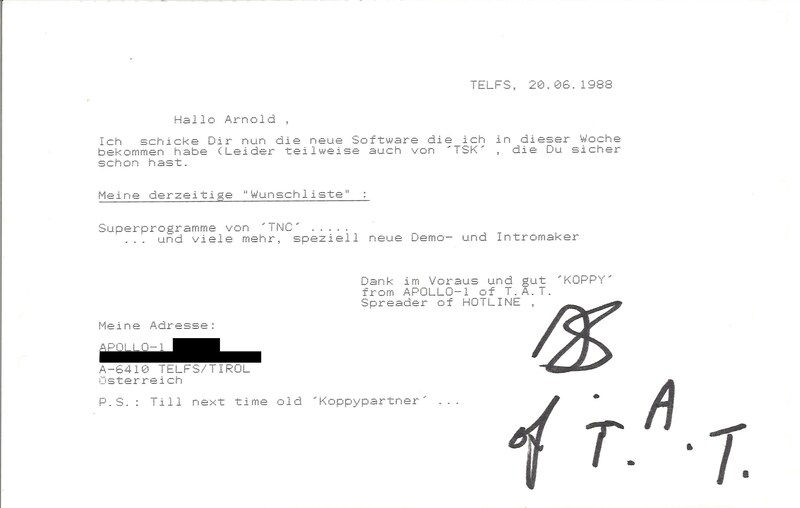 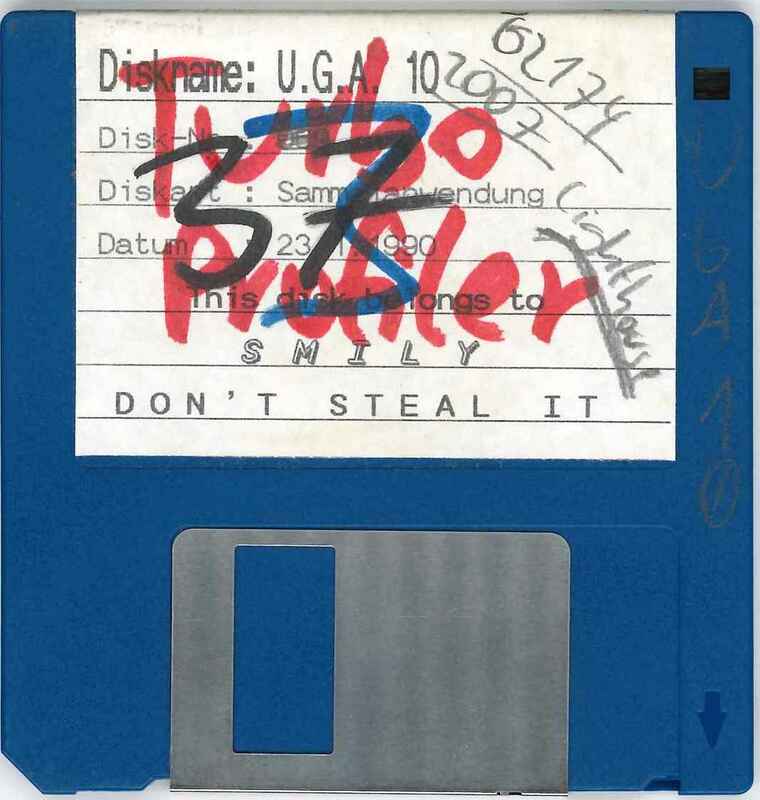 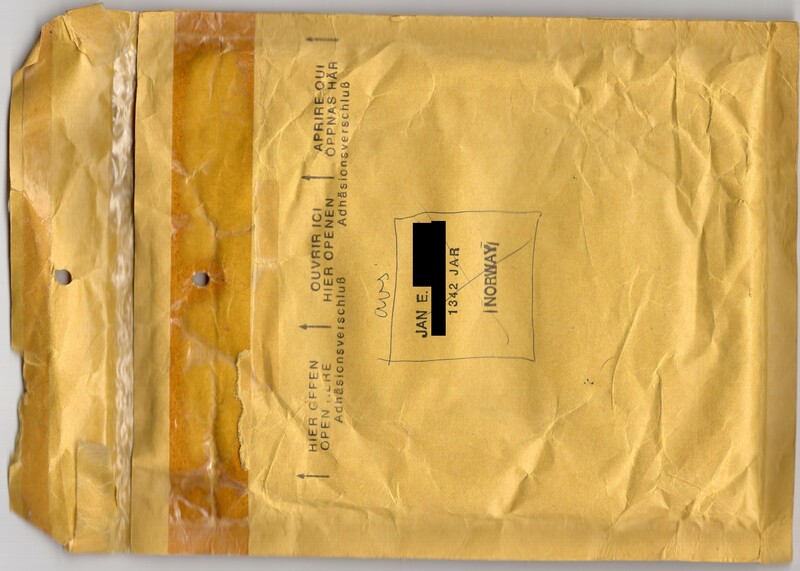 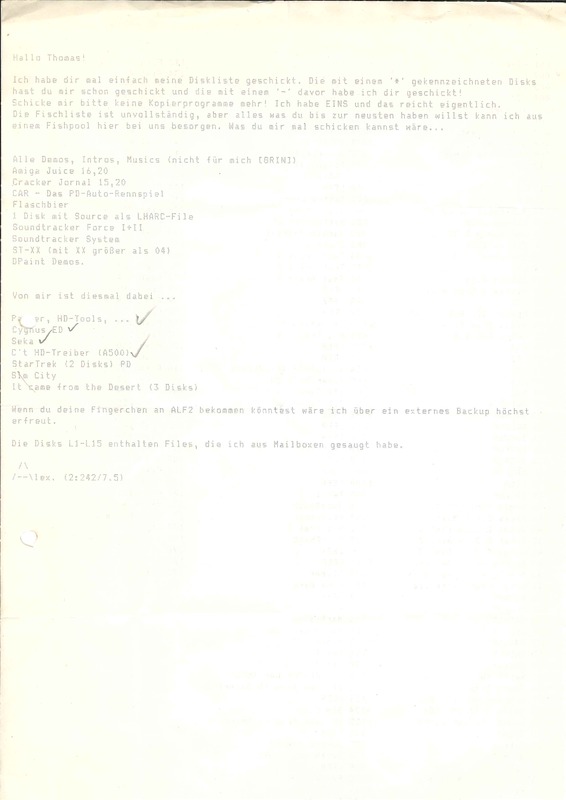 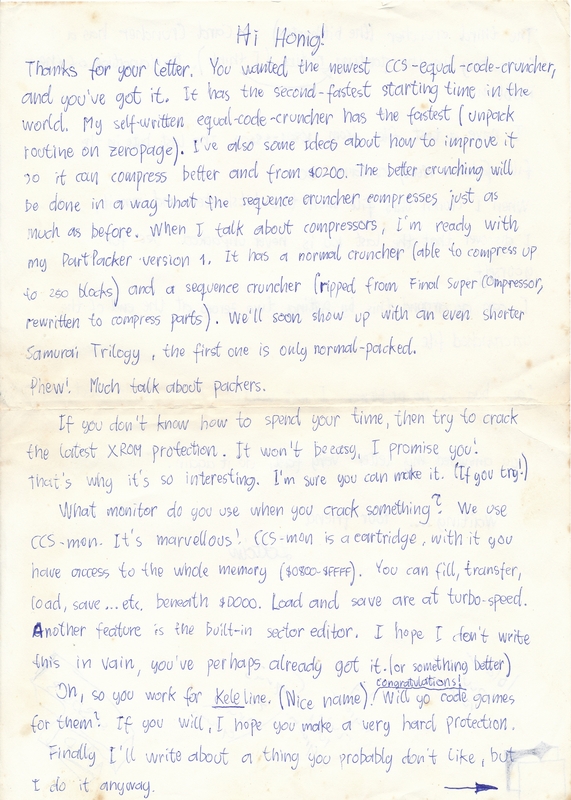 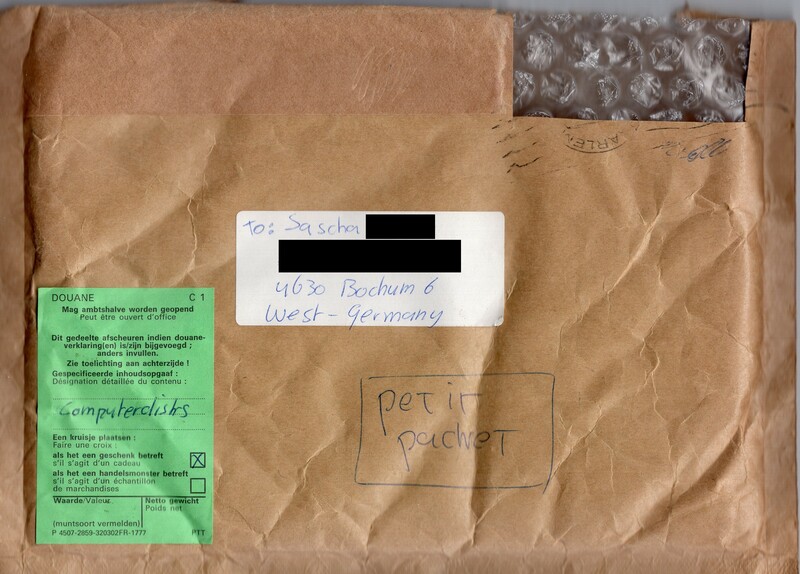 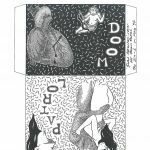 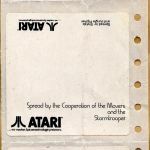 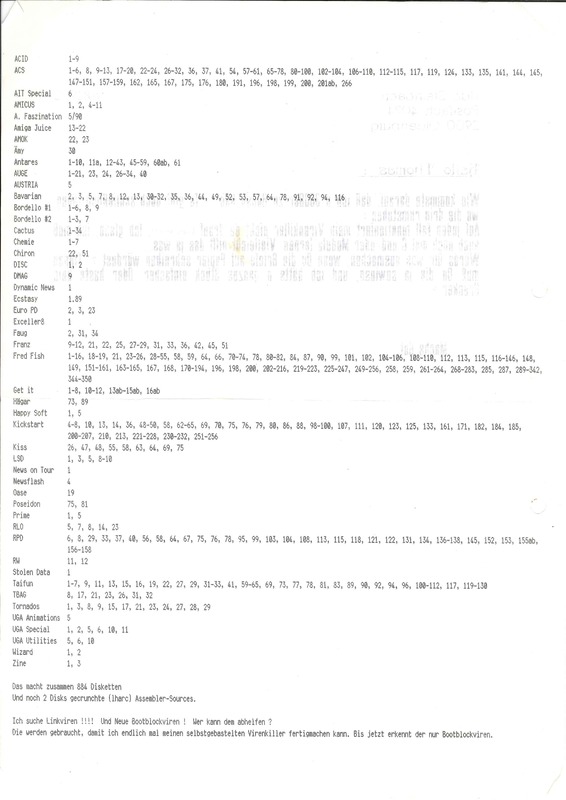 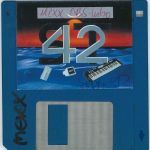 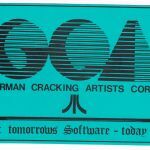 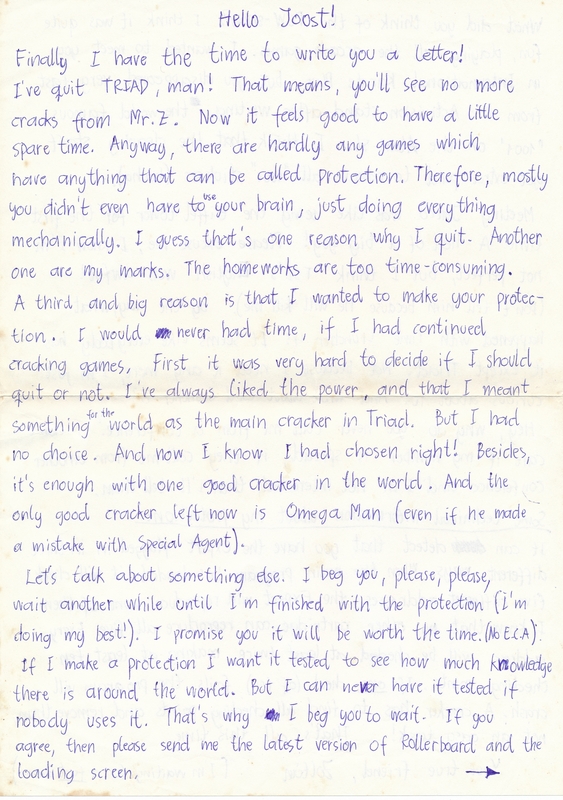 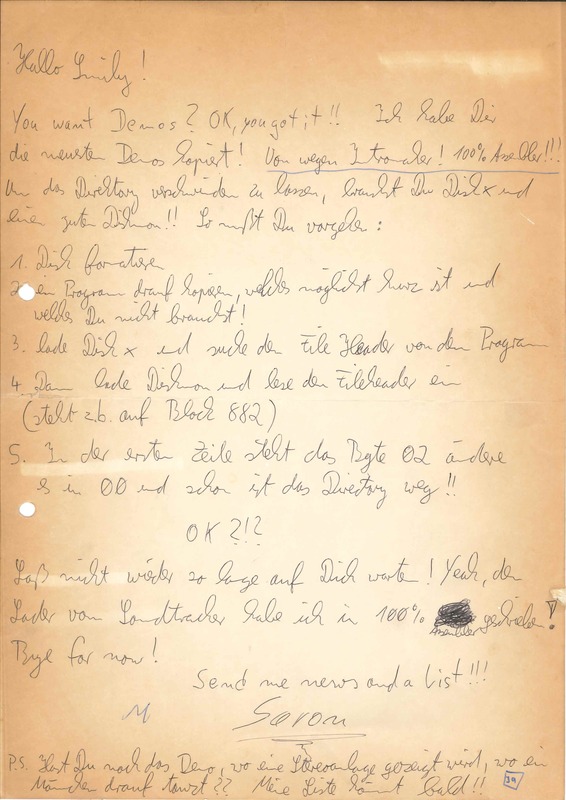 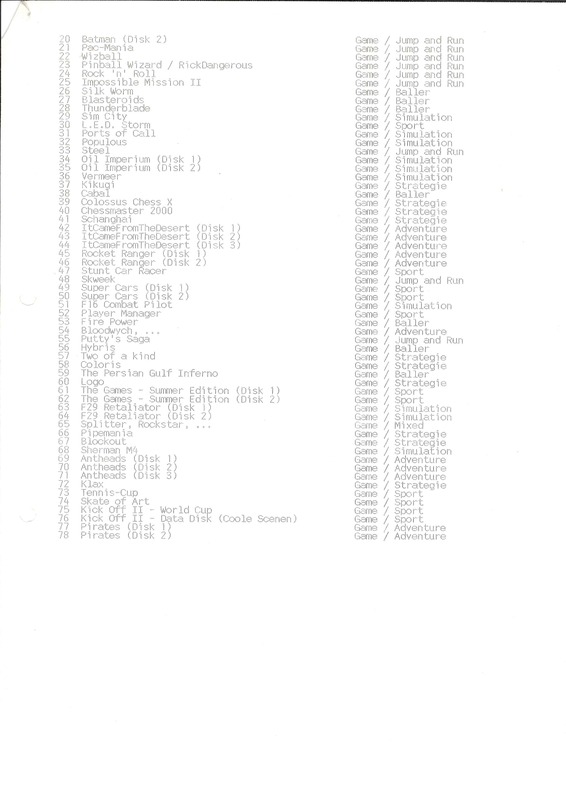 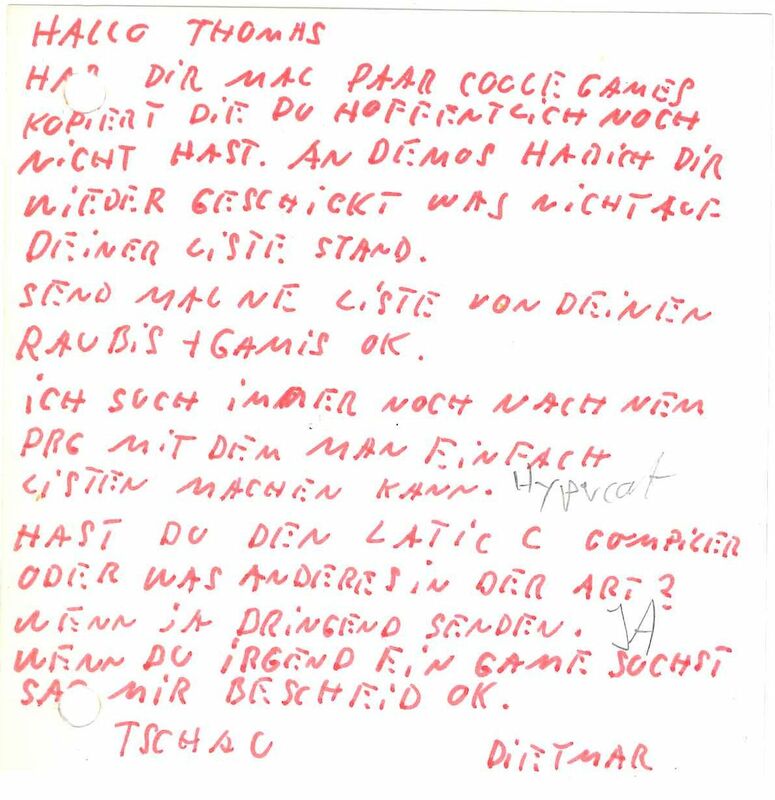 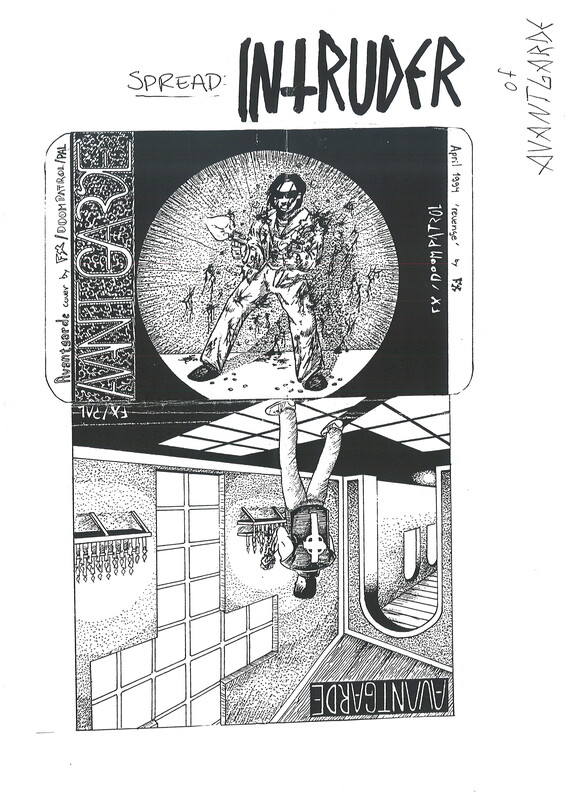 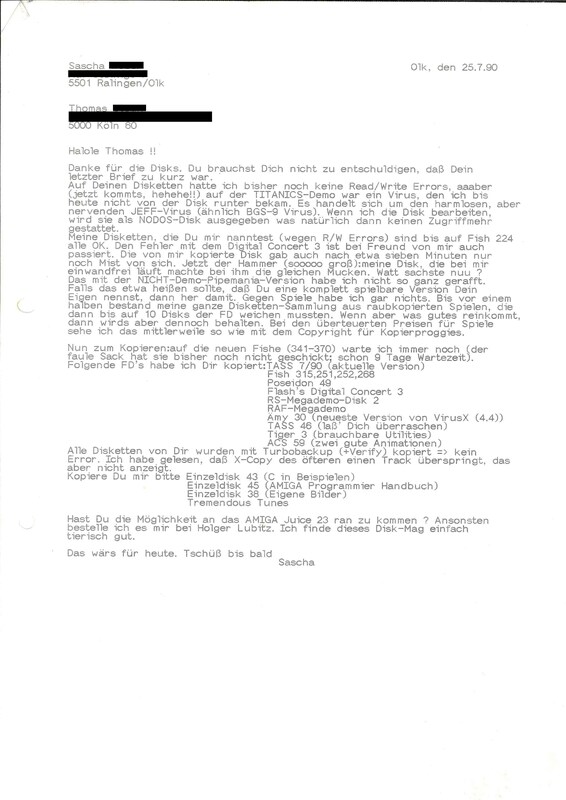 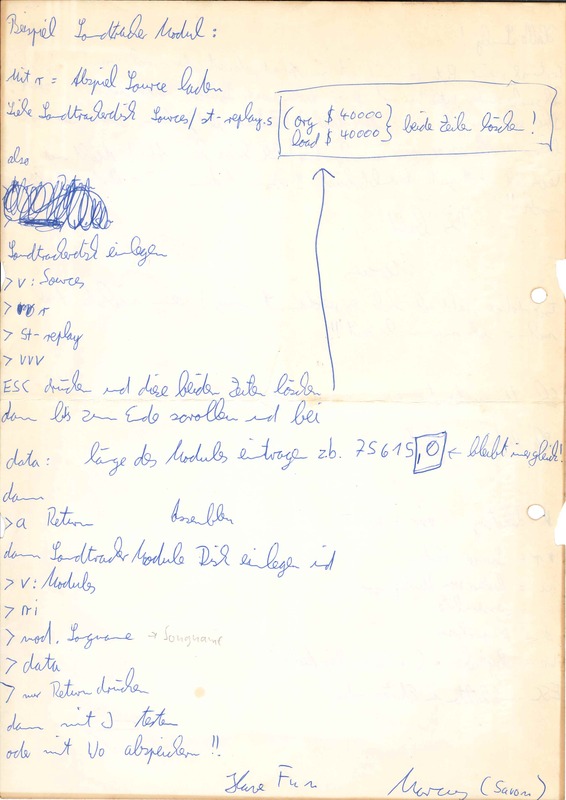 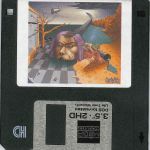 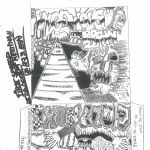 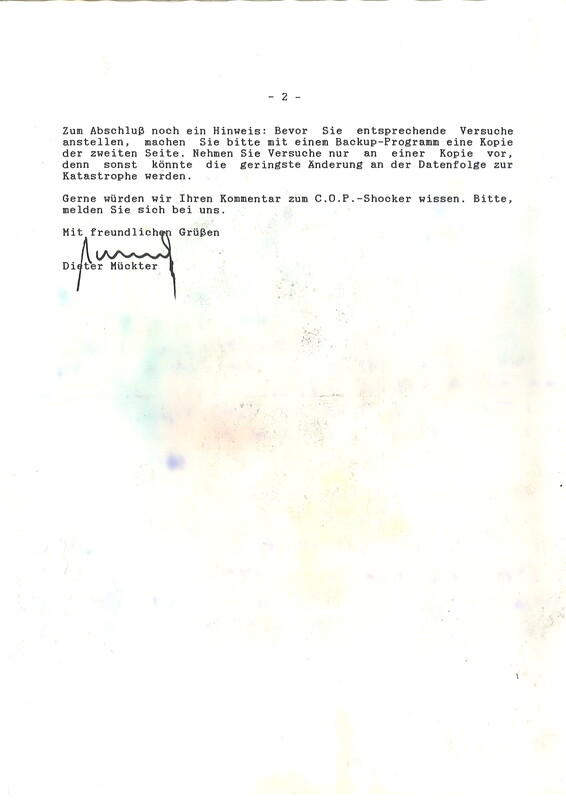 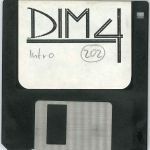 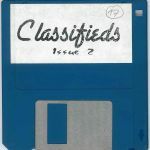 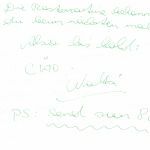 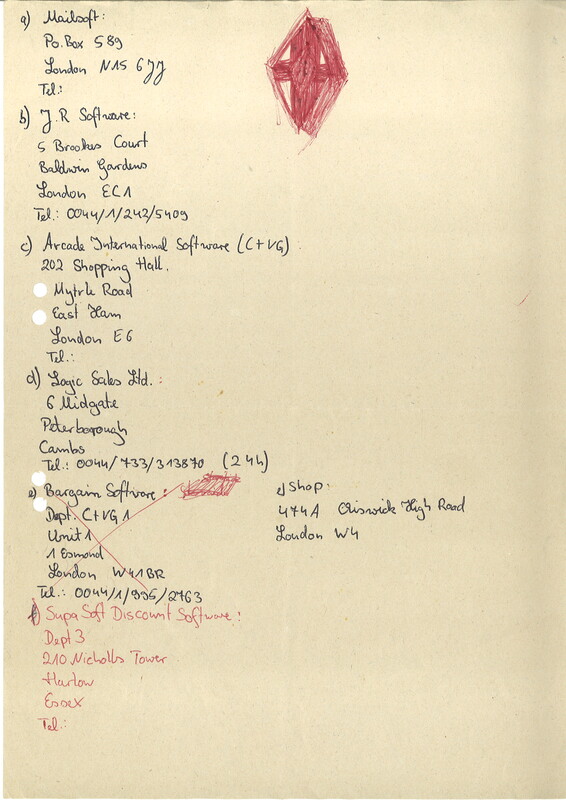 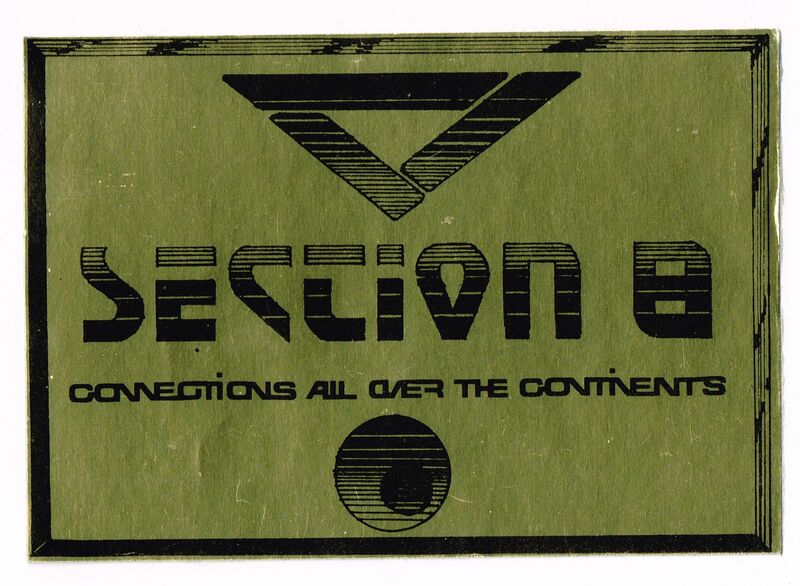 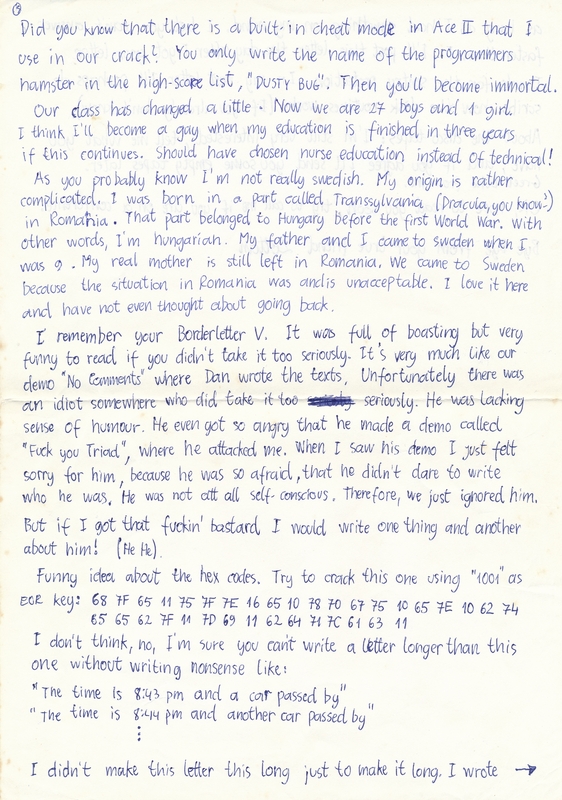 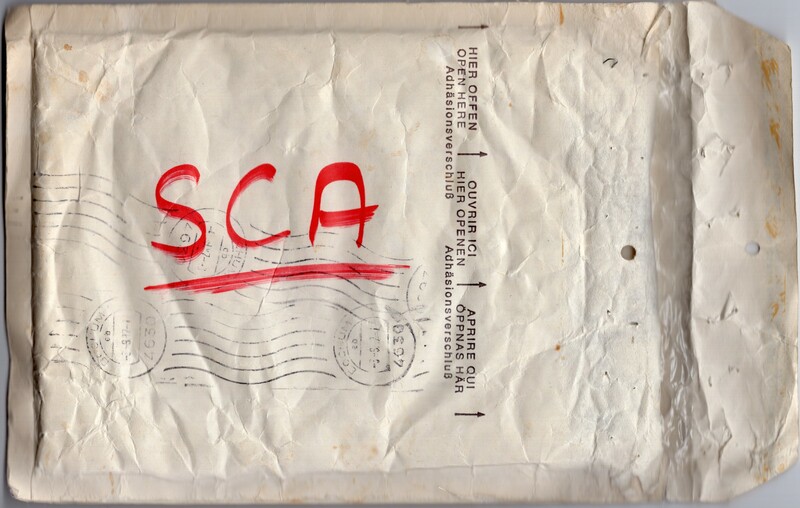 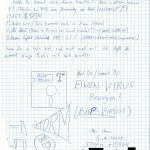 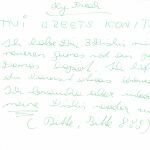 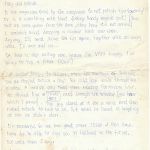 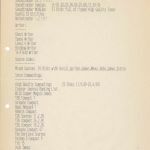 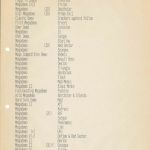 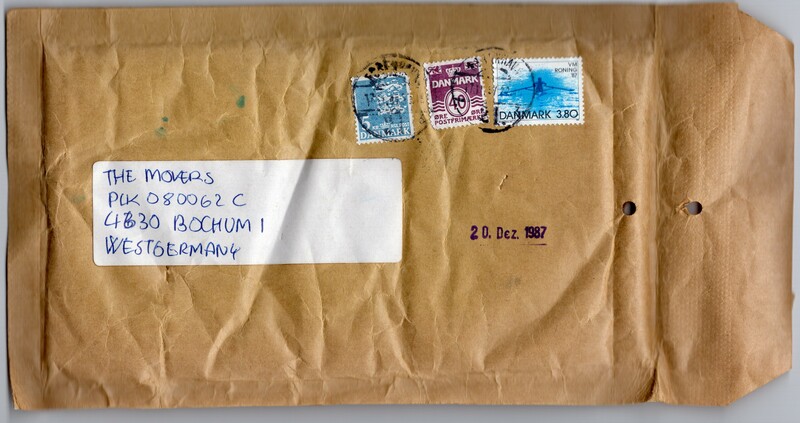 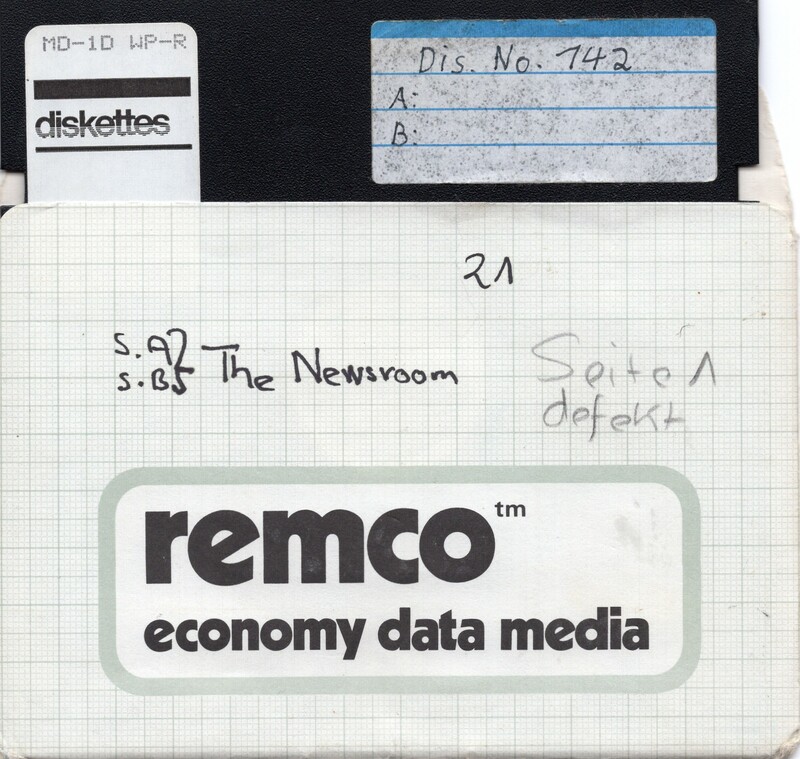 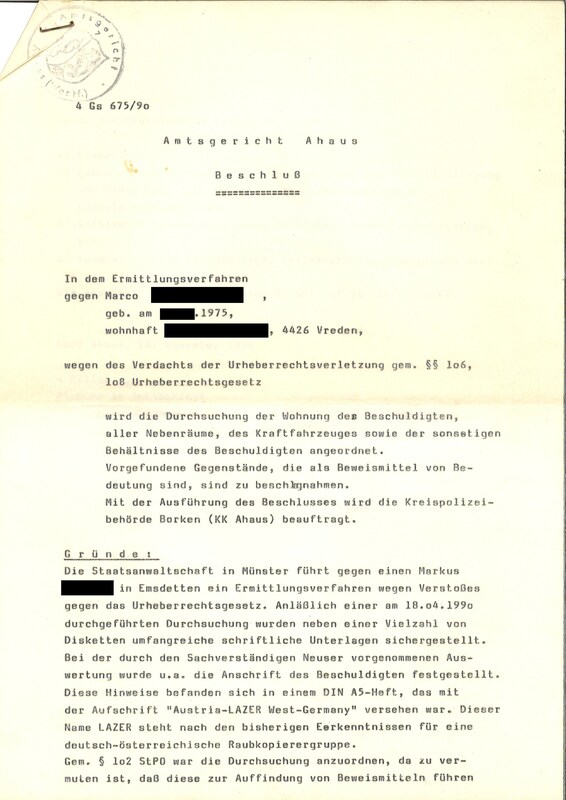 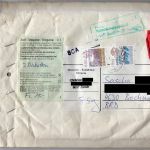 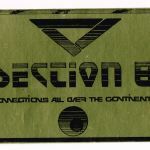 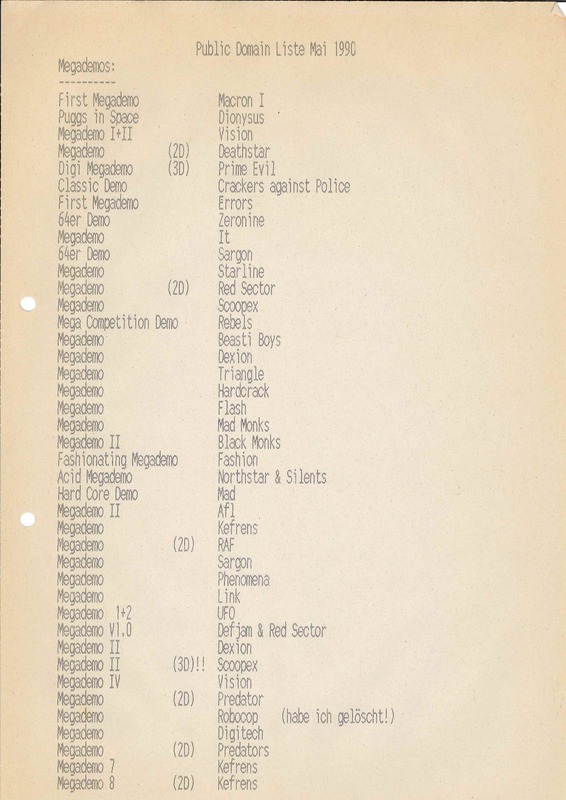 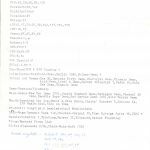 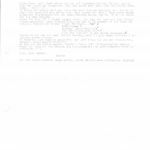 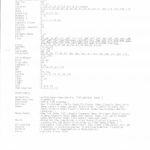 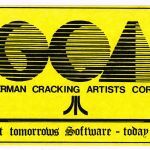 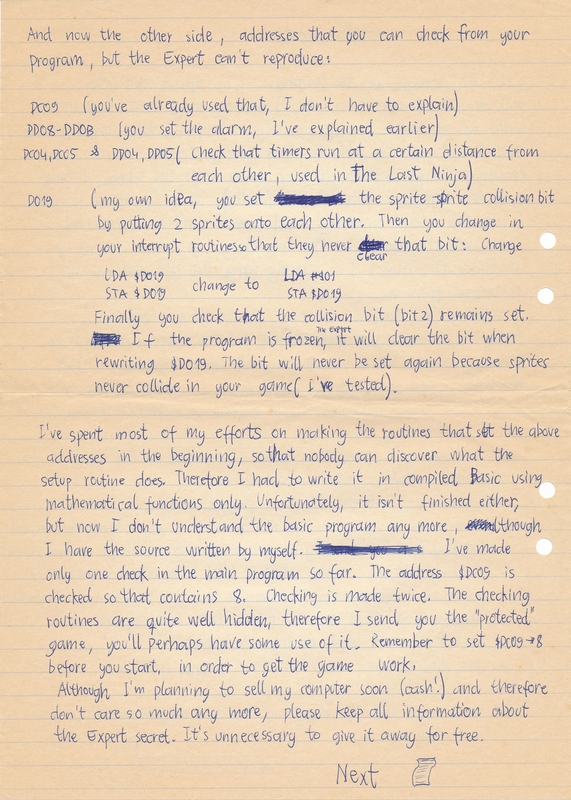 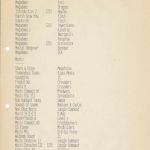 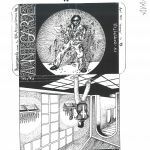 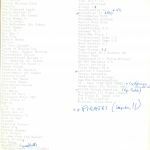 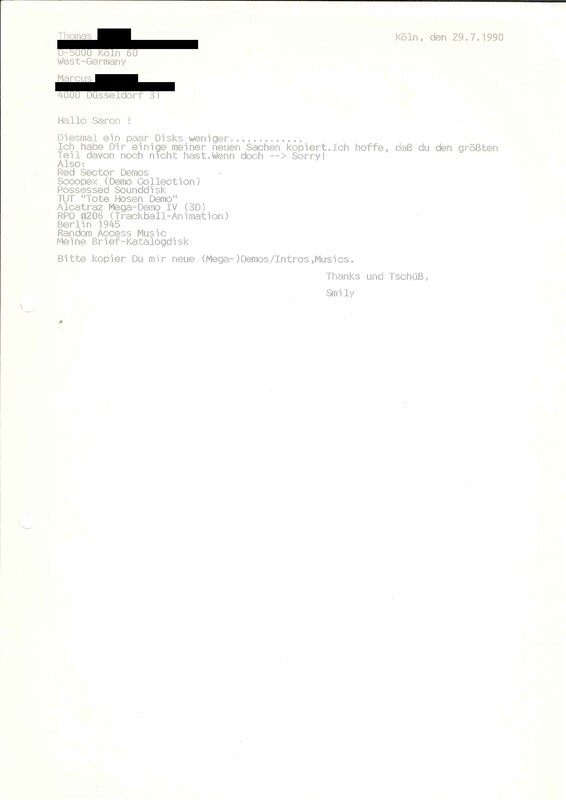 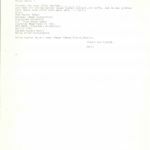 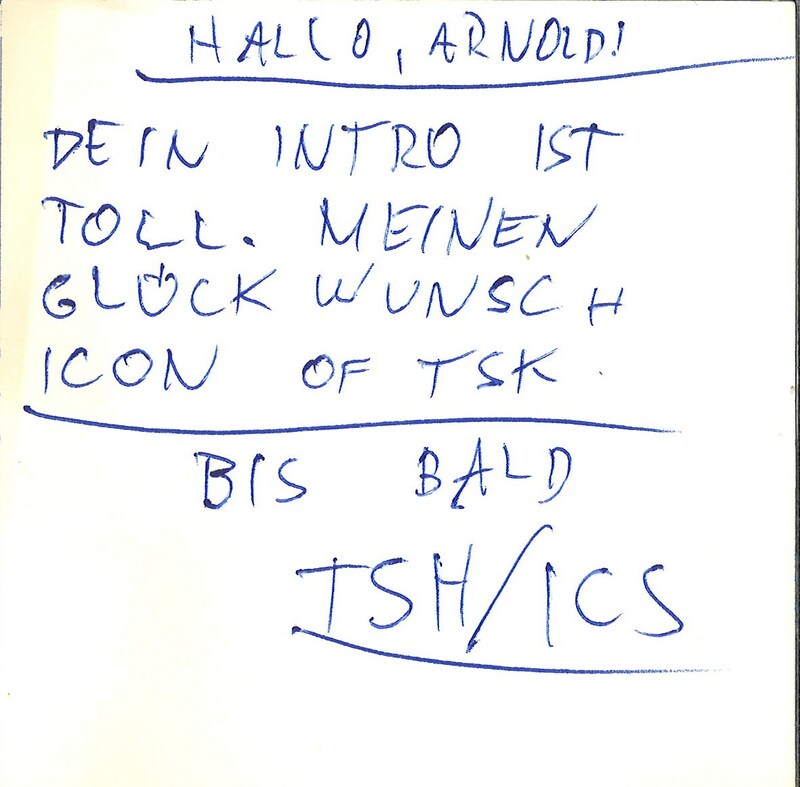 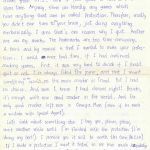 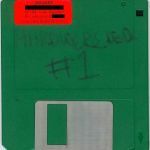 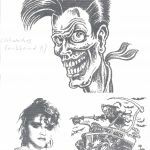 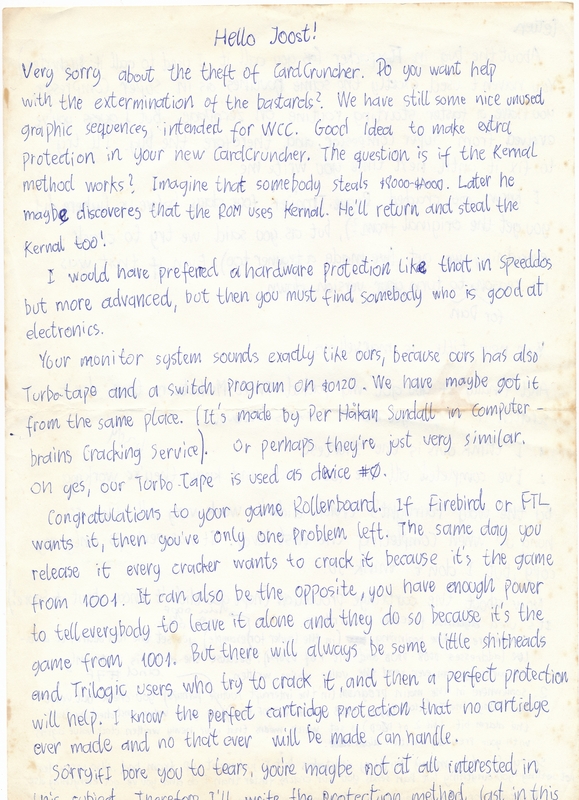 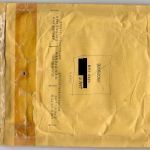 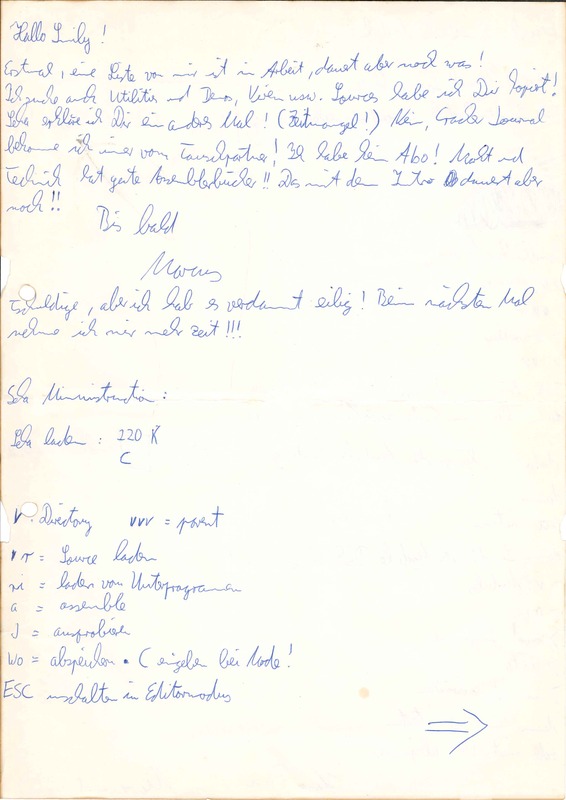 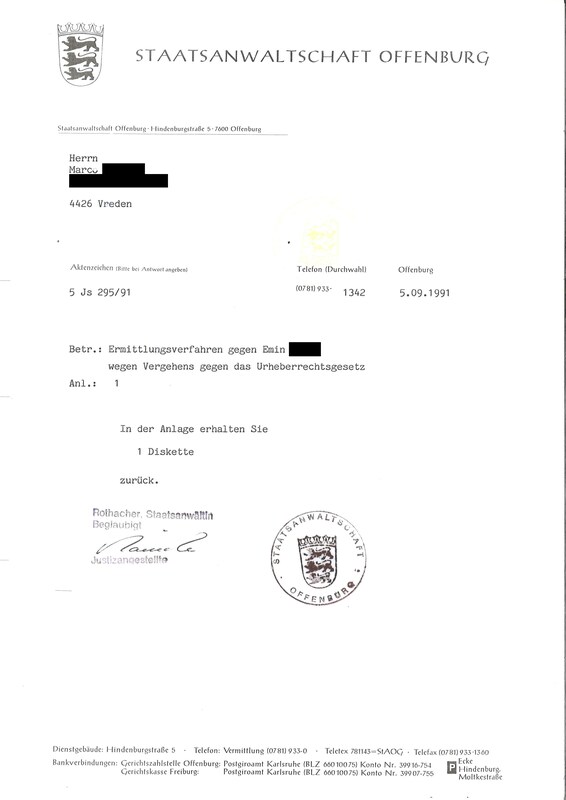 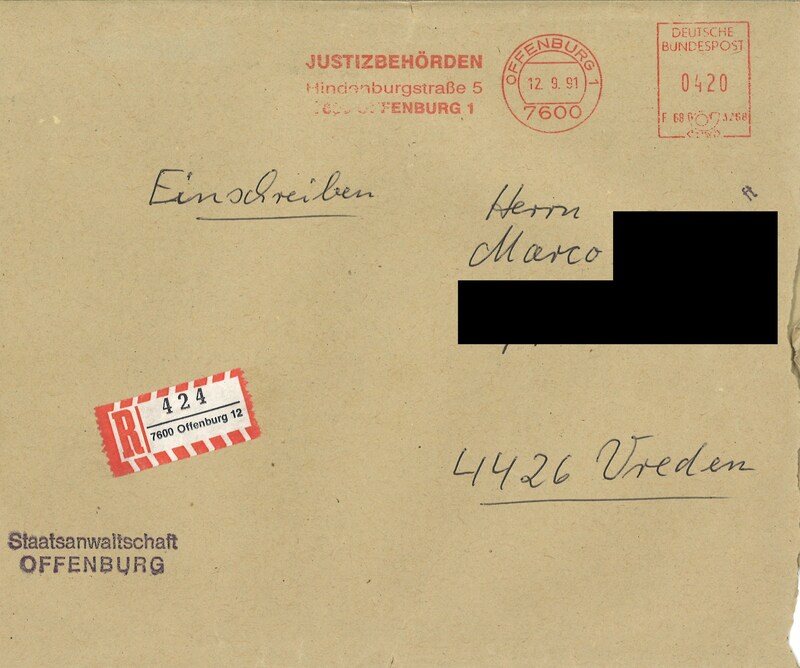 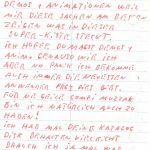 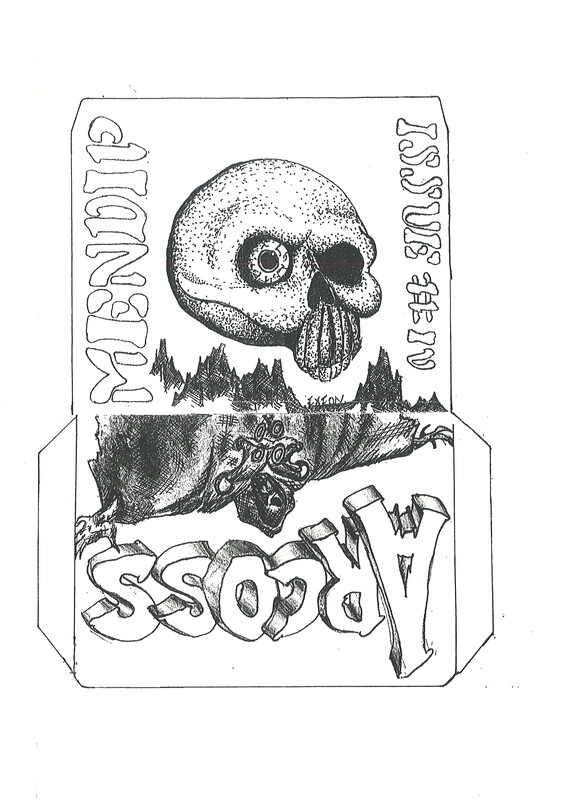 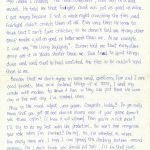 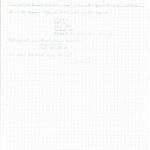 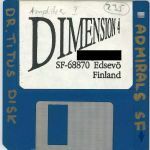 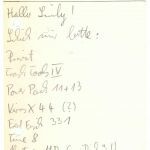 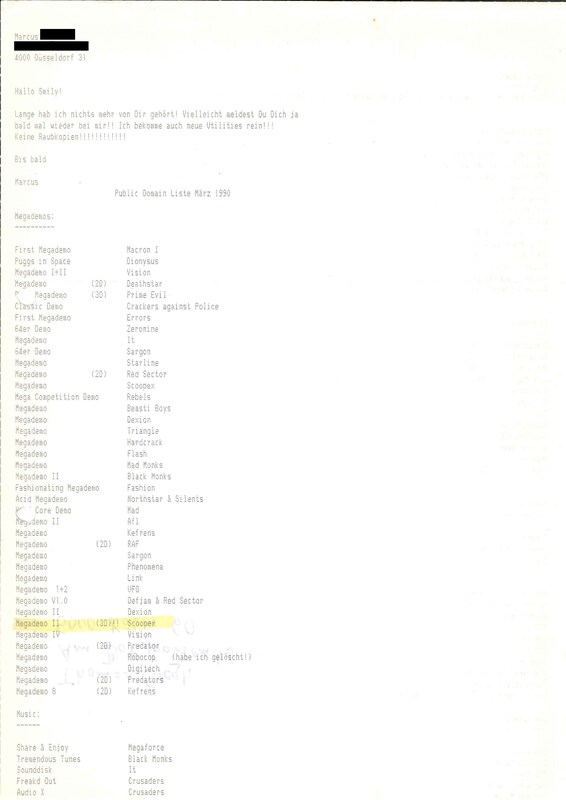 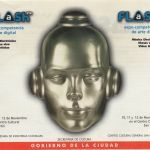 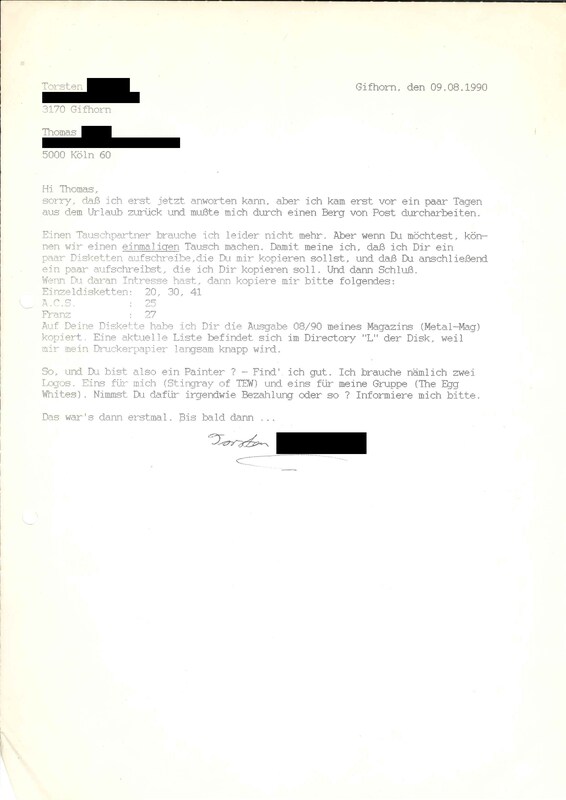 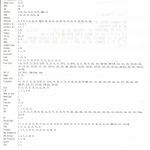 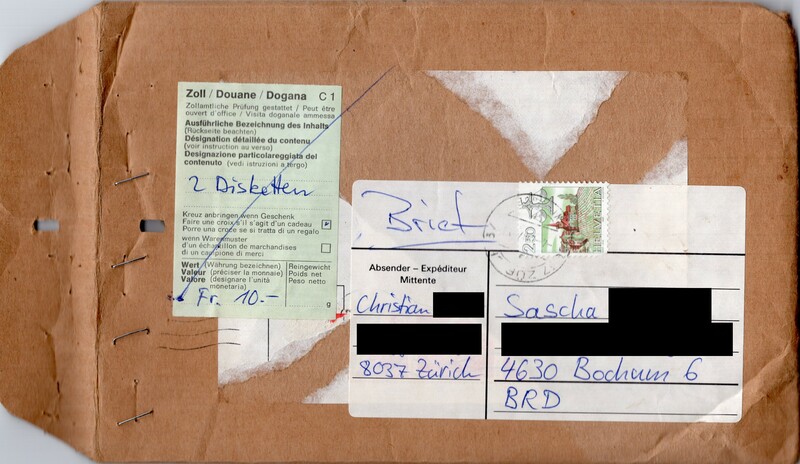 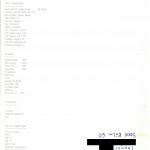 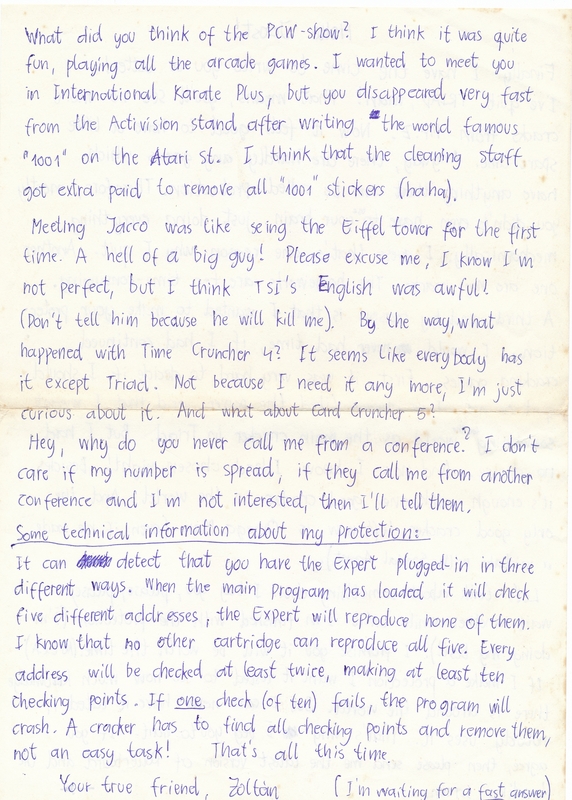 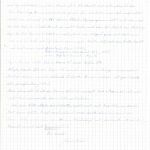 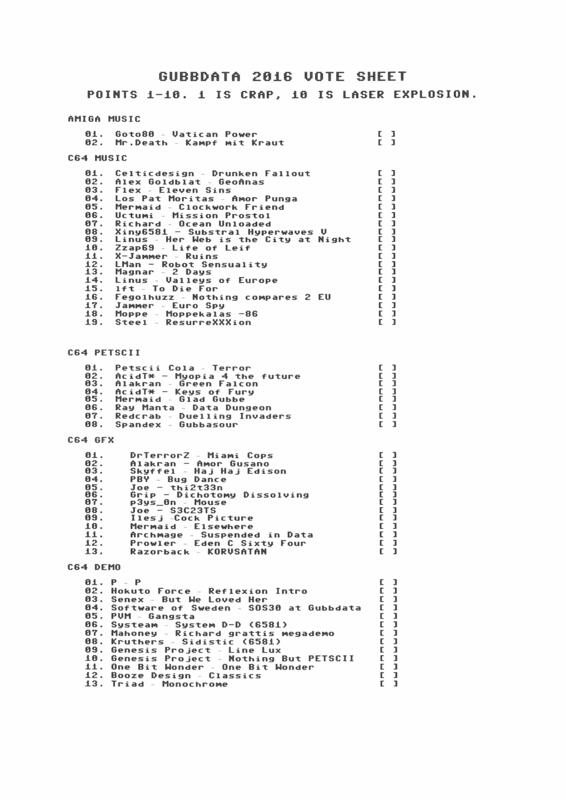 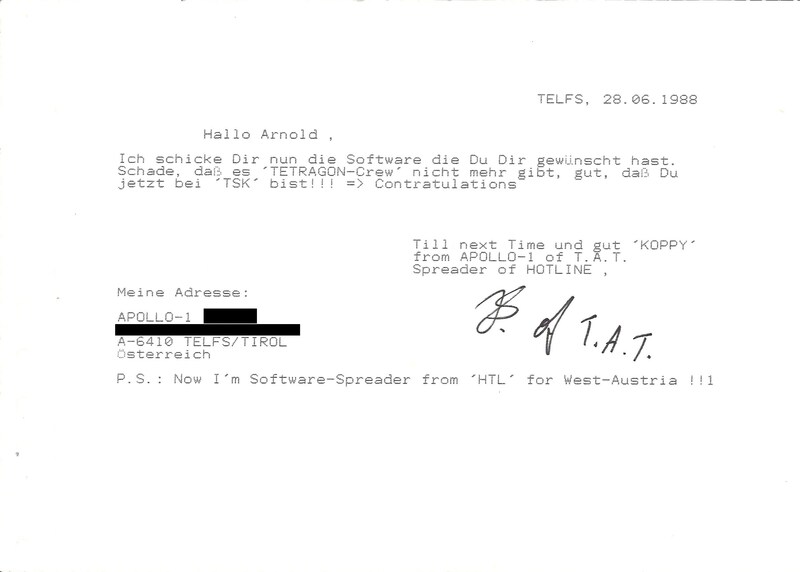 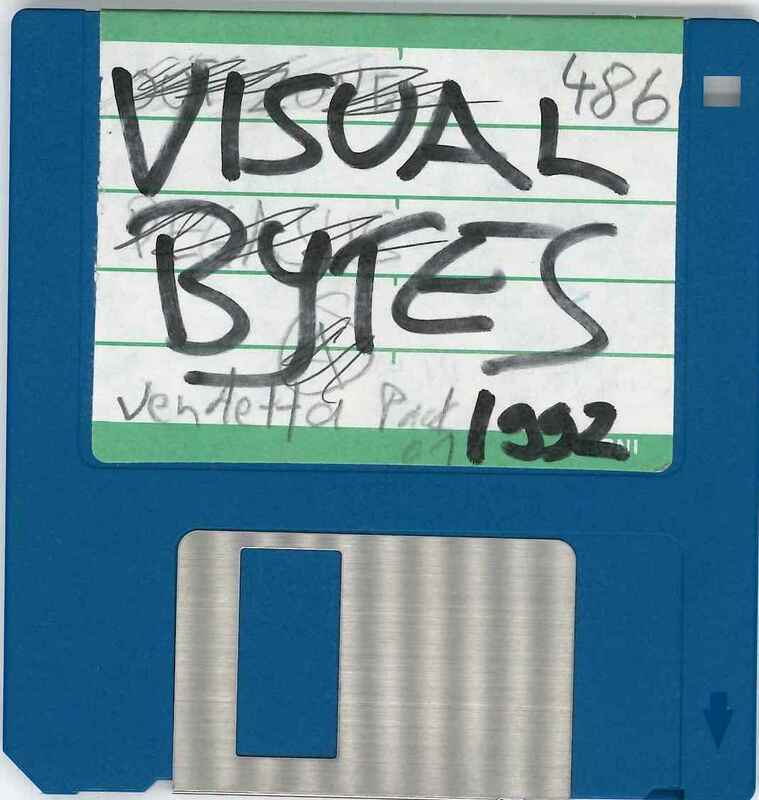 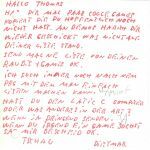 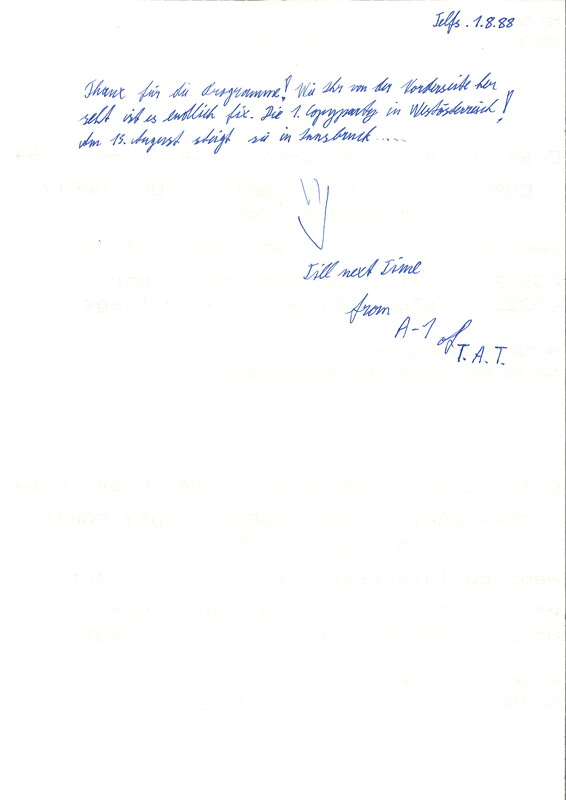 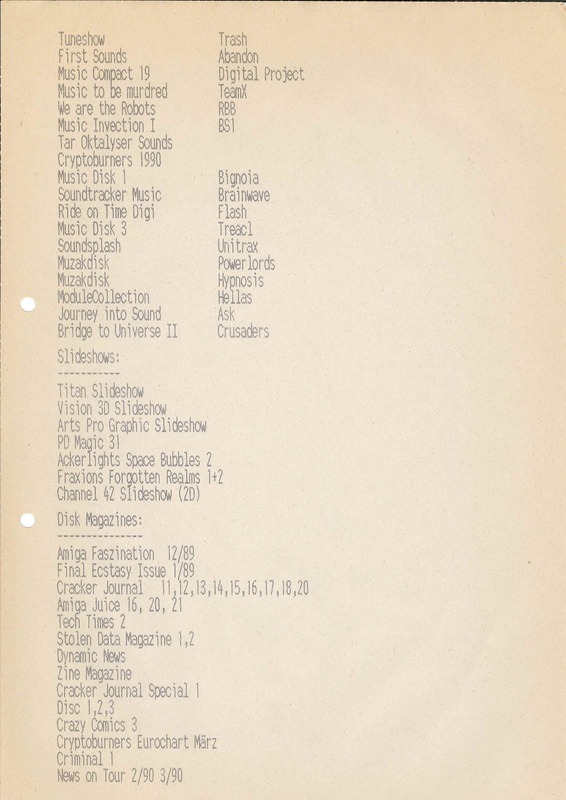 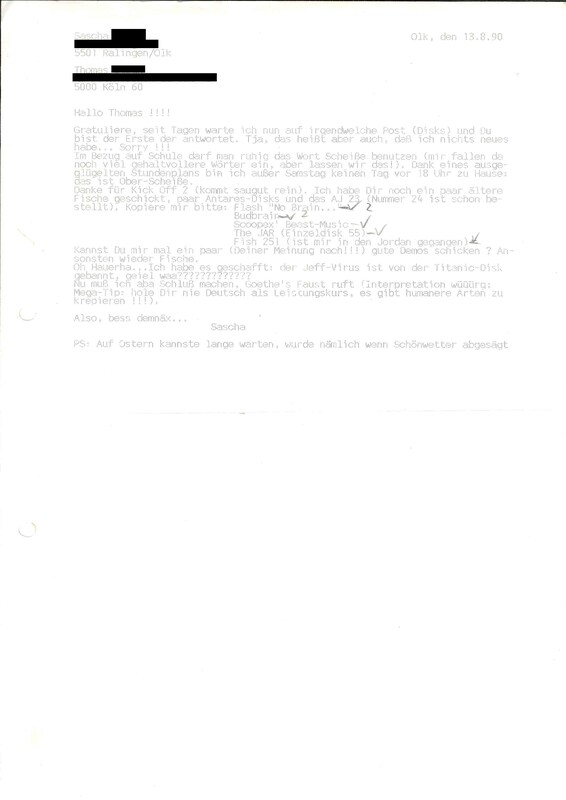 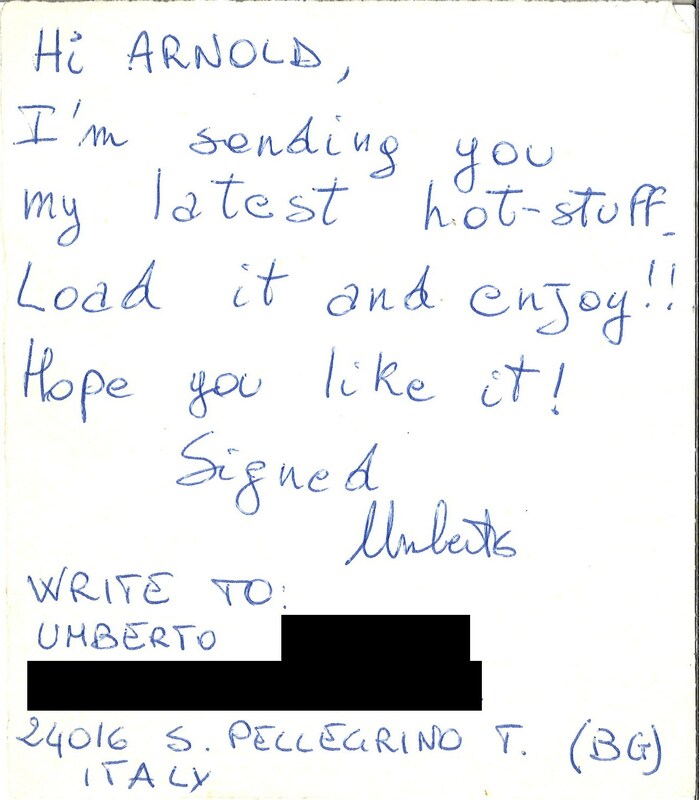 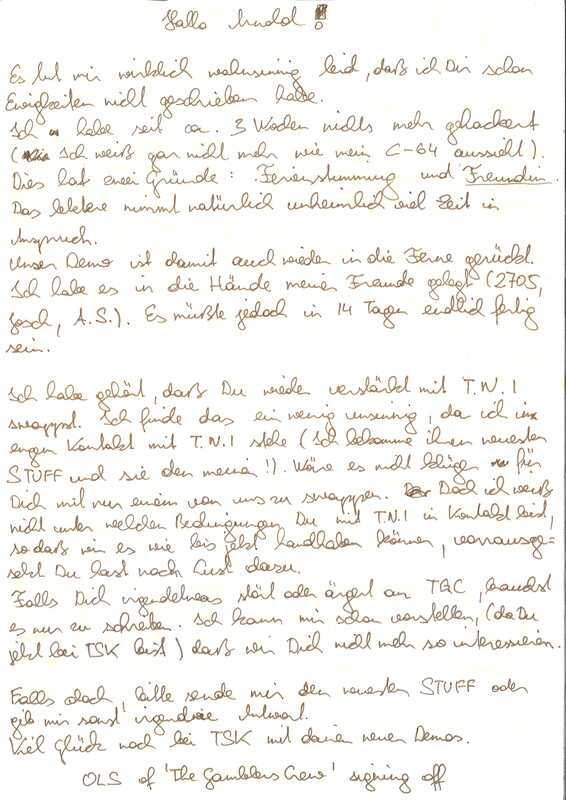 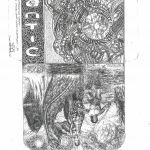 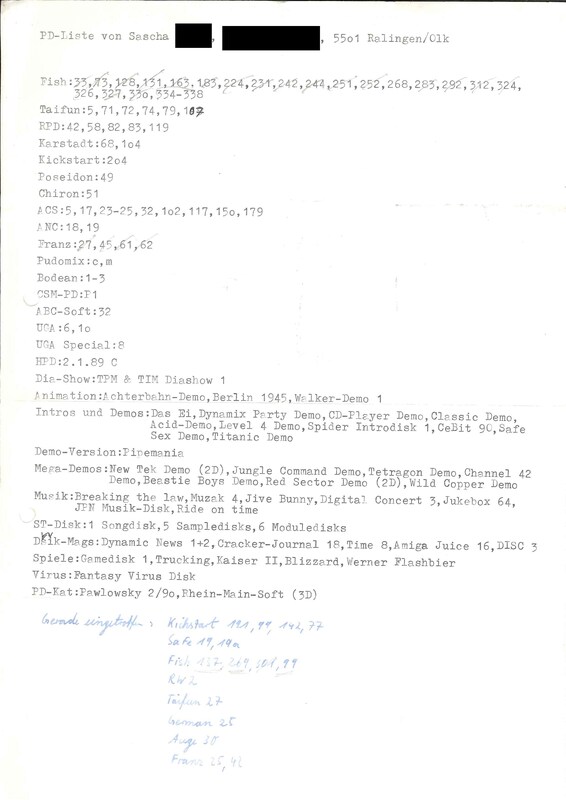 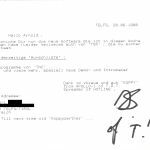 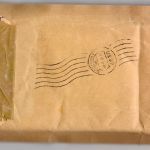 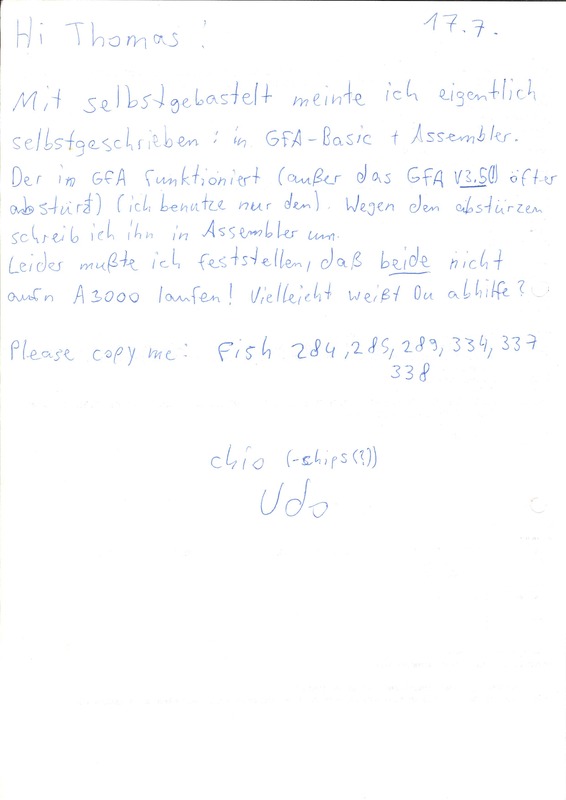 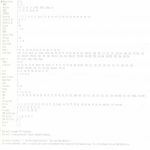 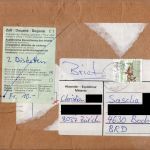 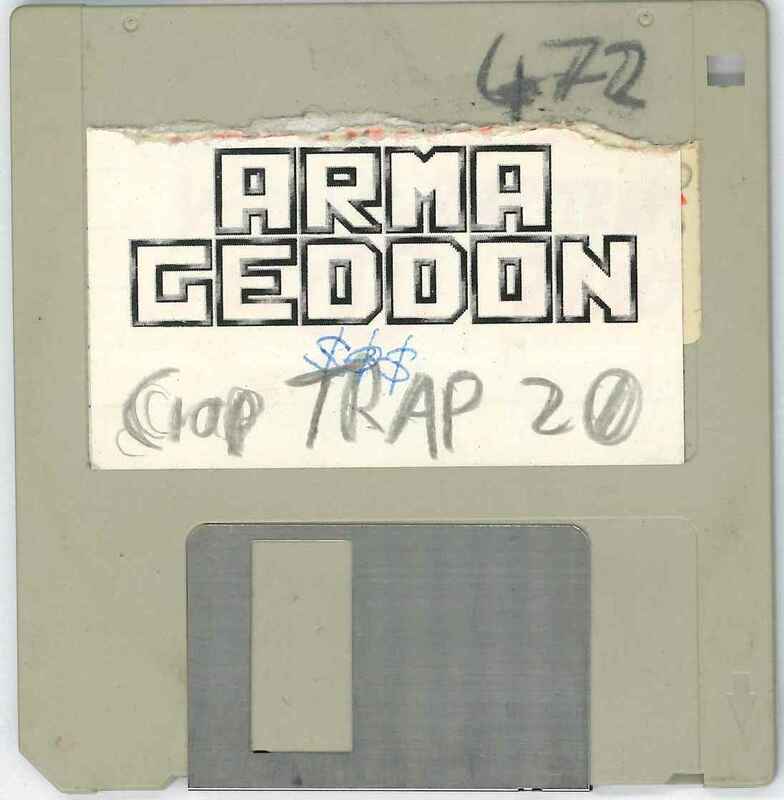 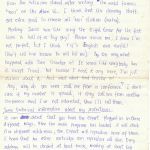 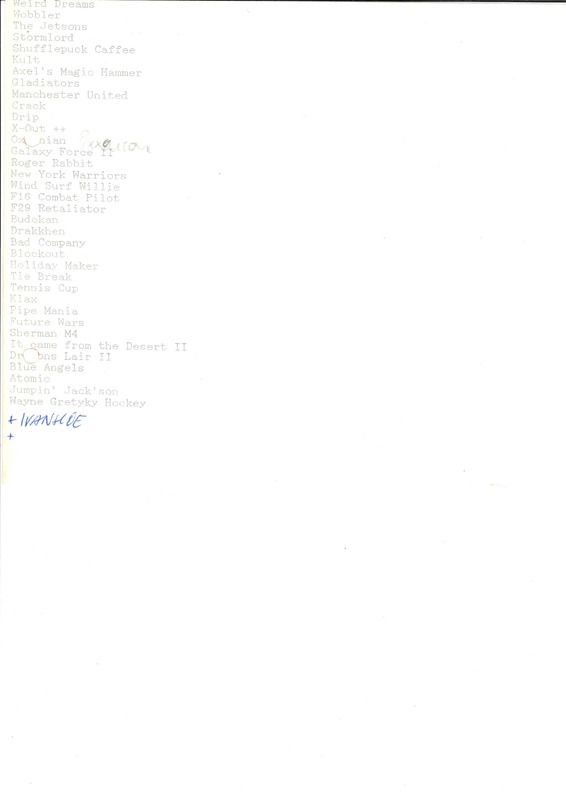 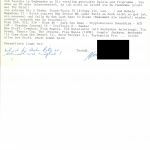 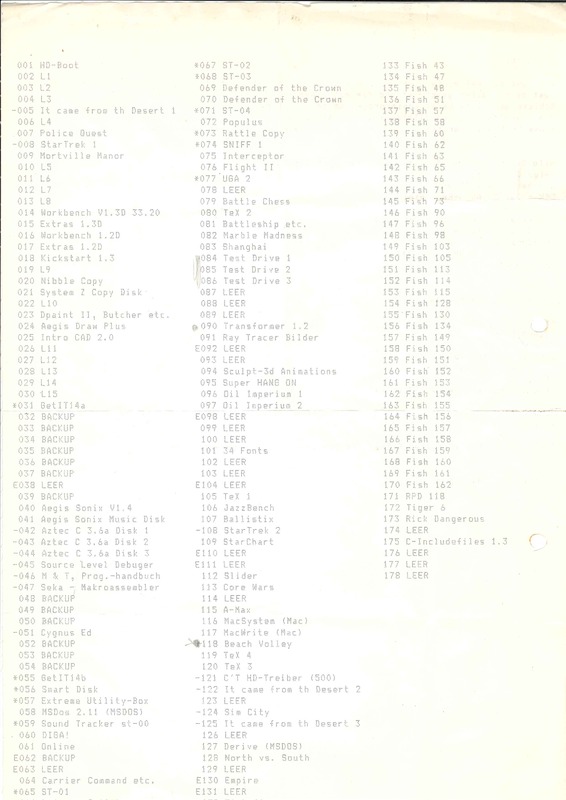 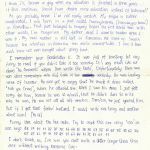 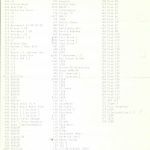 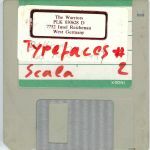 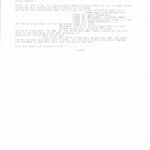 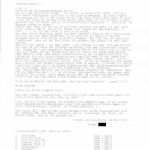 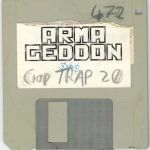 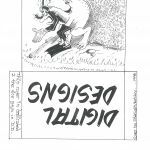 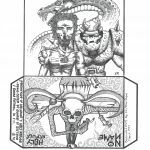 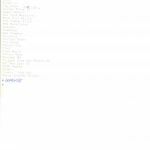 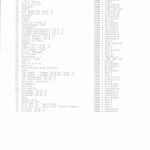 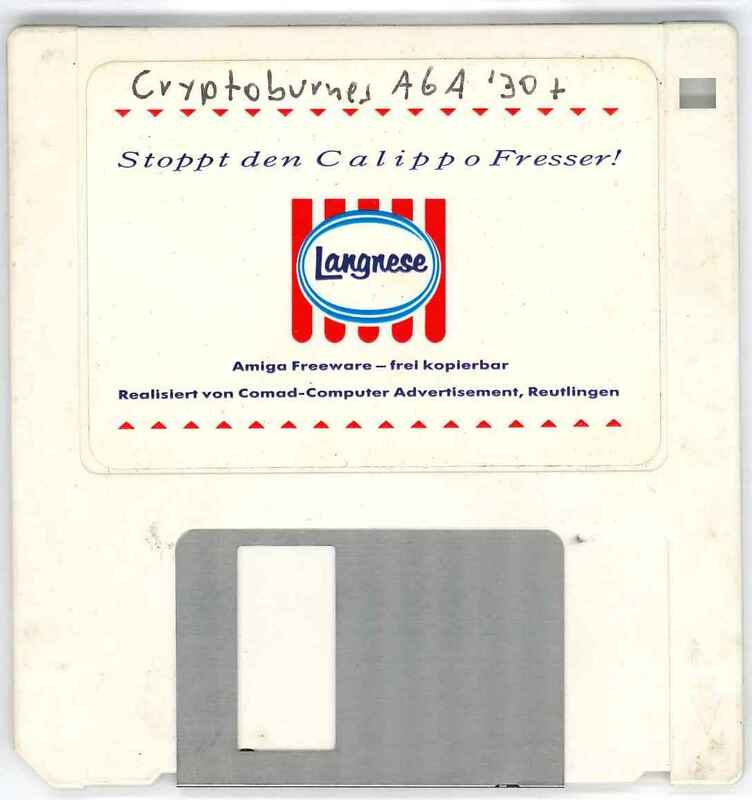 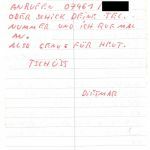 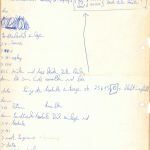 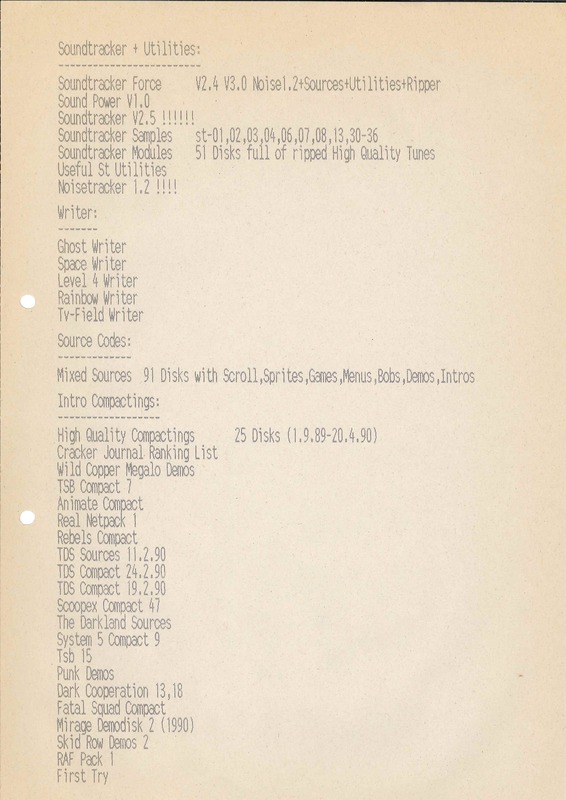 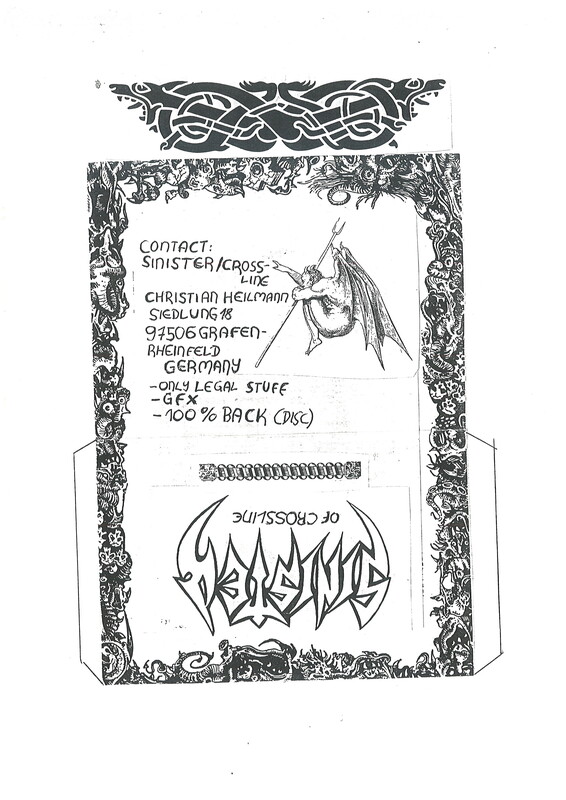 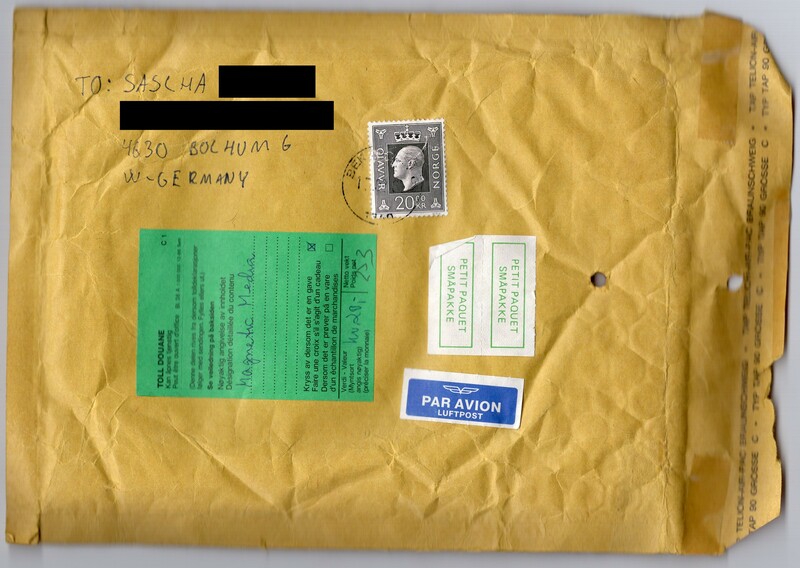 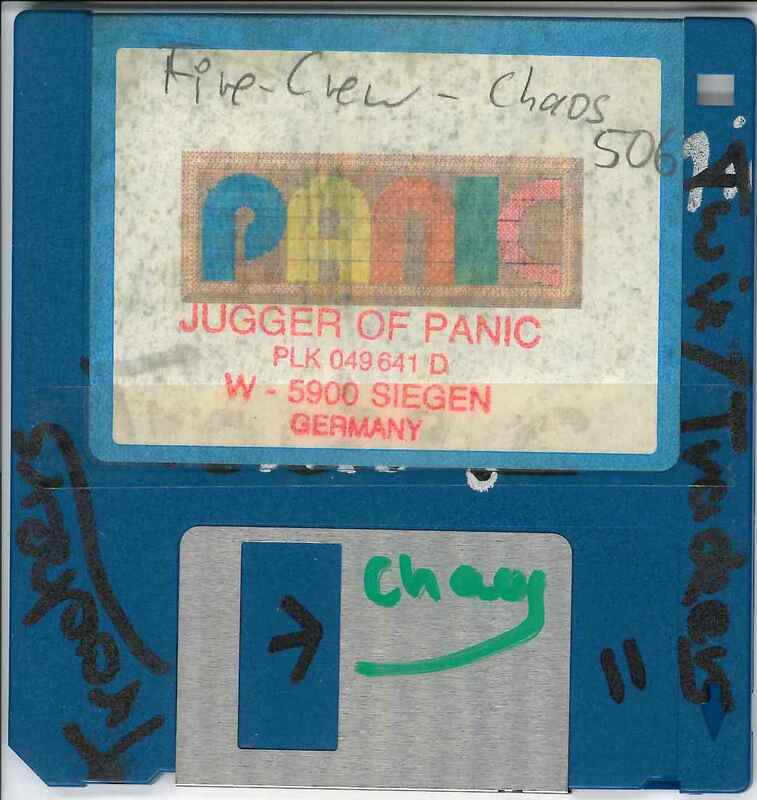 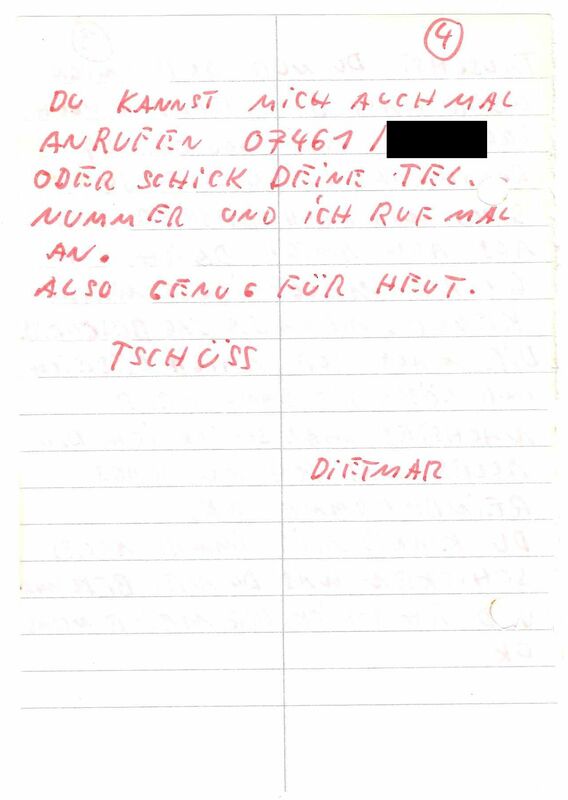 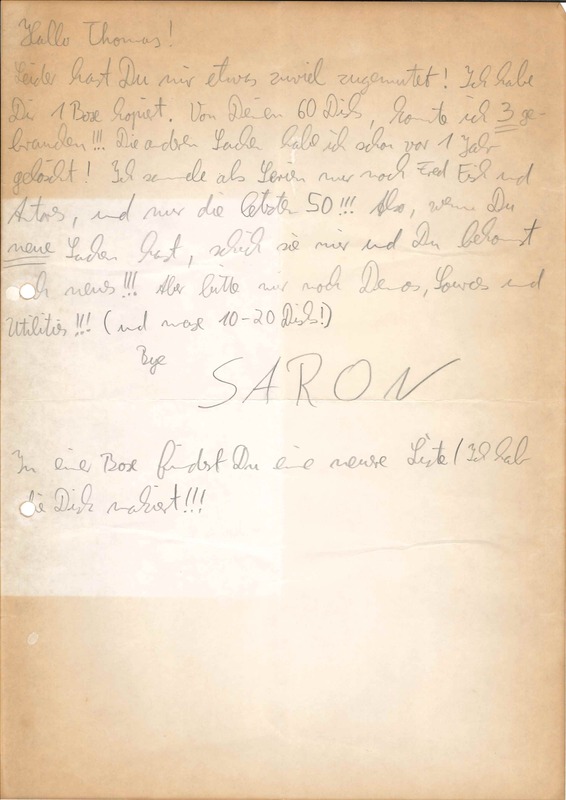 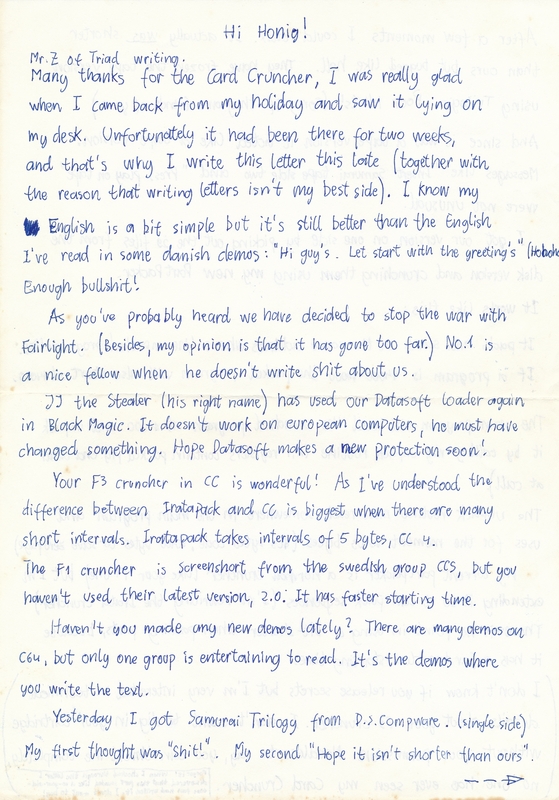 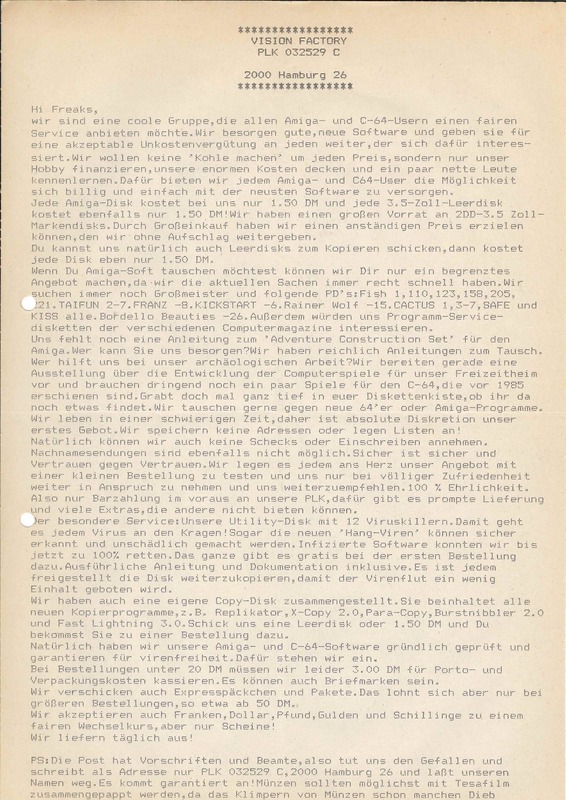 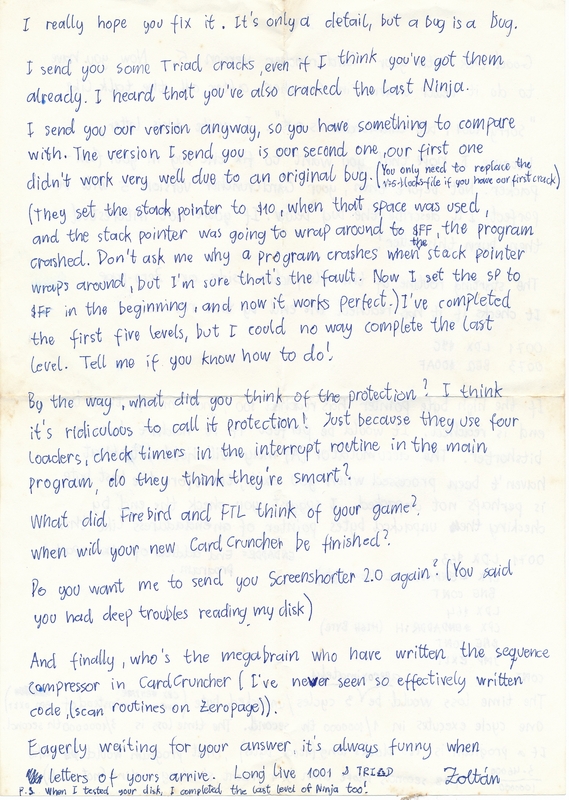 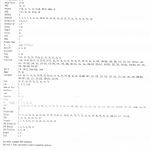 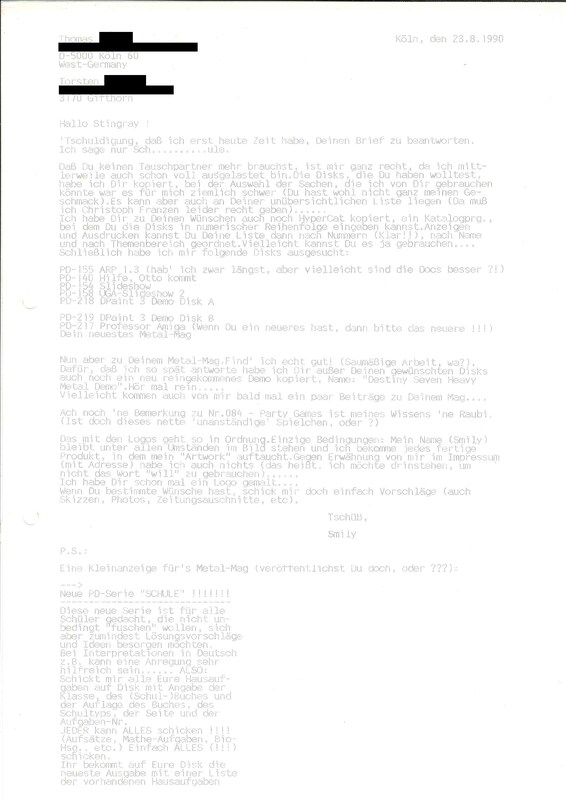 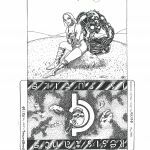 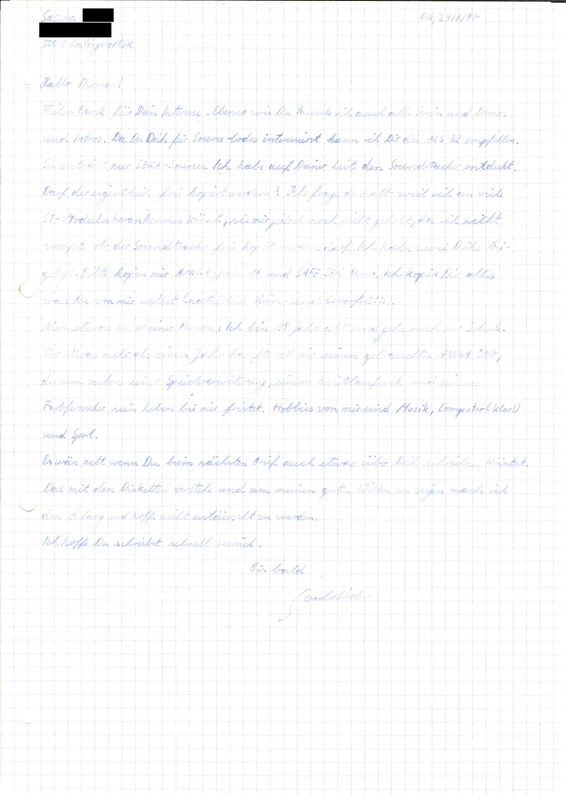 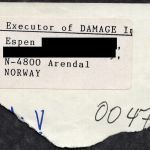 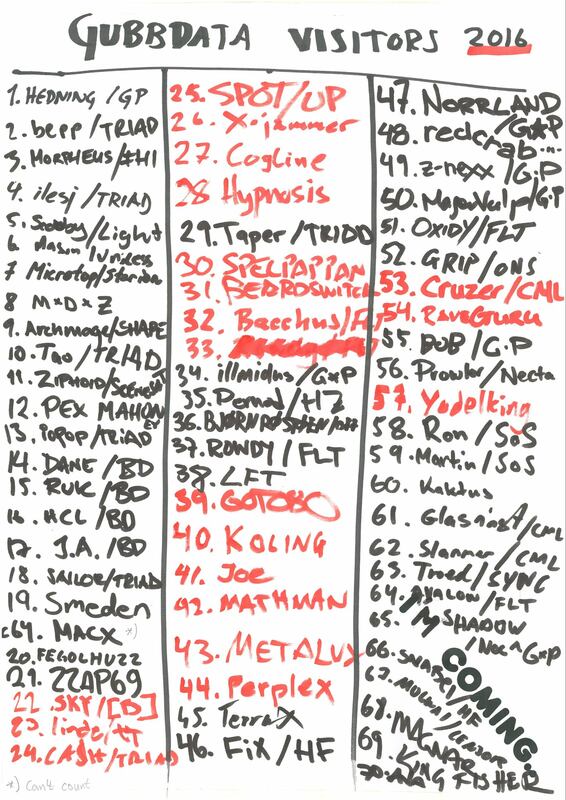 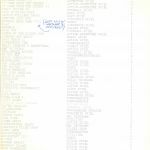 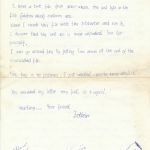 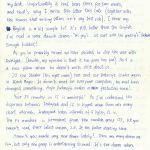 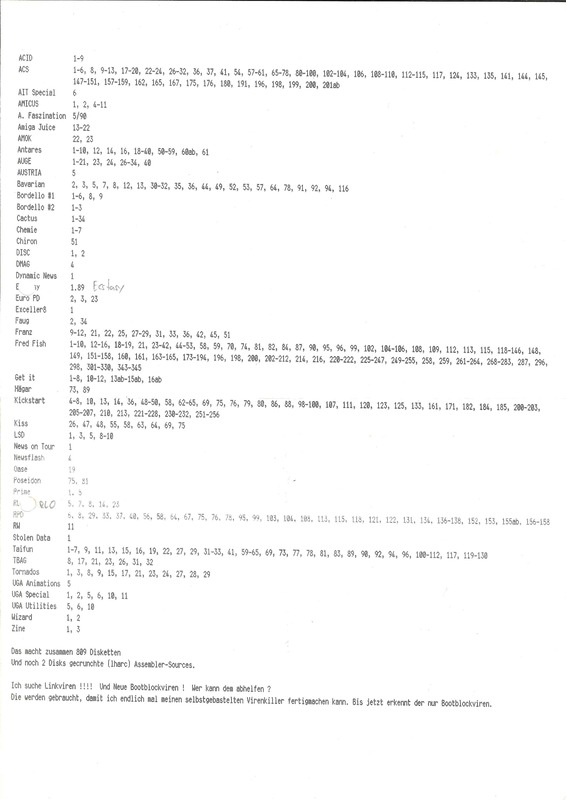 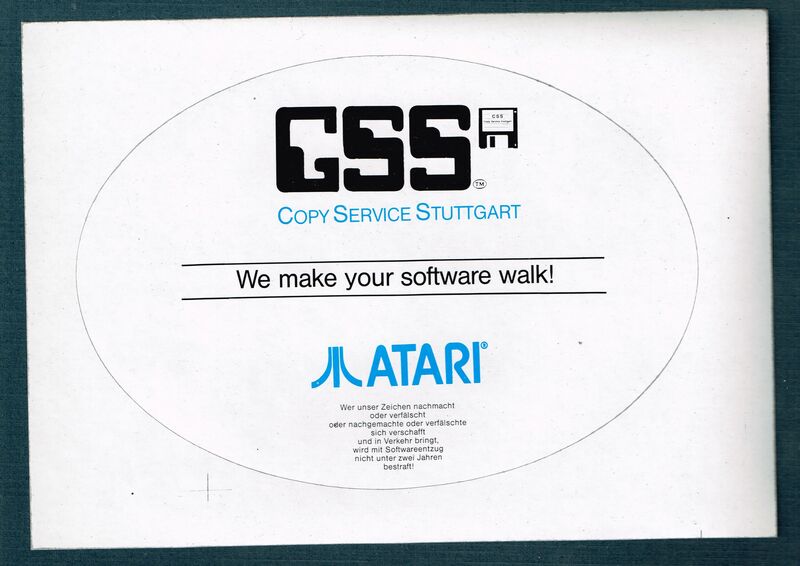 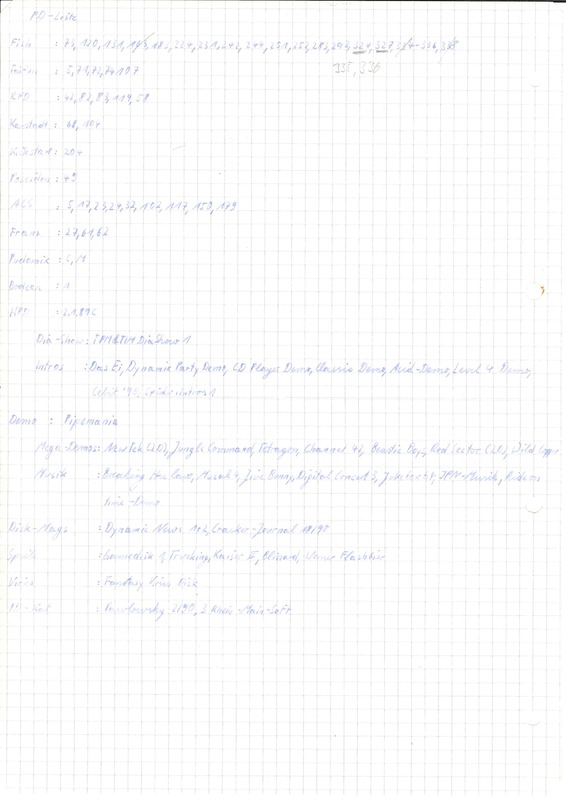 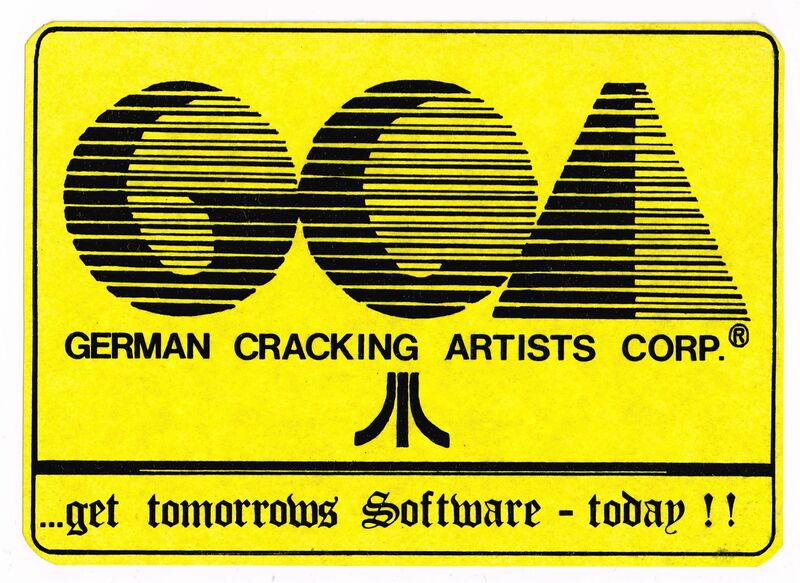 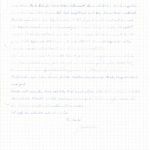 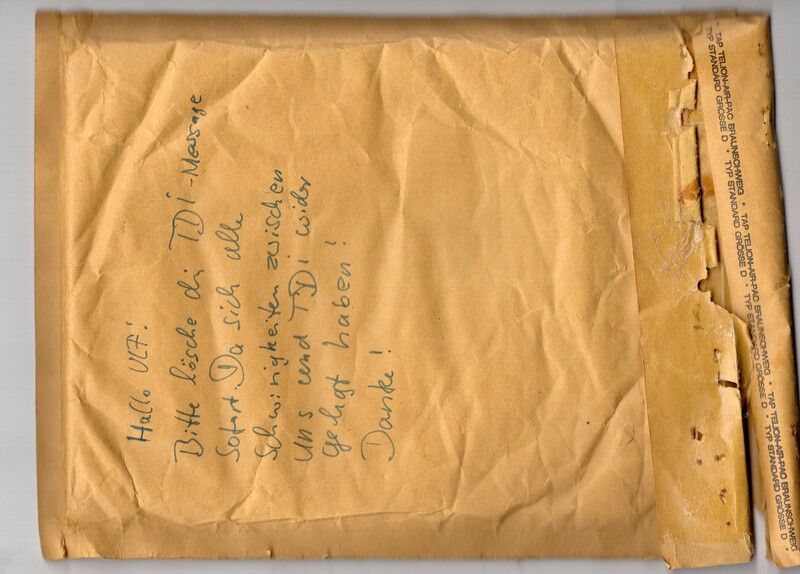 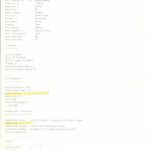 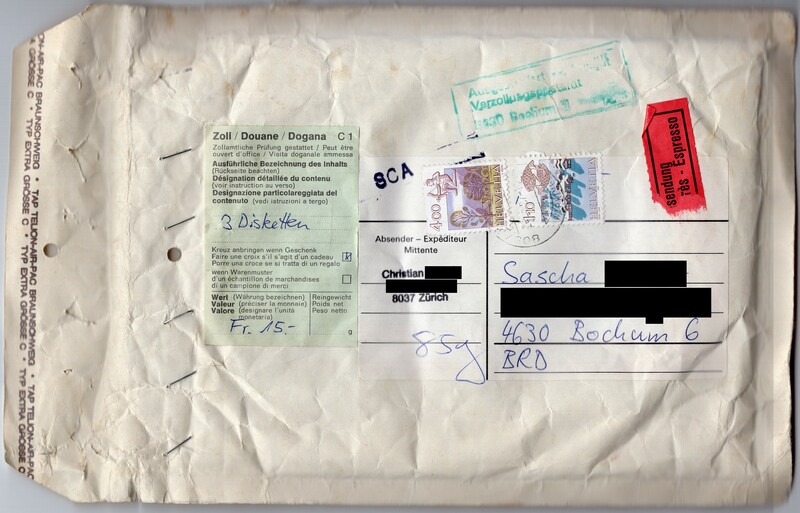 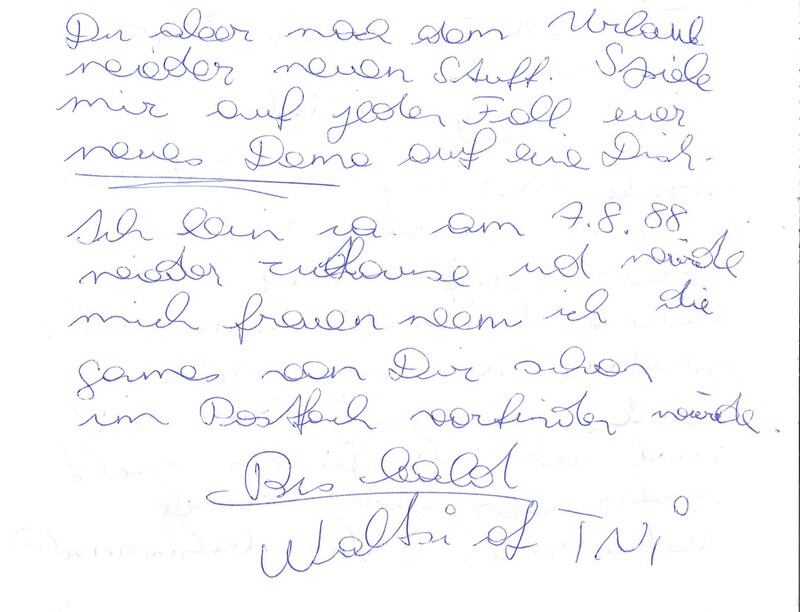 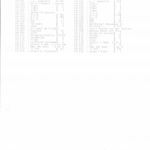 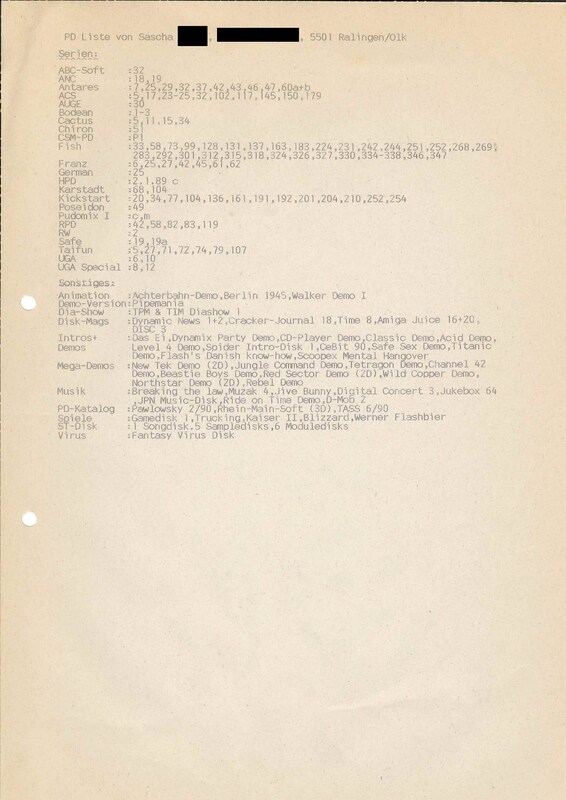 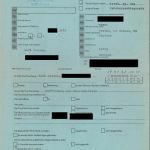 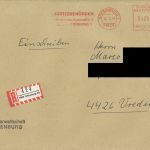 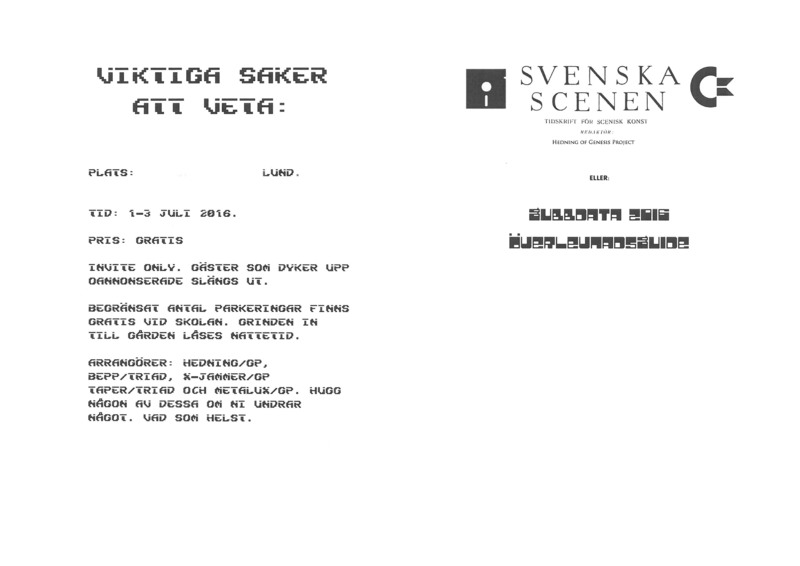 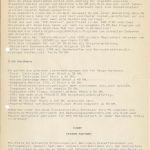 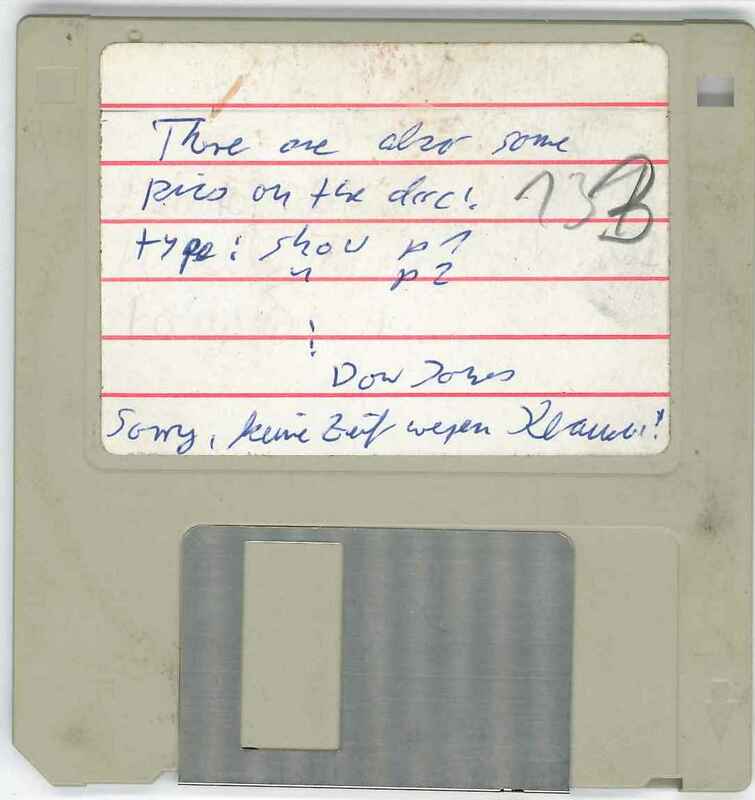 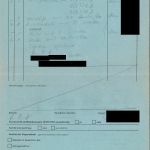 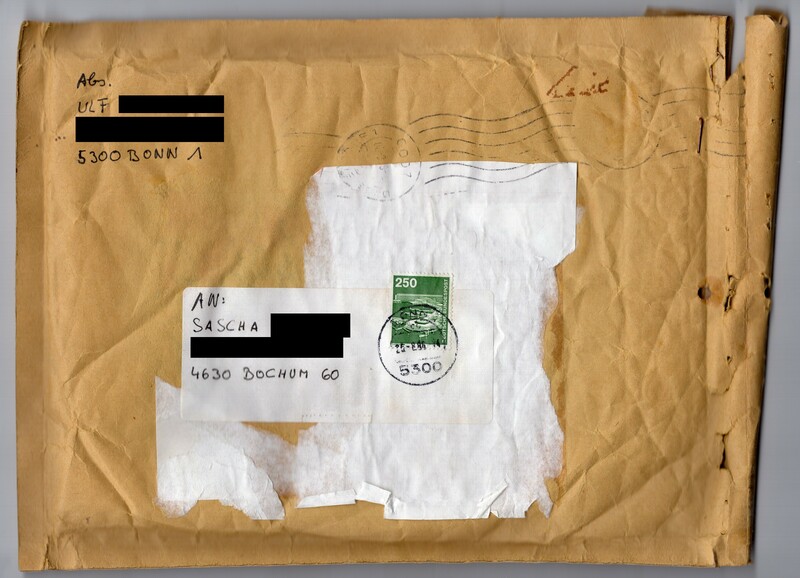 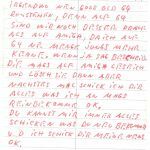 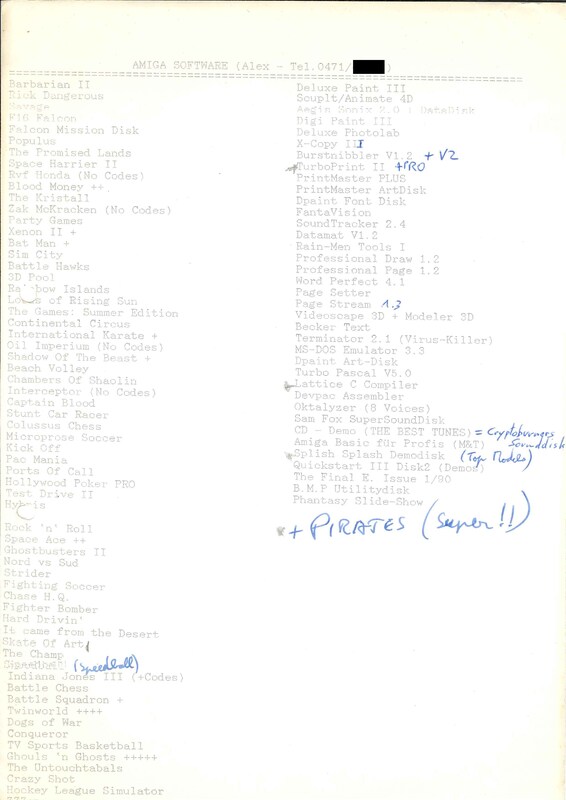 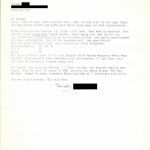 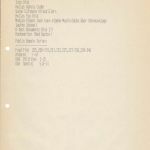 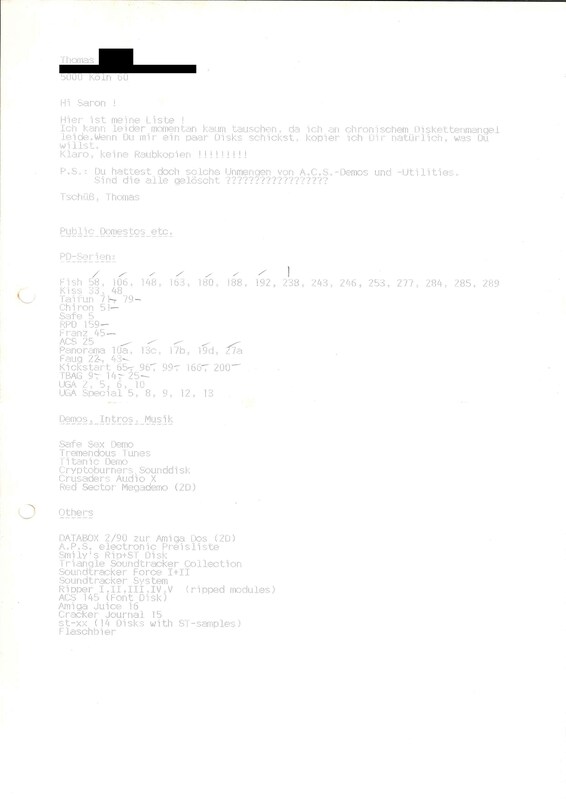 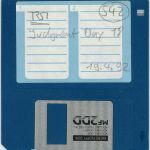 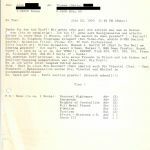 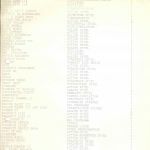 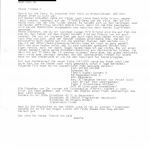 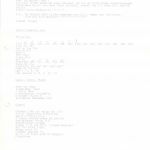 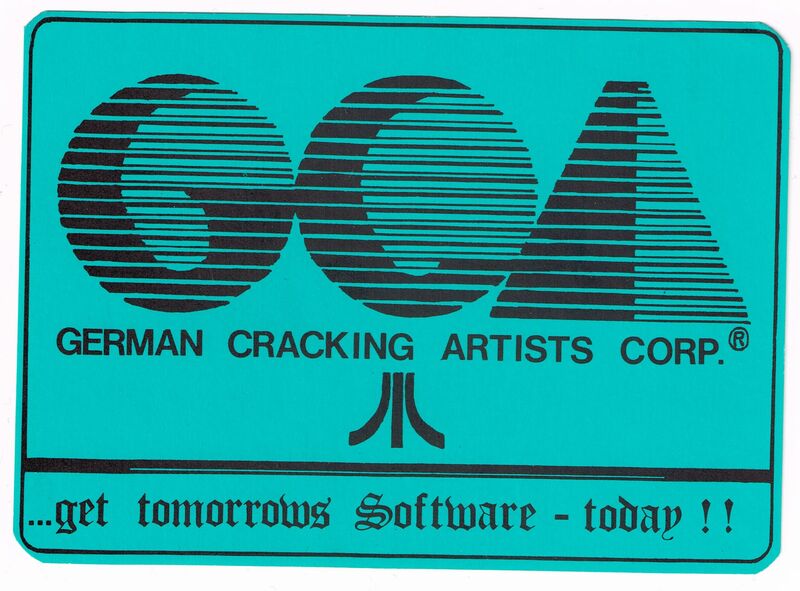 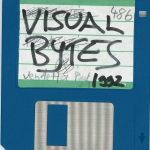 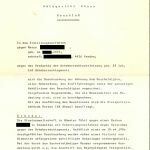 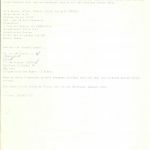 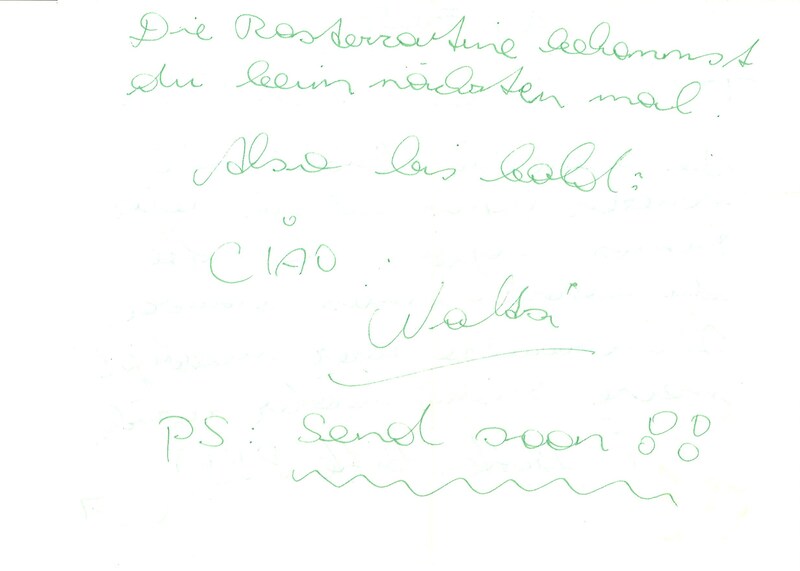 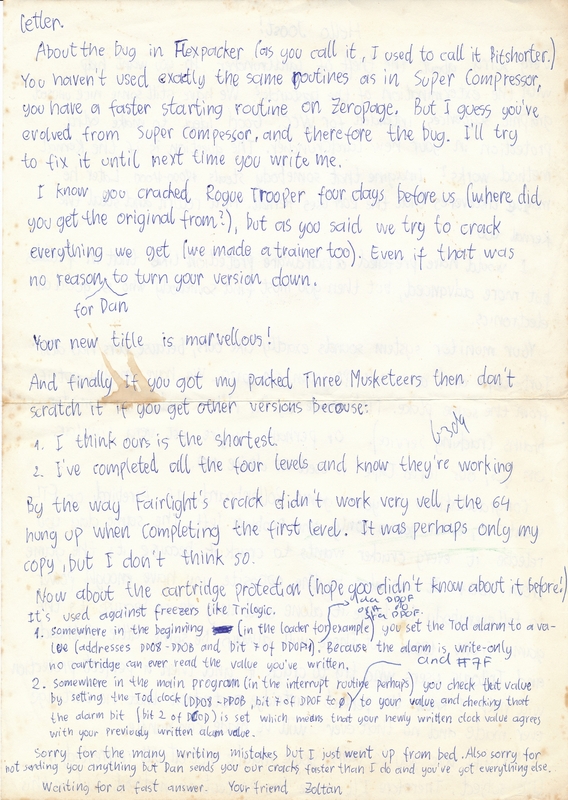 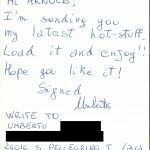 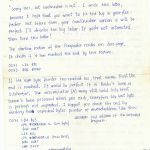 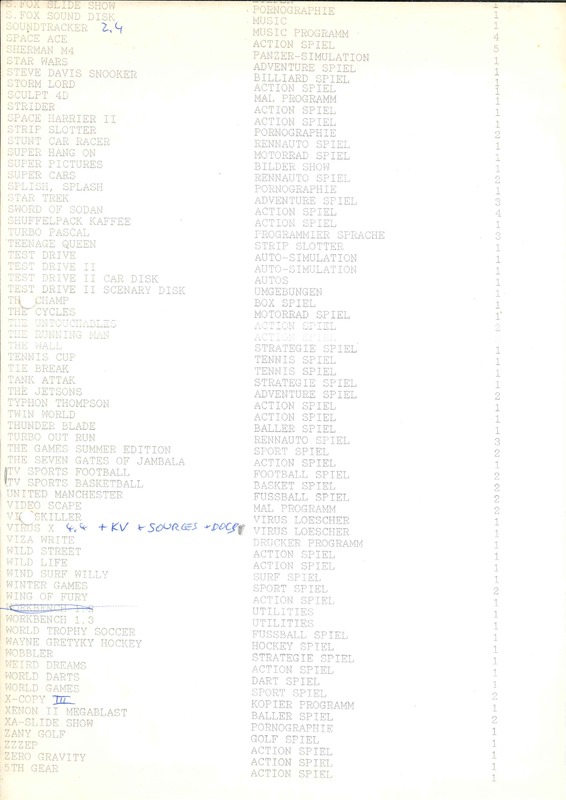 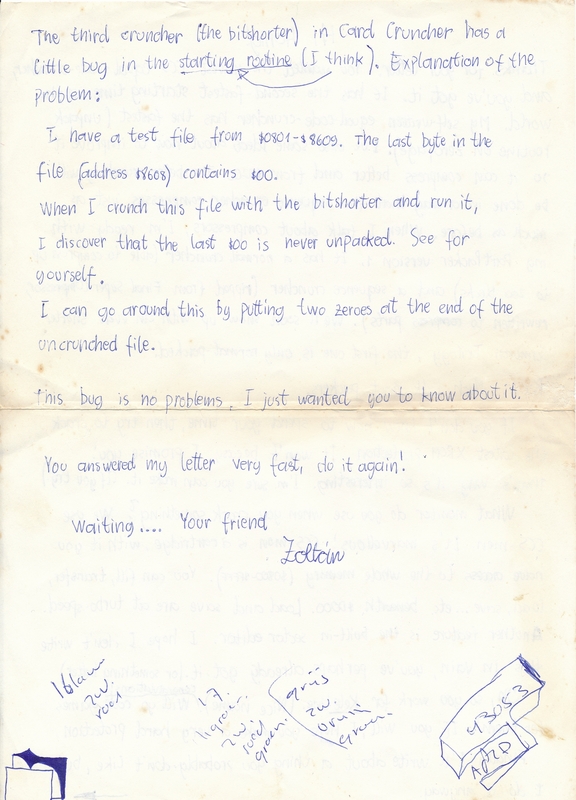 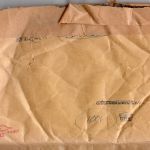 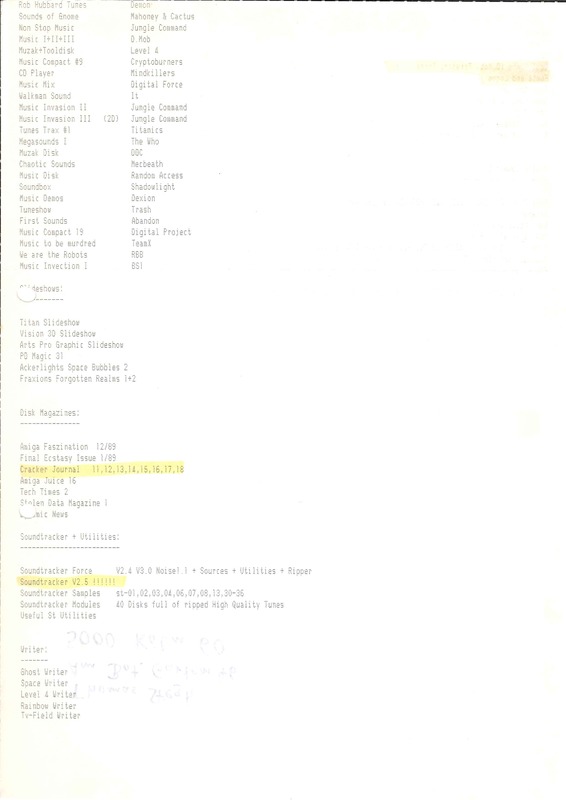 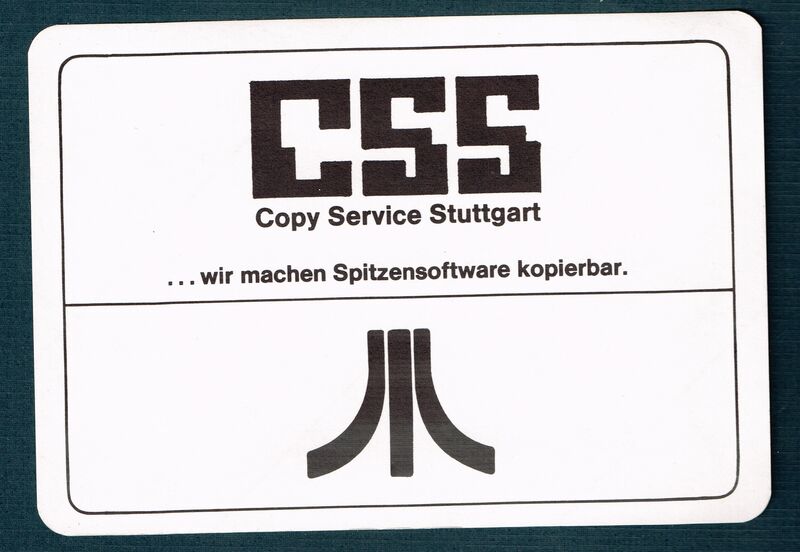 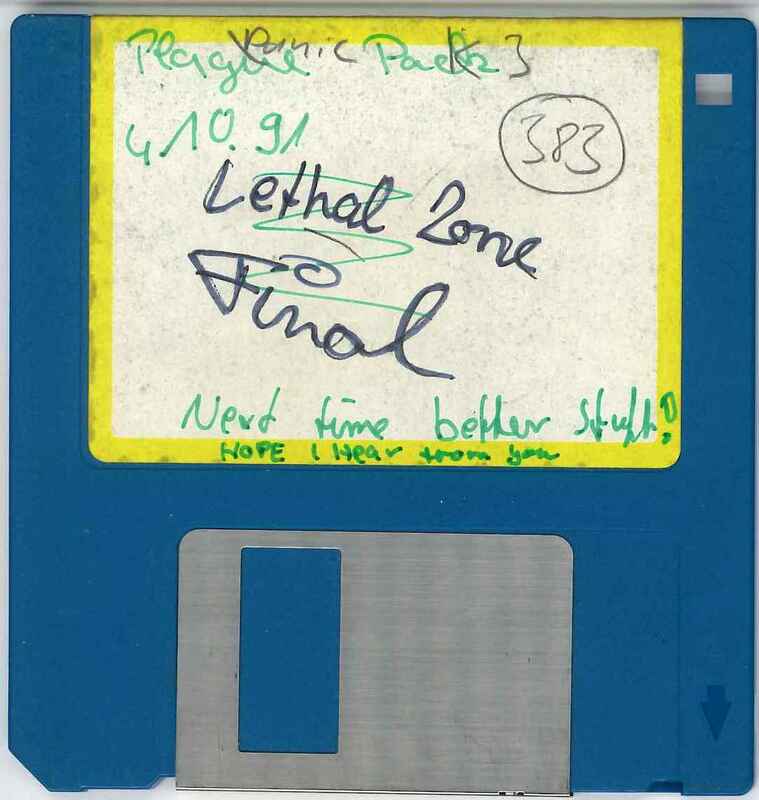 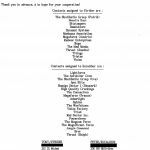 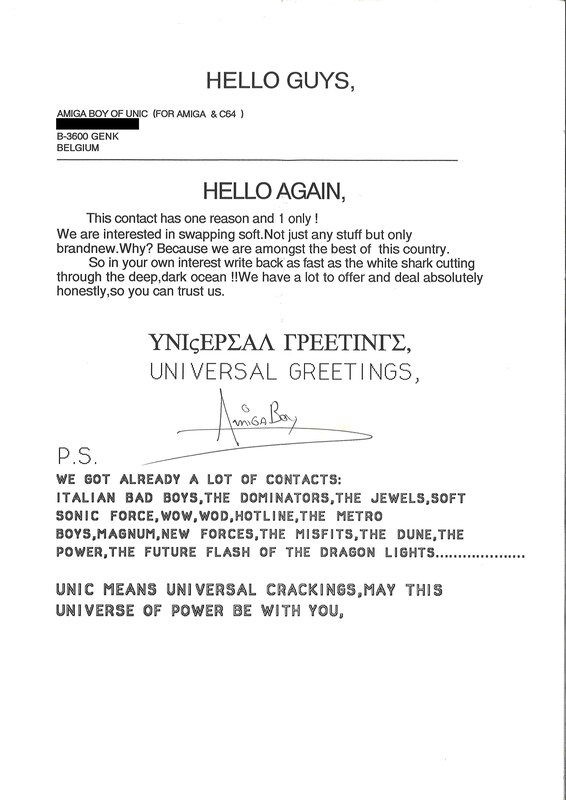 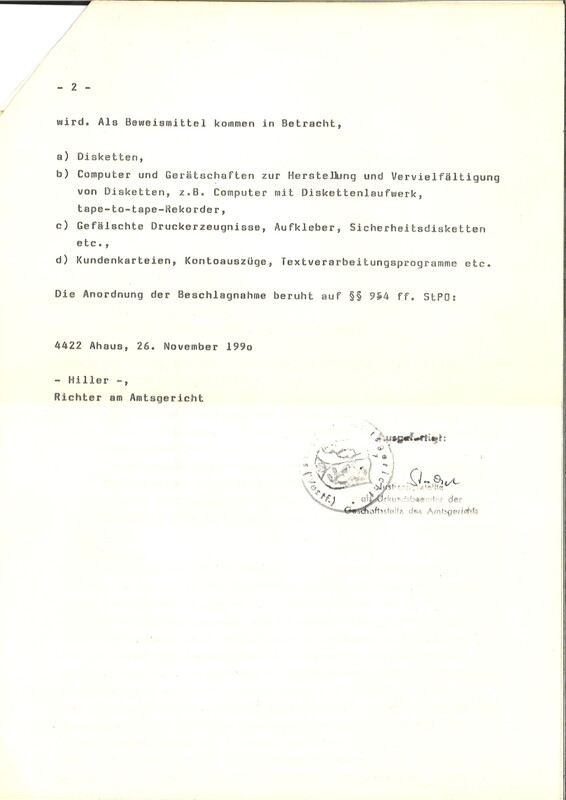 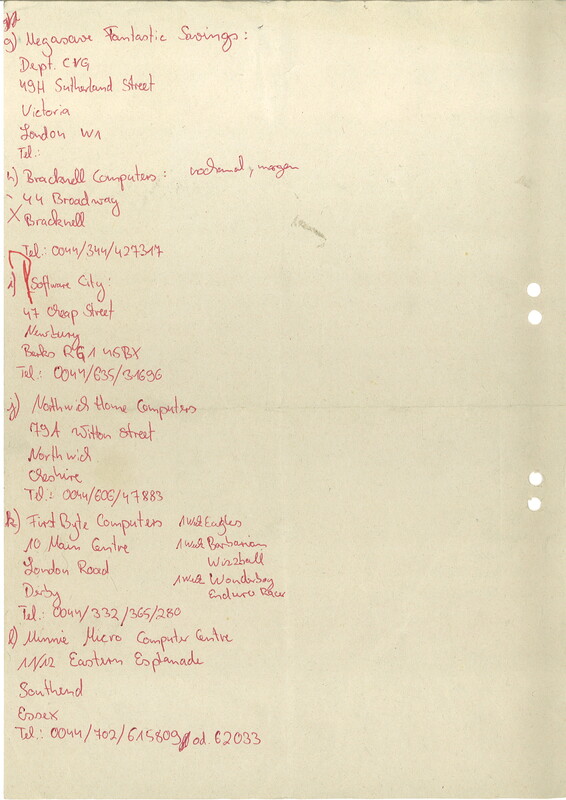 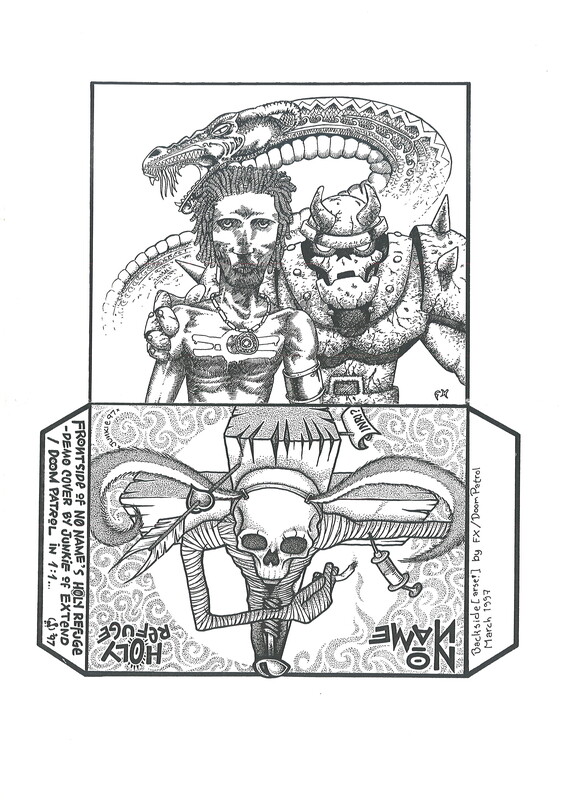 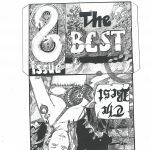 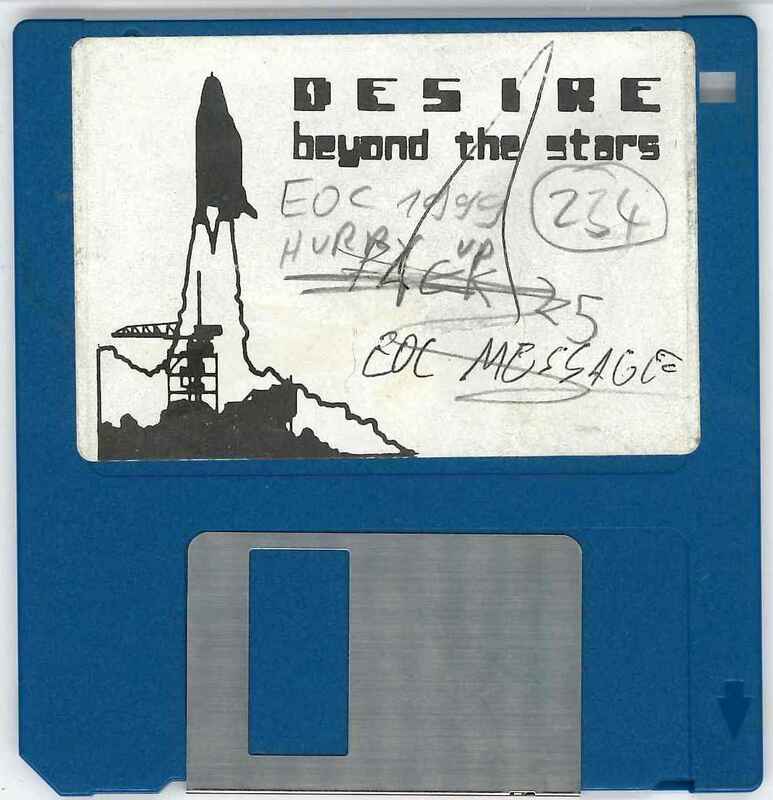 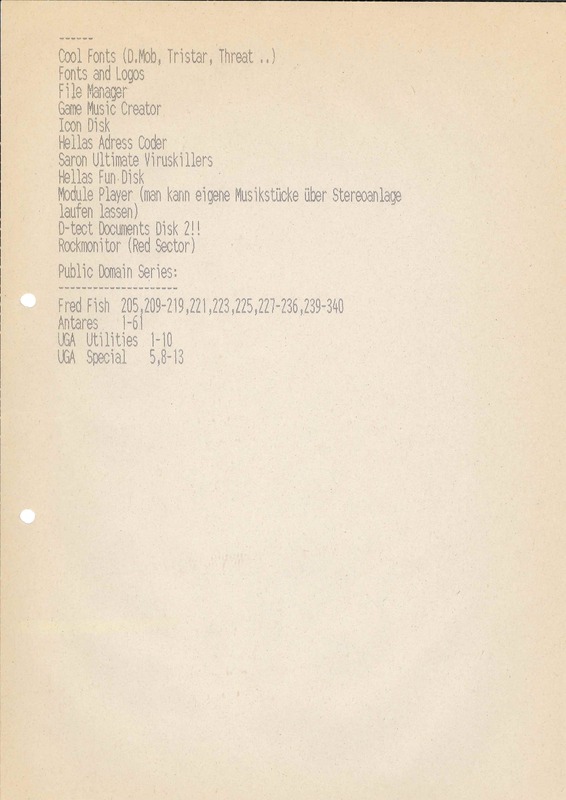 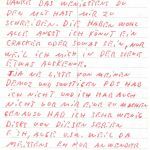 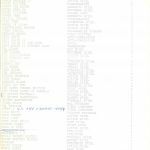 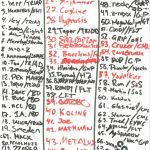 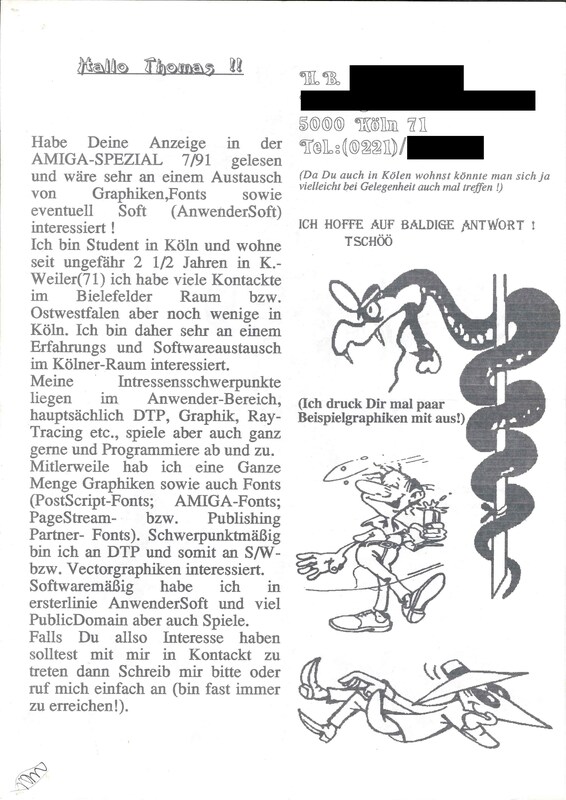 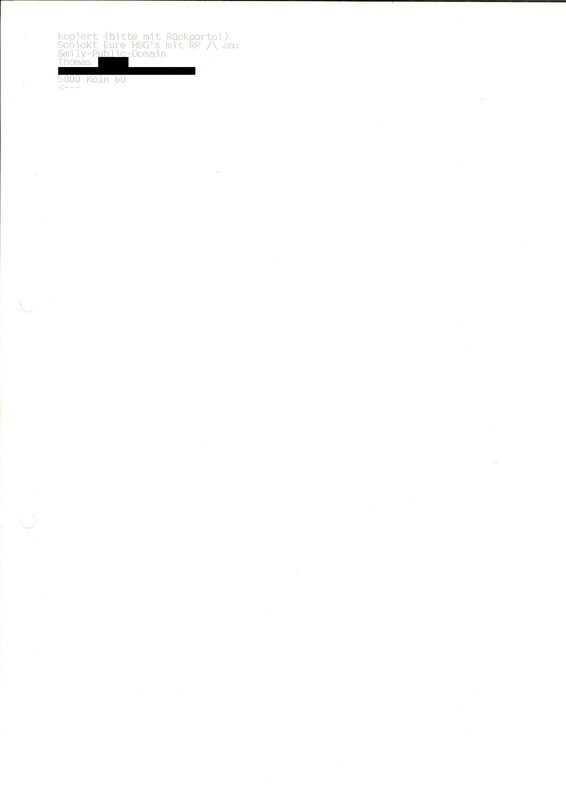 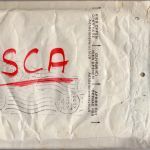 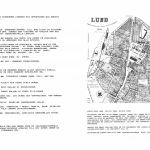 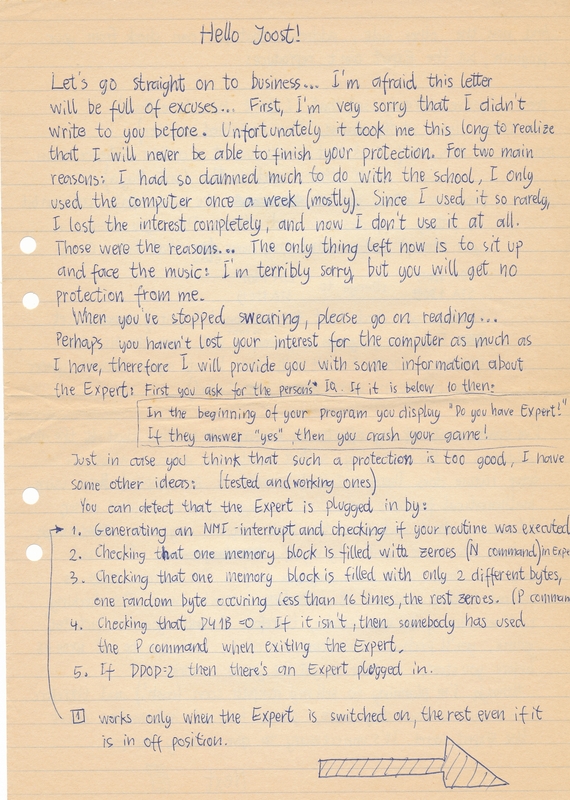 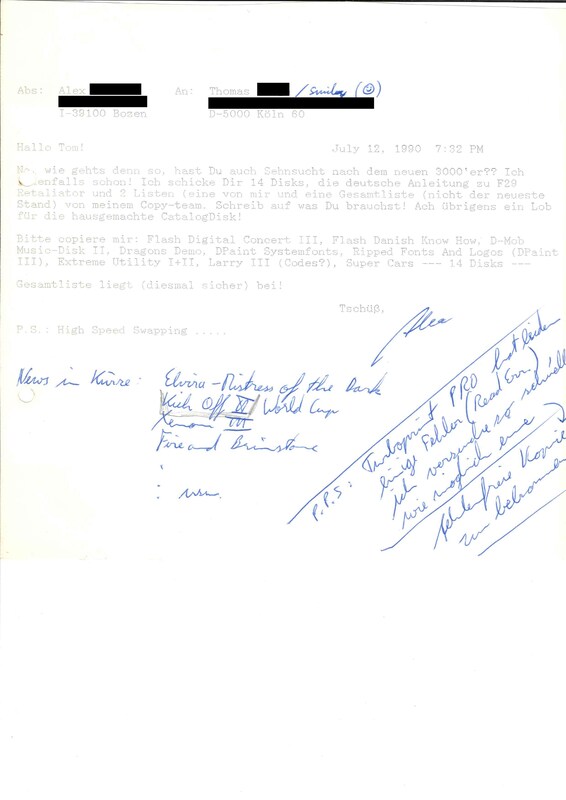 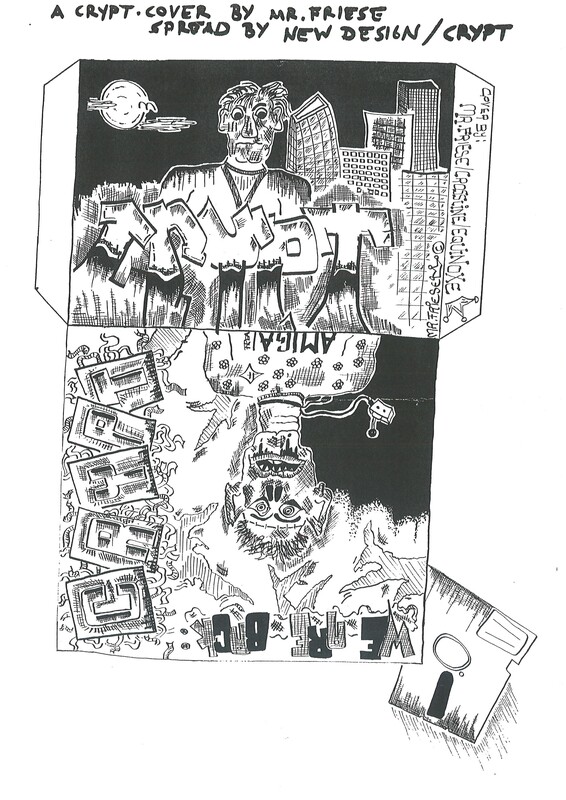 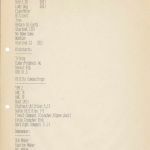 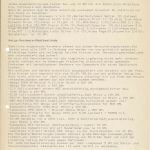 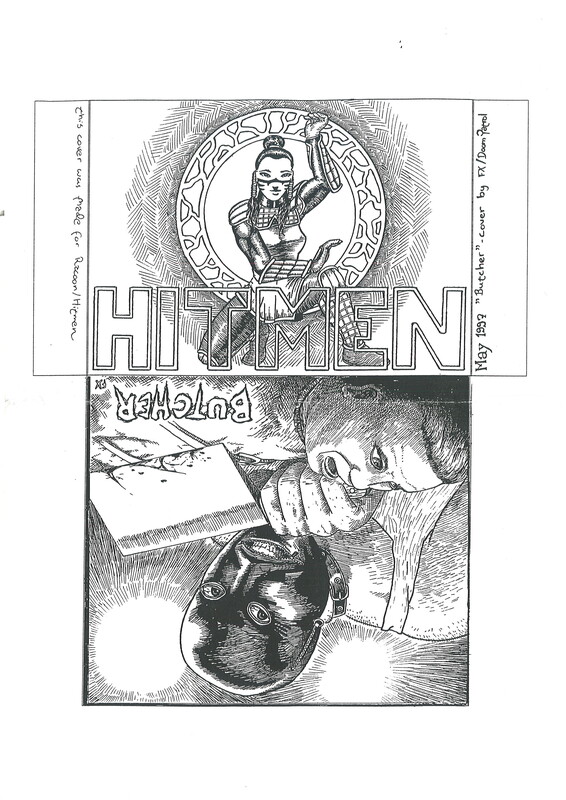 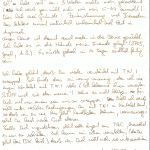 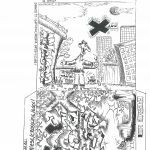 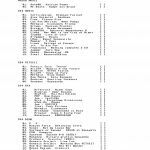 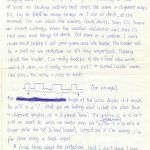 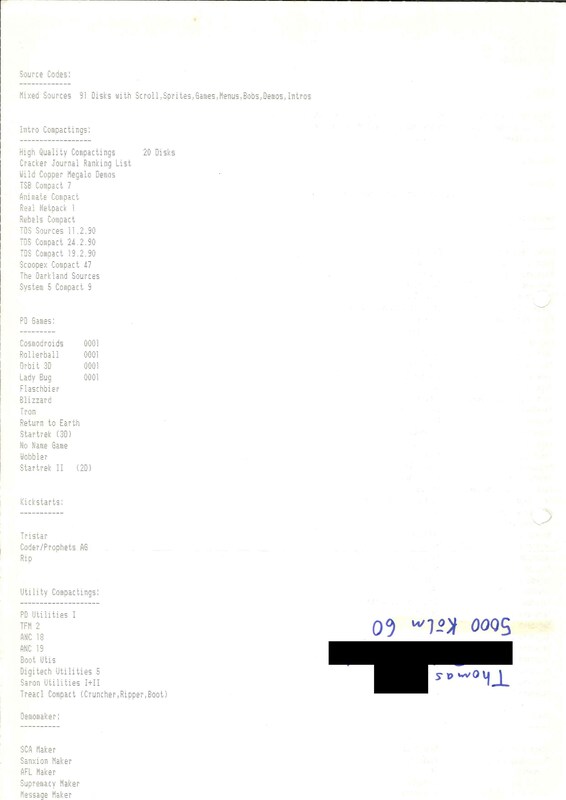 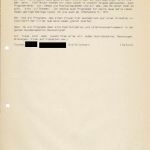 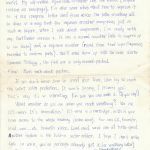 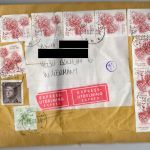 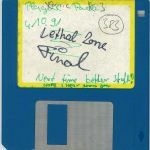 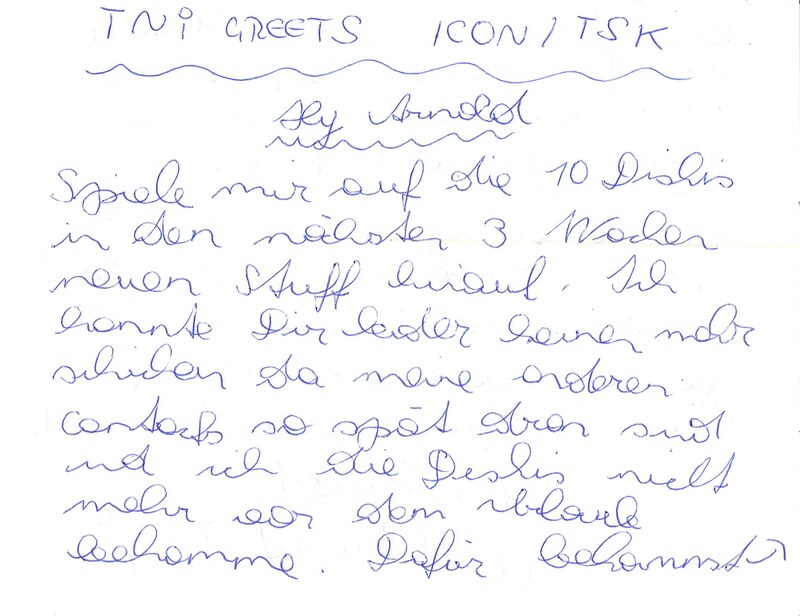 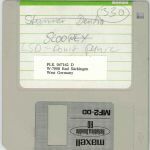 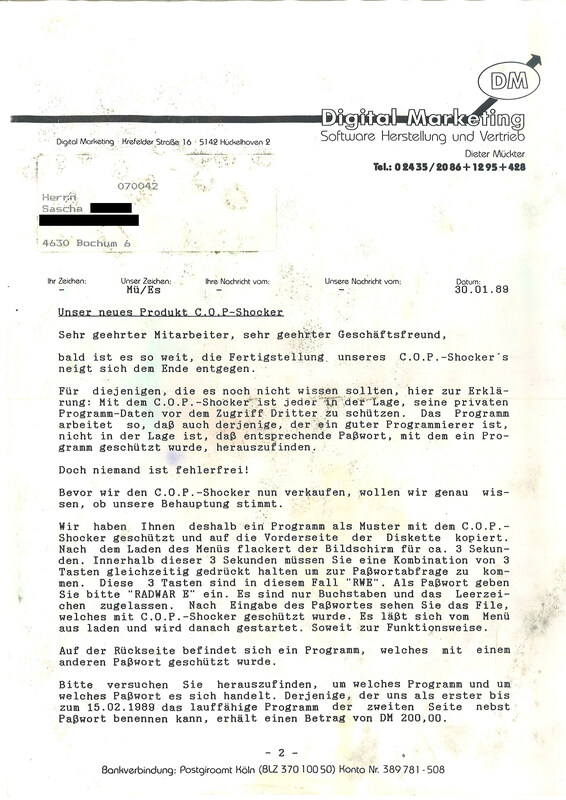 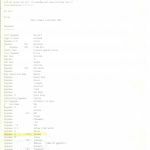 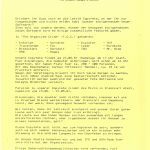 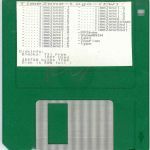 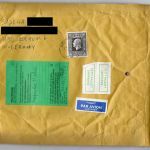 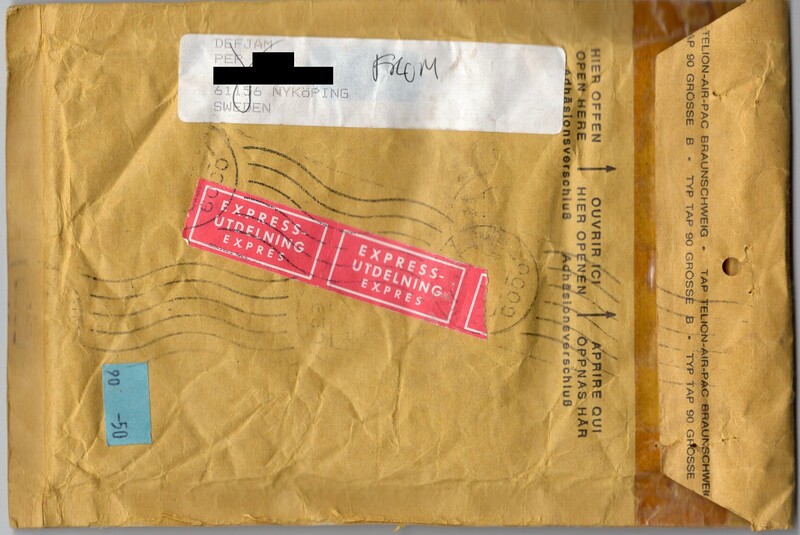 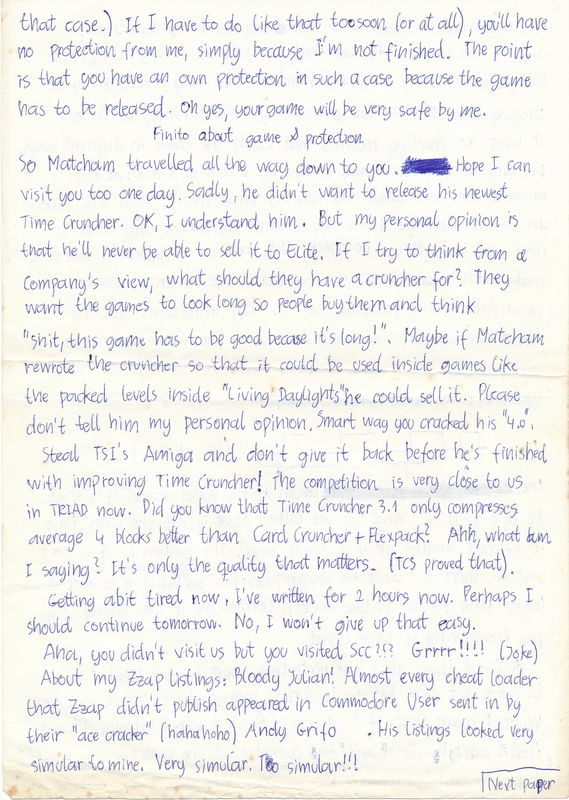 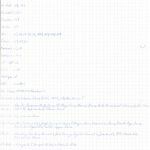 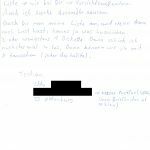 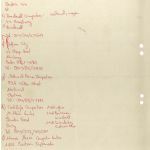 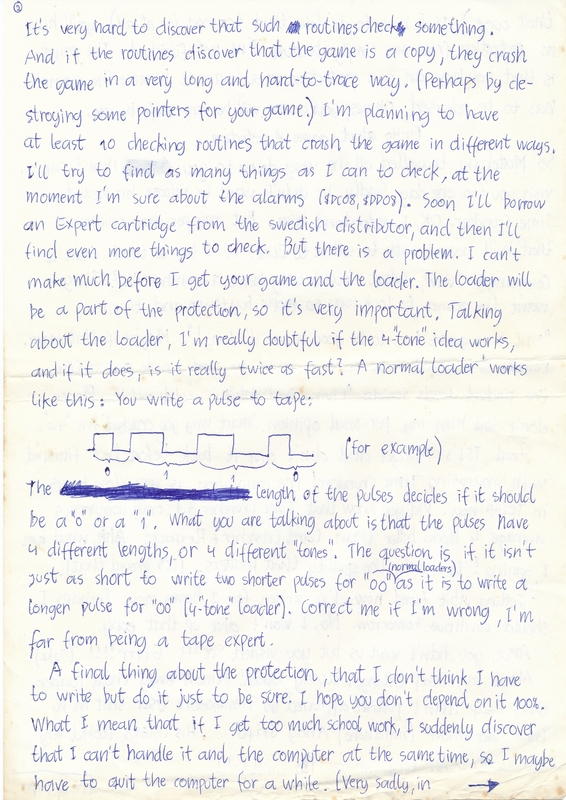 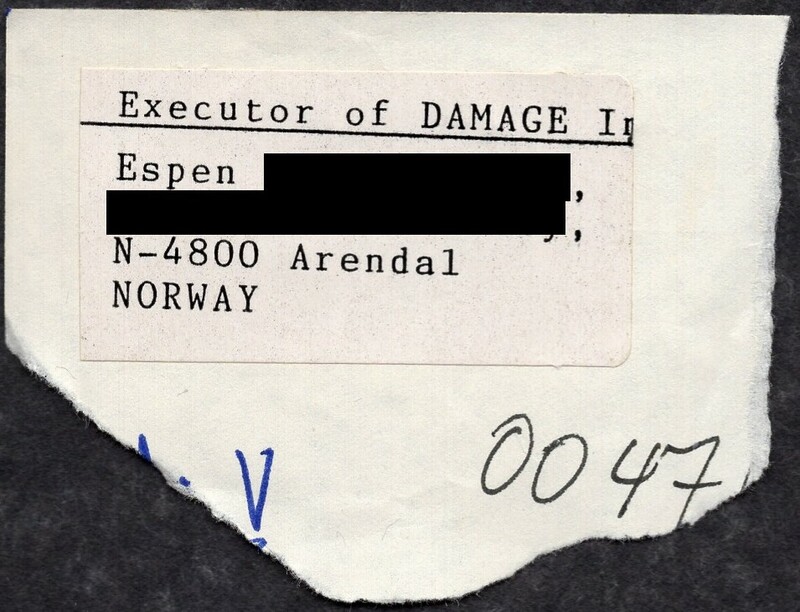 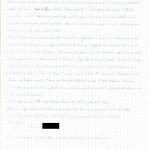 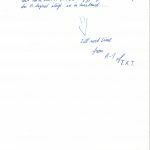 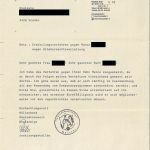 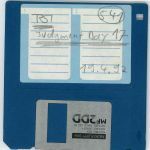 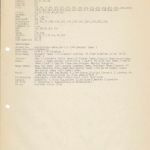 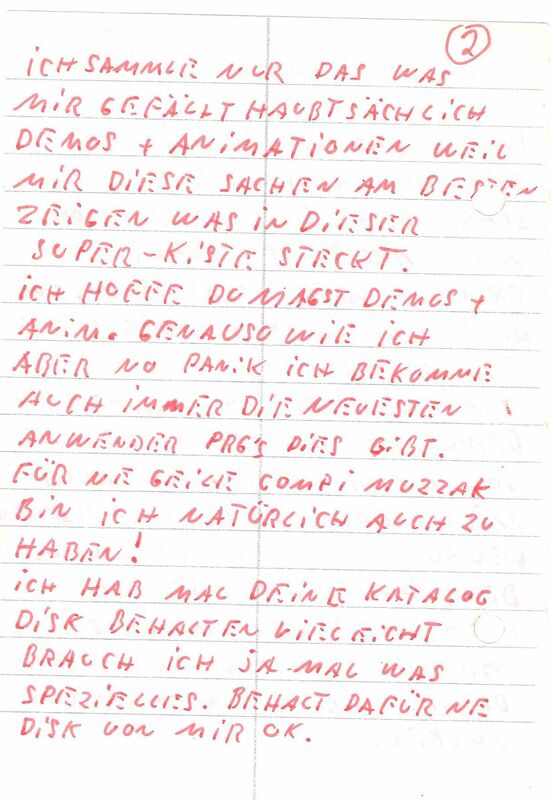 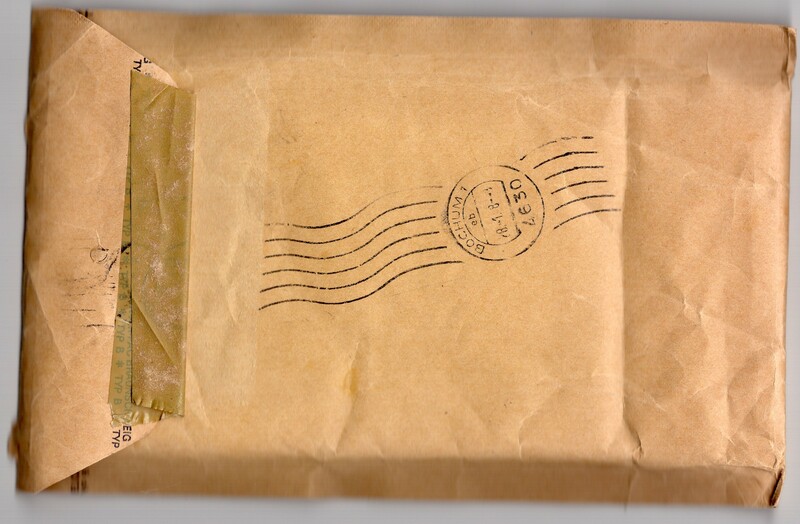 This time, it’s German C64 scener TMA/Abyss Connection who supplied us with documents from the proceedings of the criminal case against him in 1990-1991. 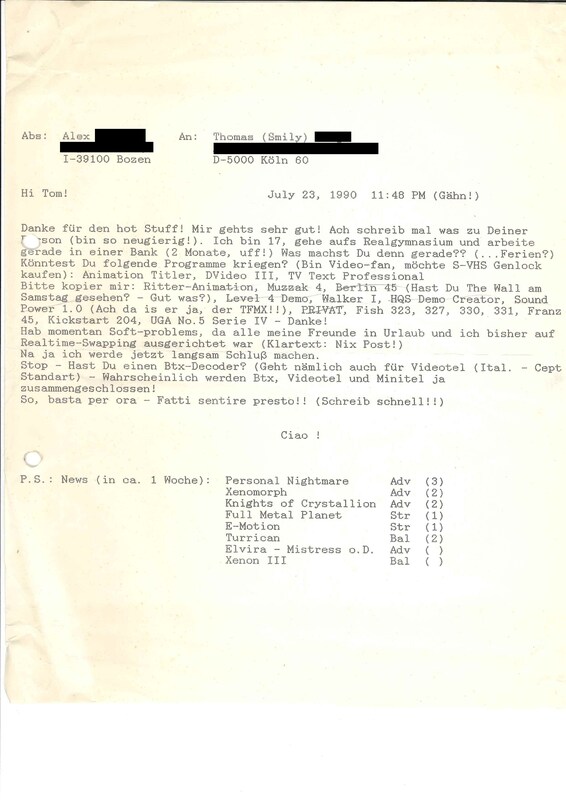 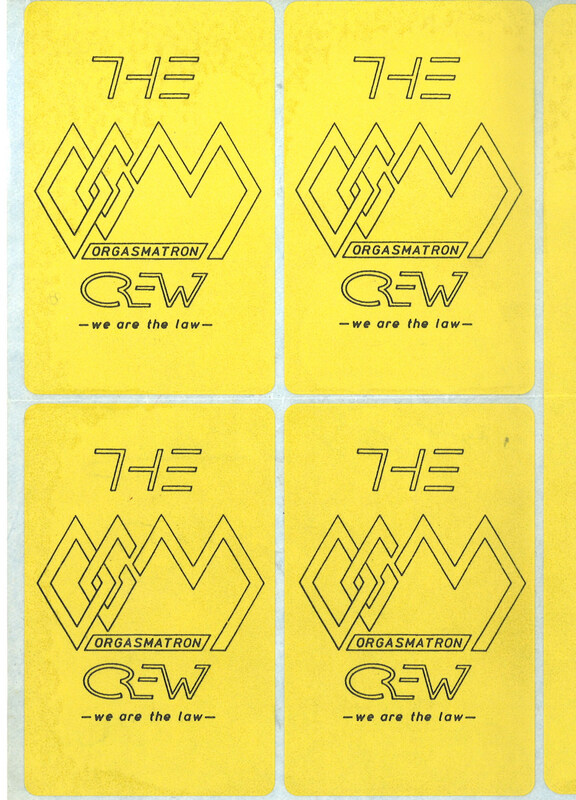 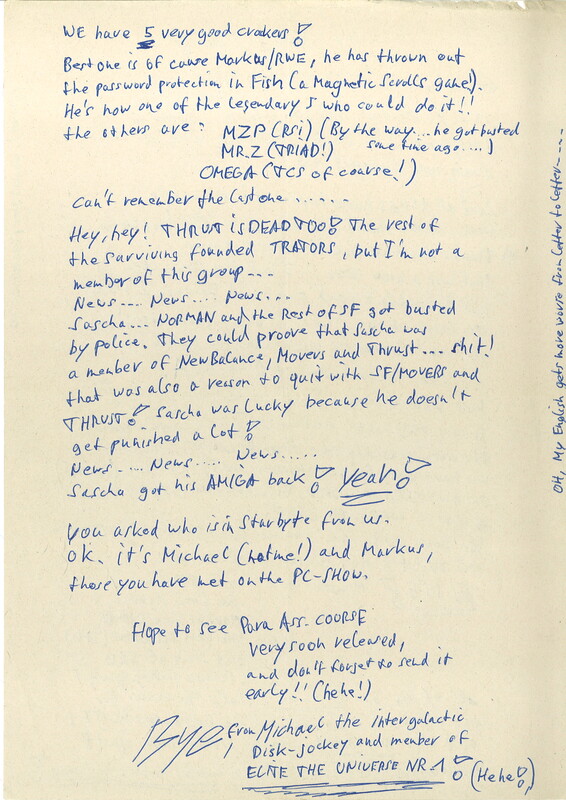 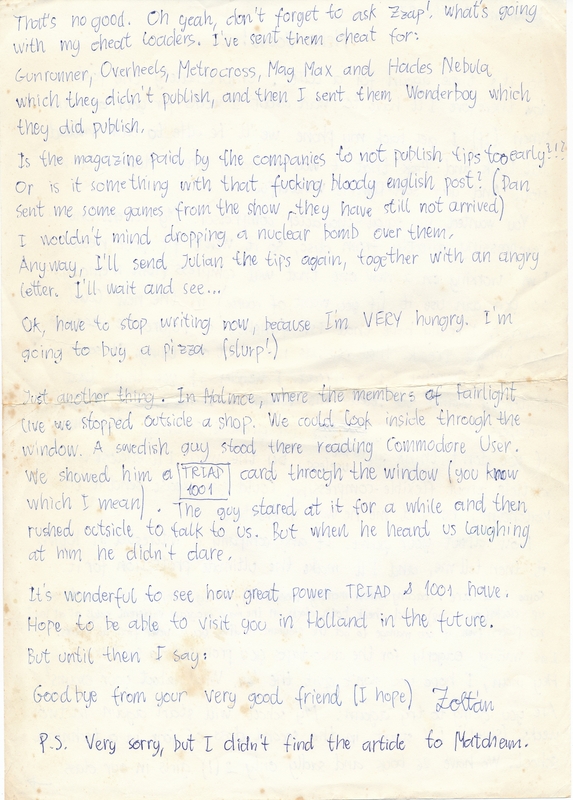 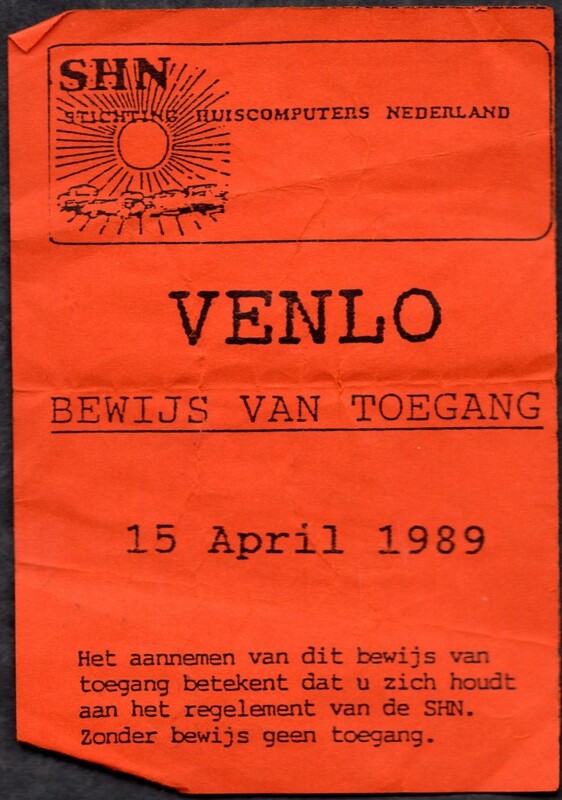 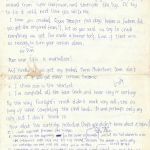 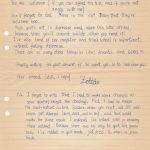 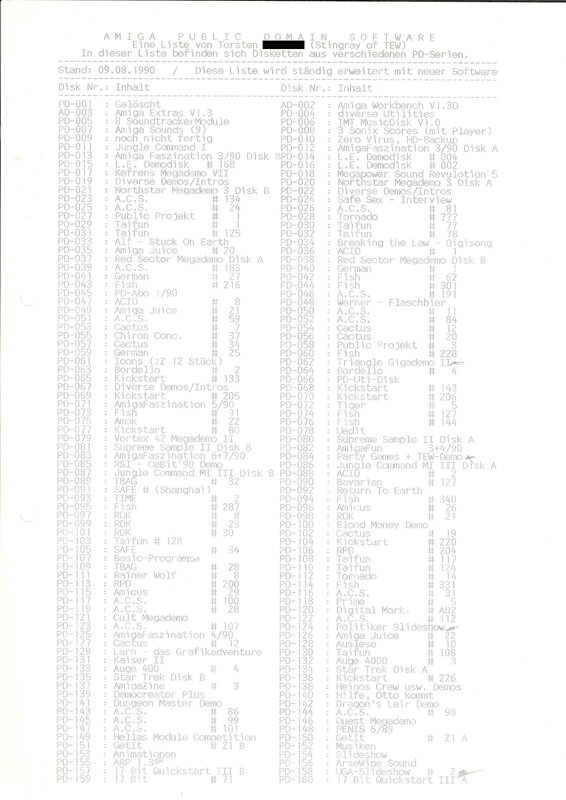 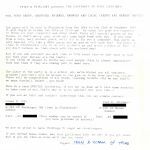 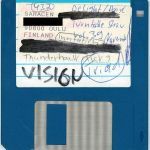 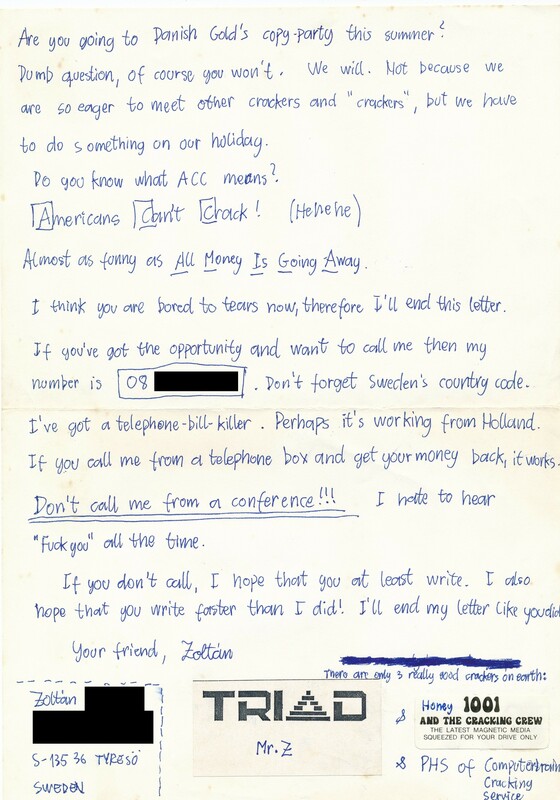 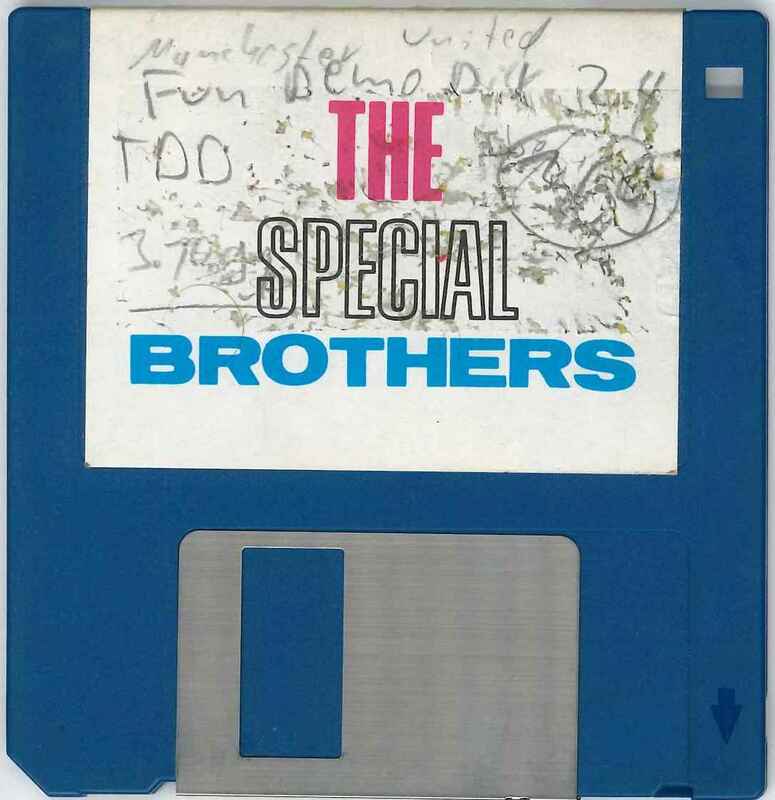 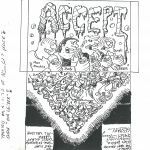 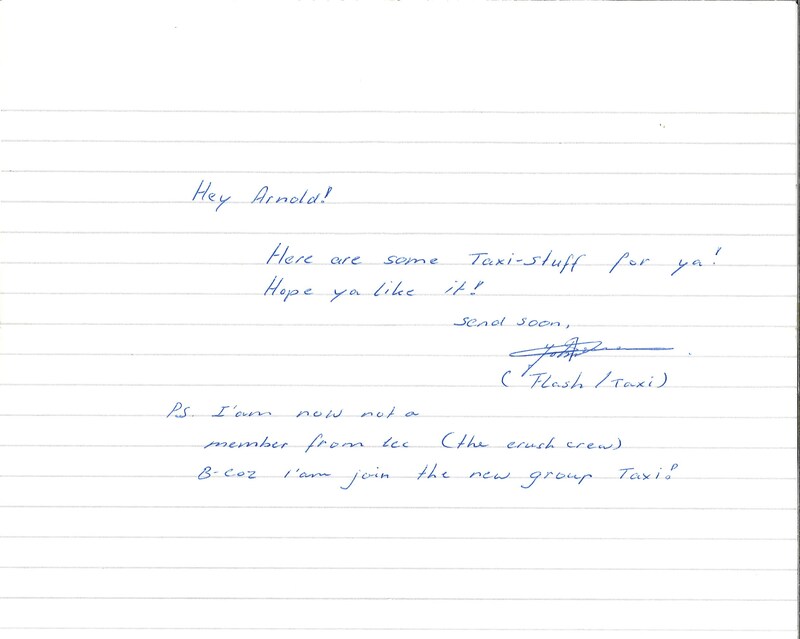 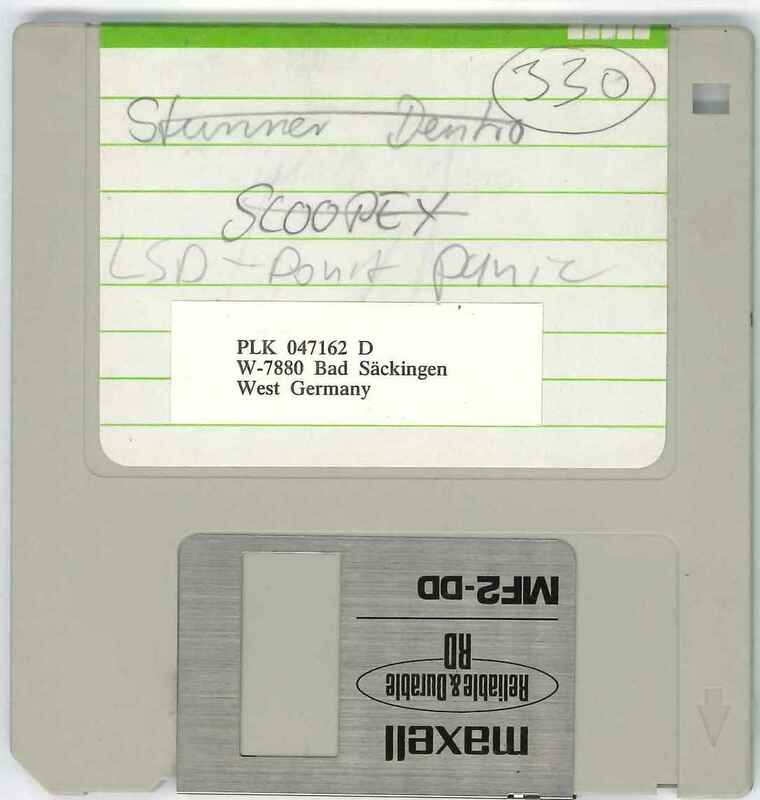 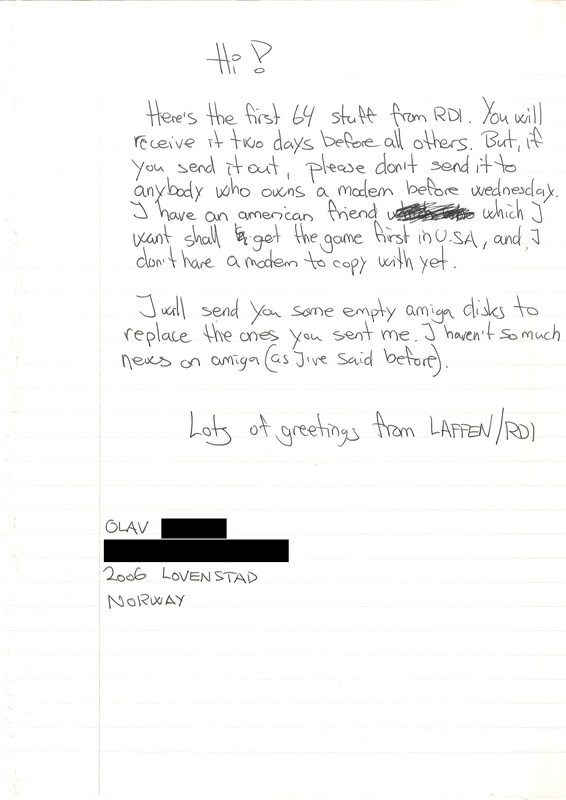 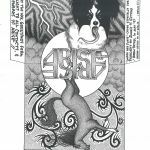 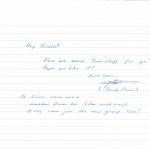 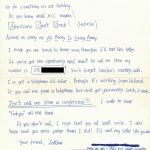 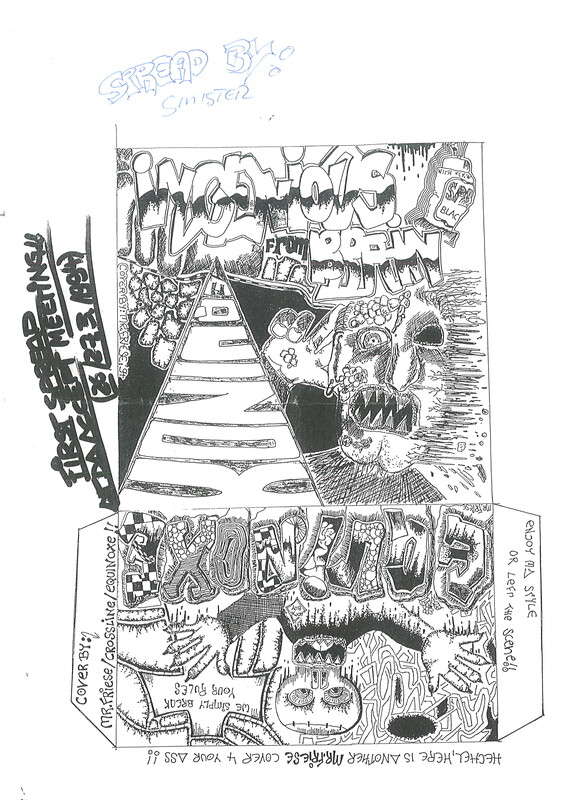 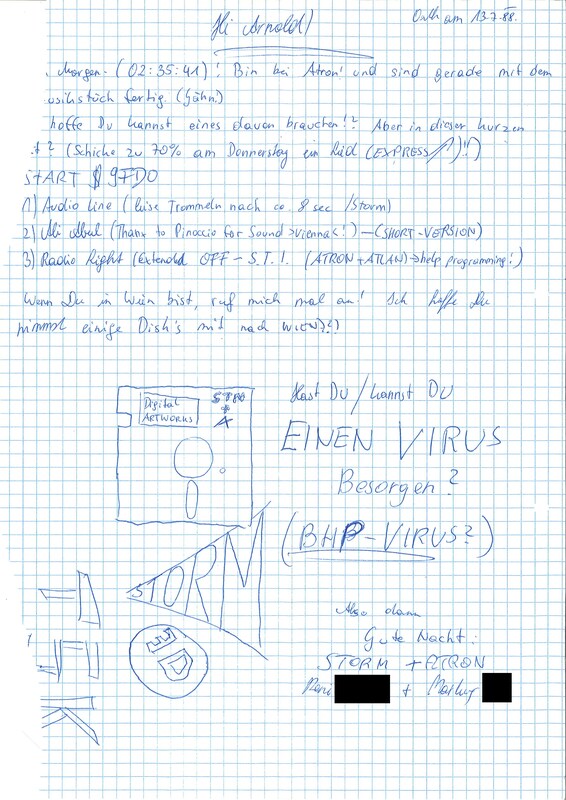 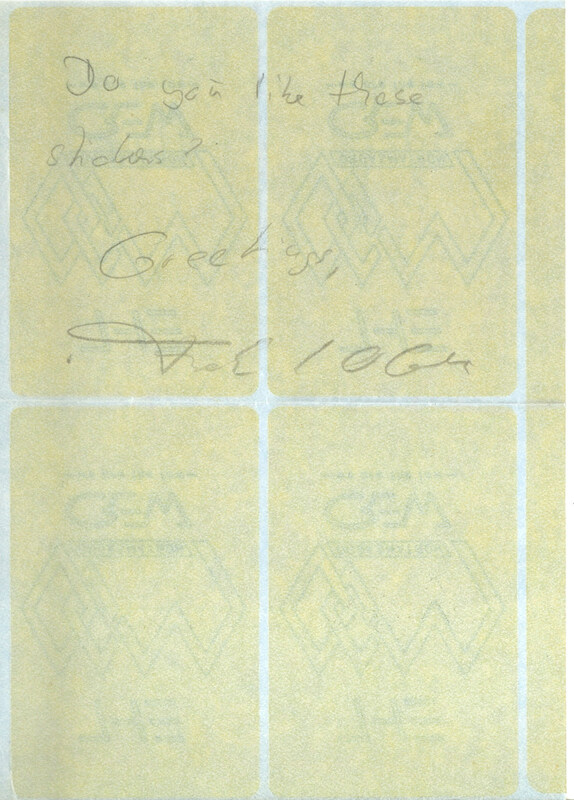 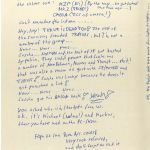 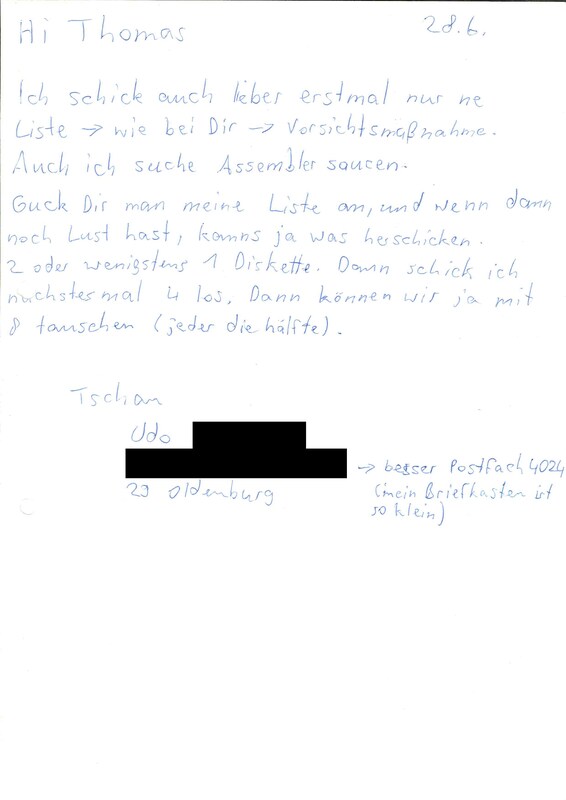 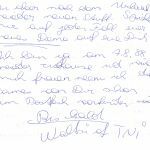 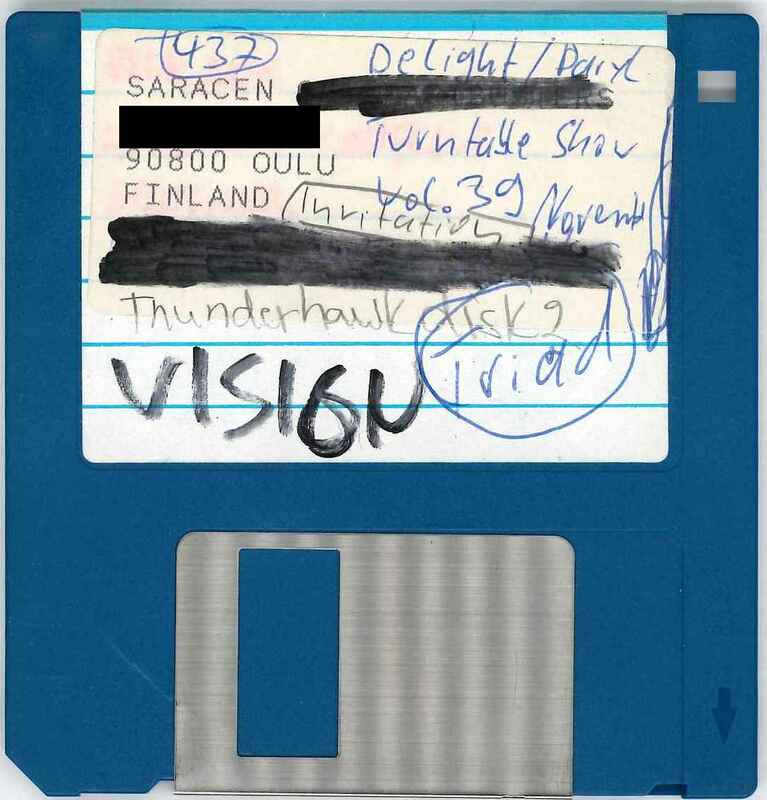 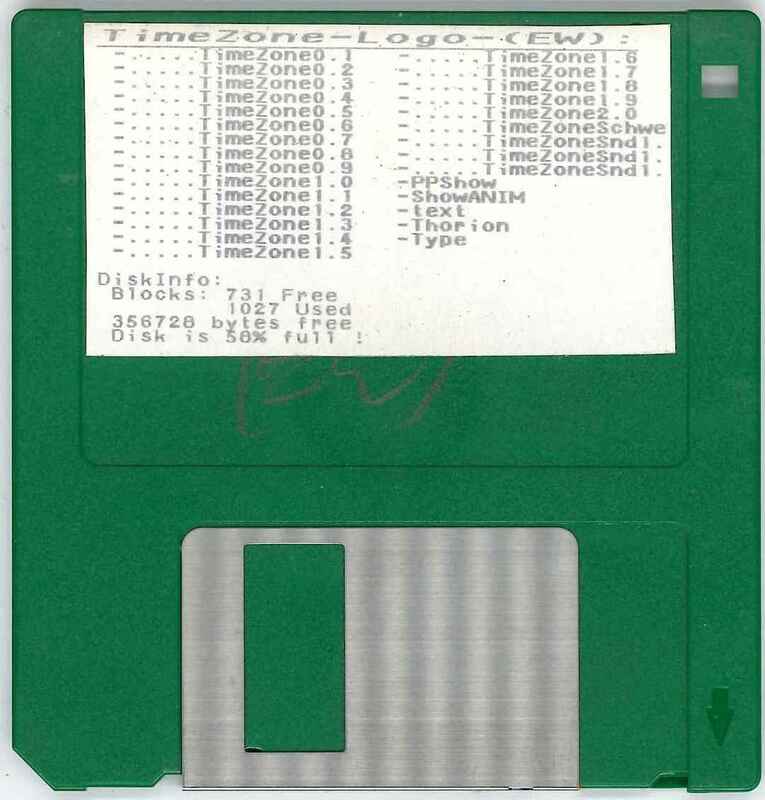 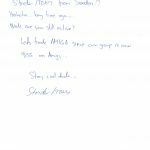 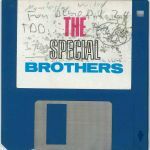 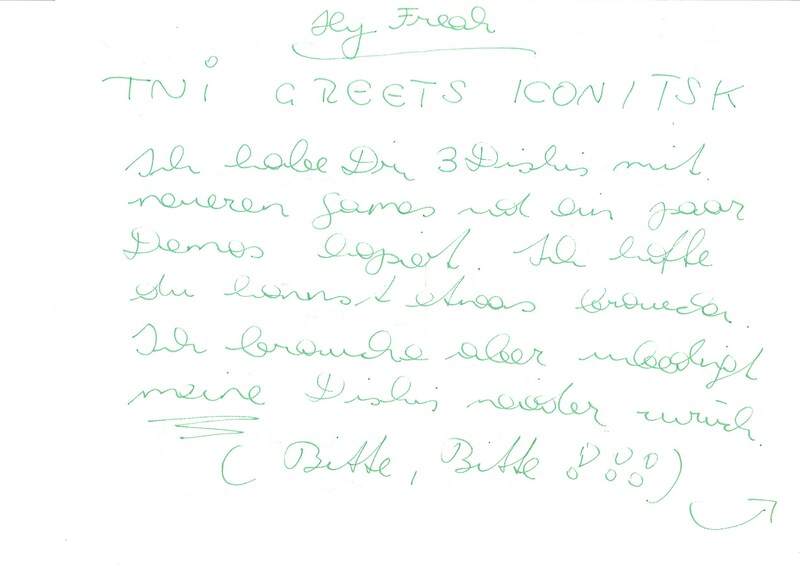 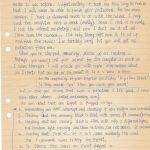 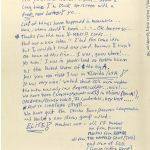 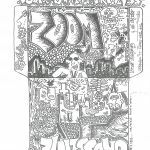 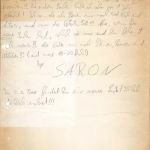 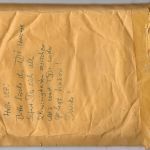 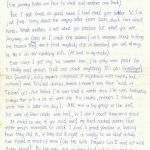 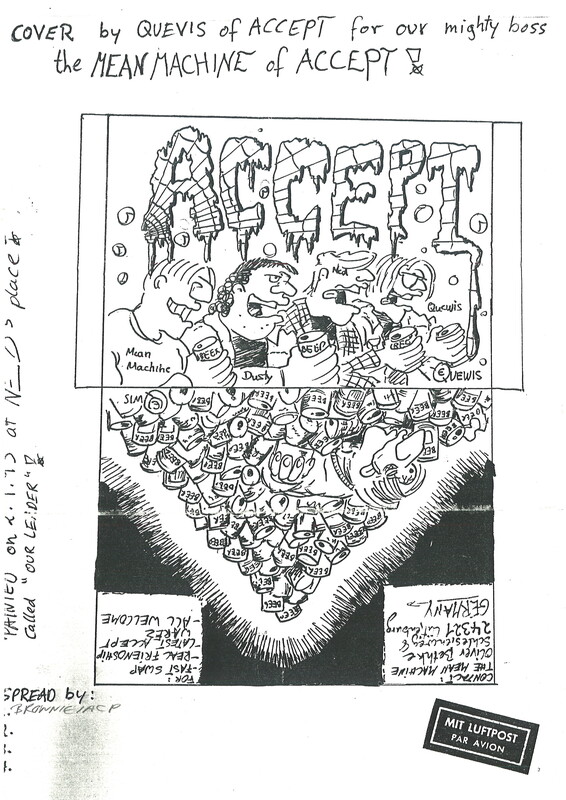 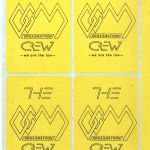 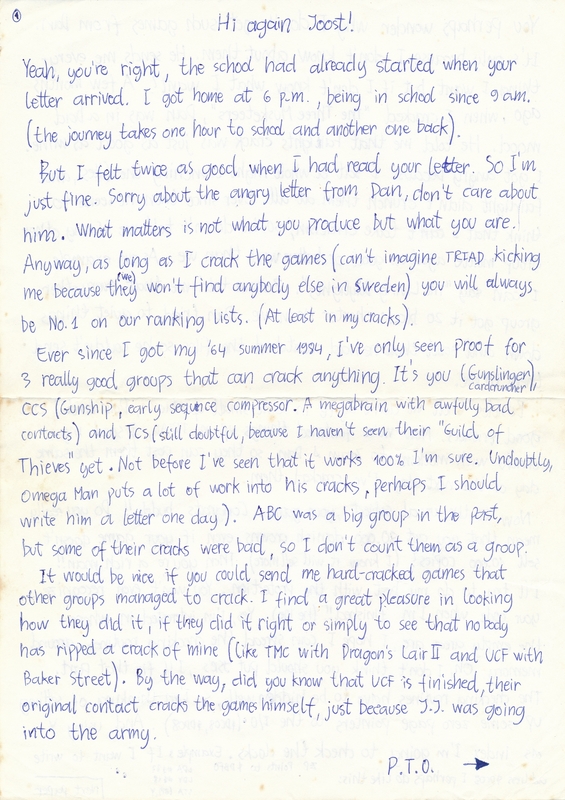 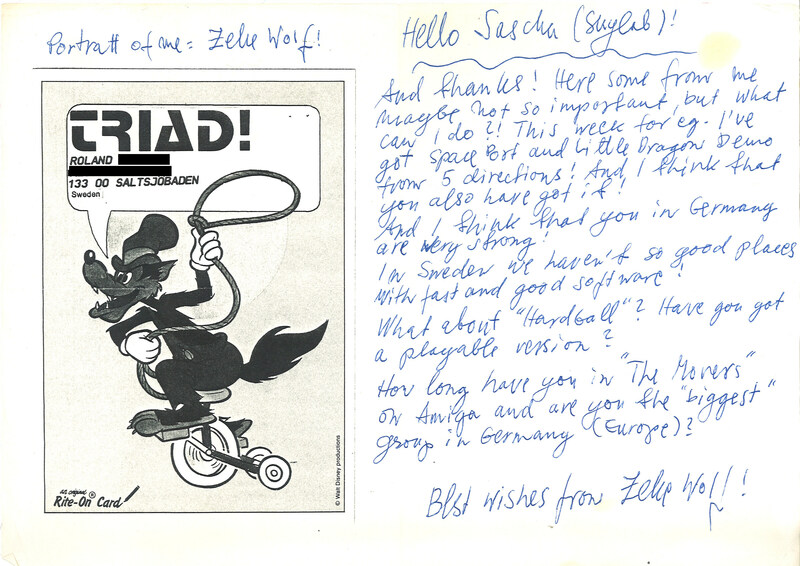 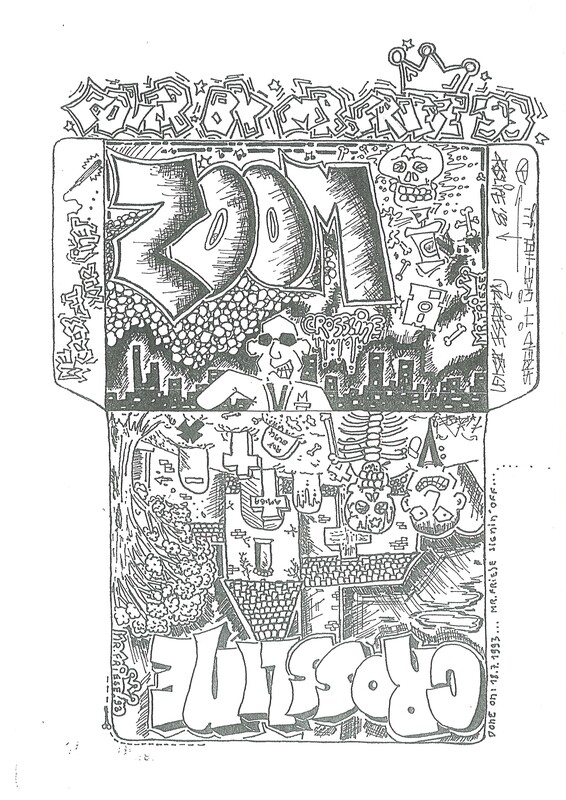 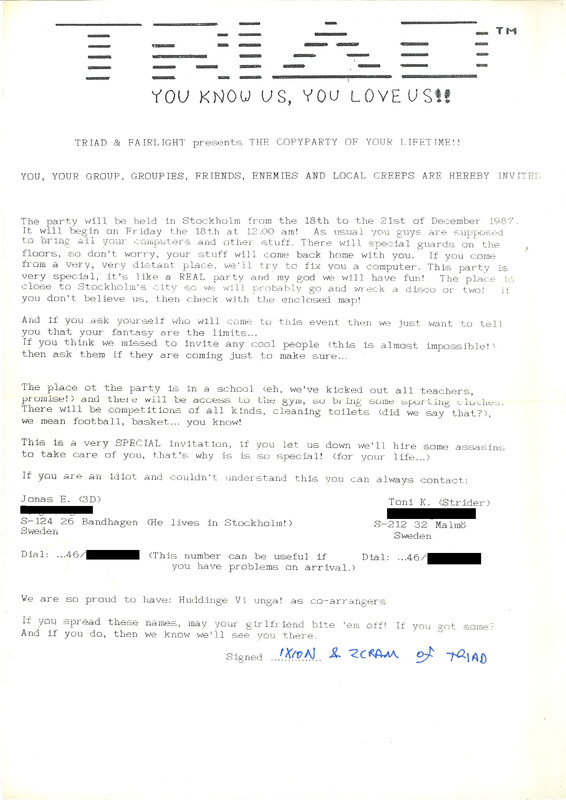 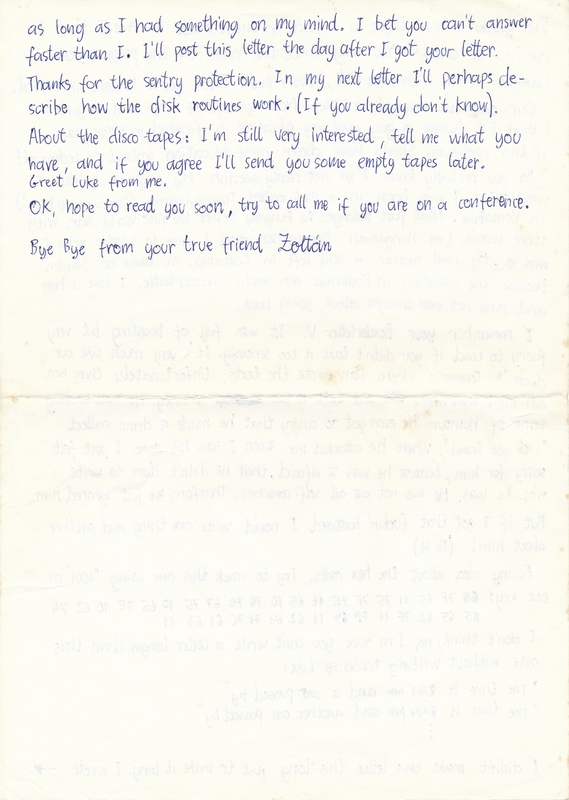 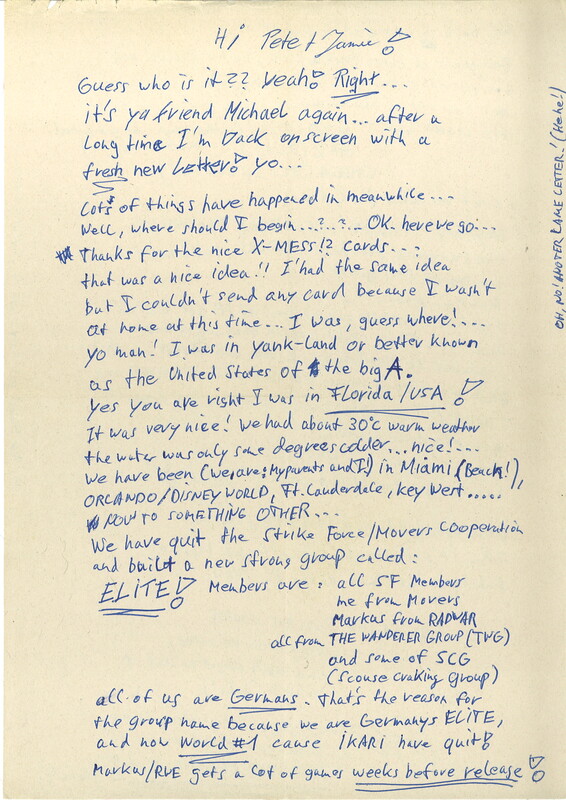 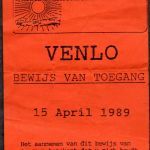 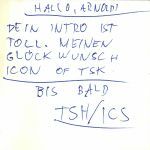 In April 1990, the police had conducted a house search at another scener’s home (who apparently was a member of the Austrian group Lazer), where they found an address book containing TMA’s address. 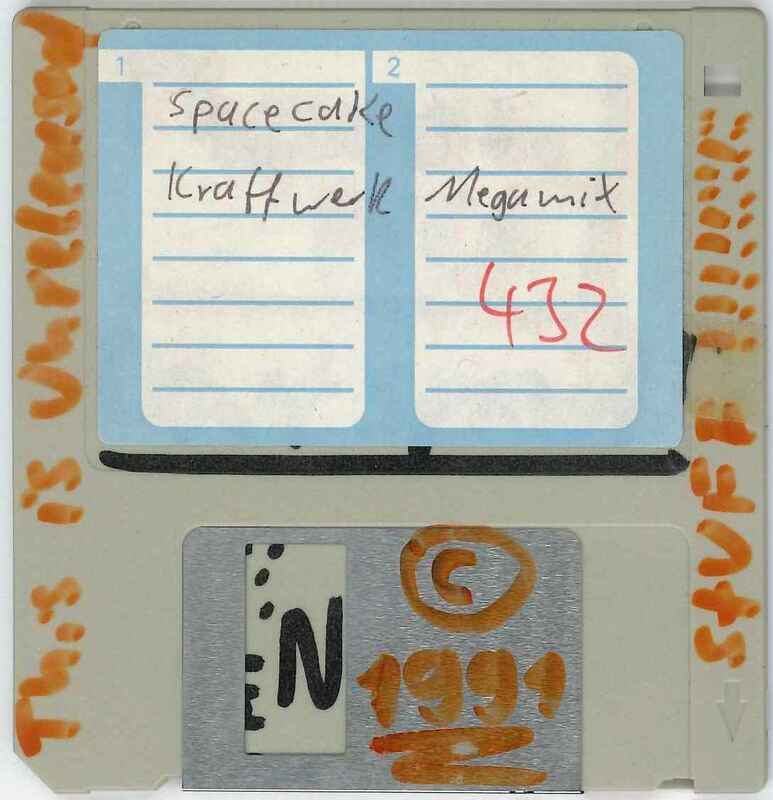 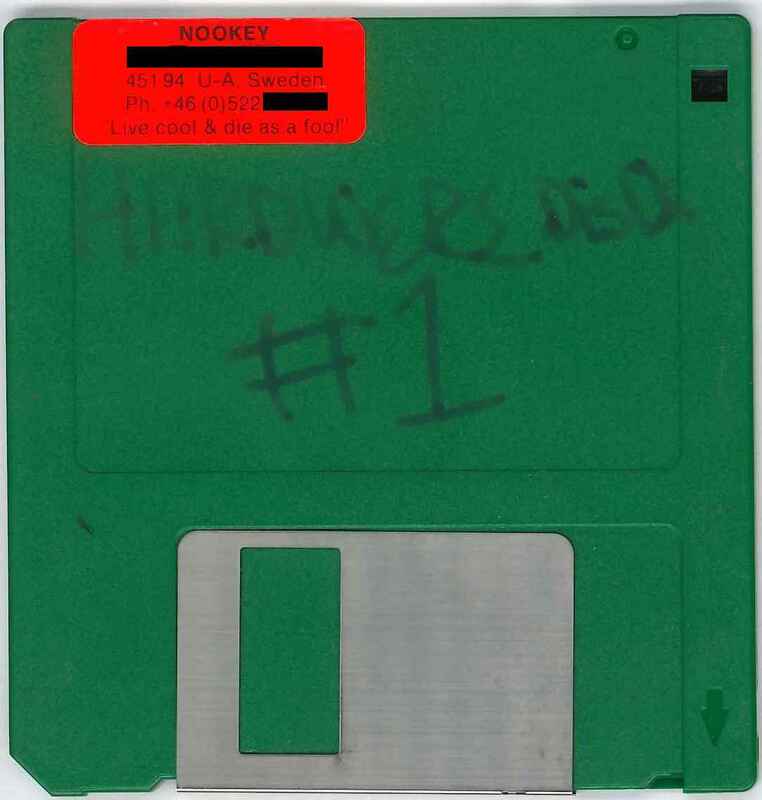 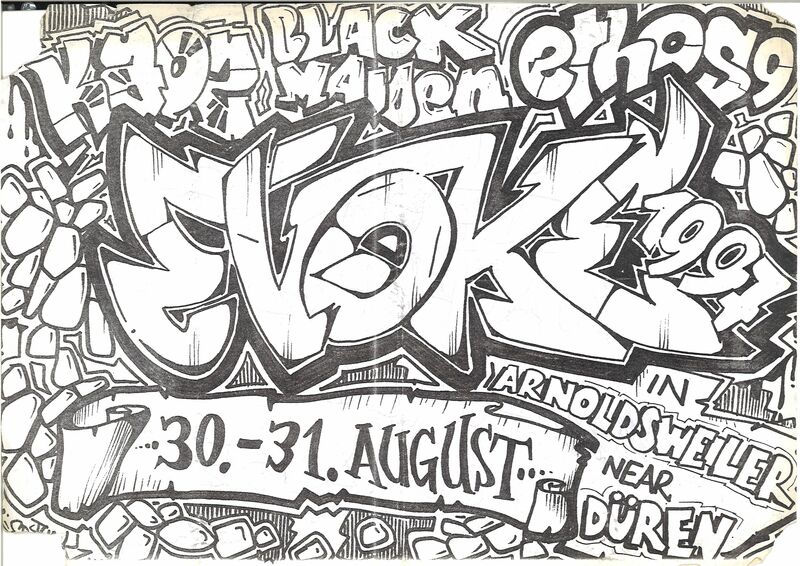 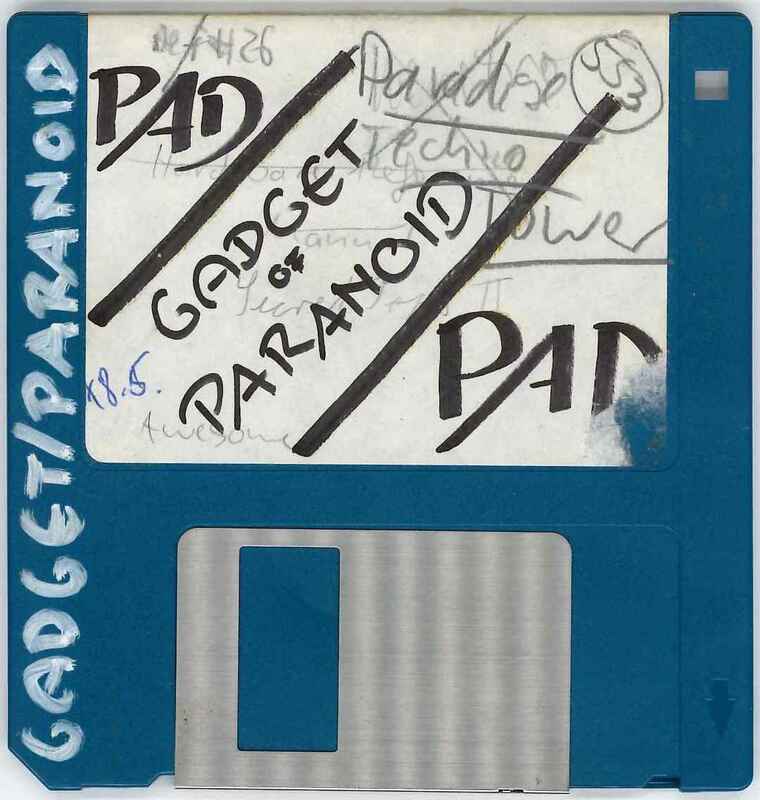 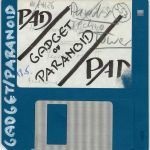 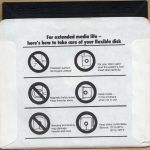 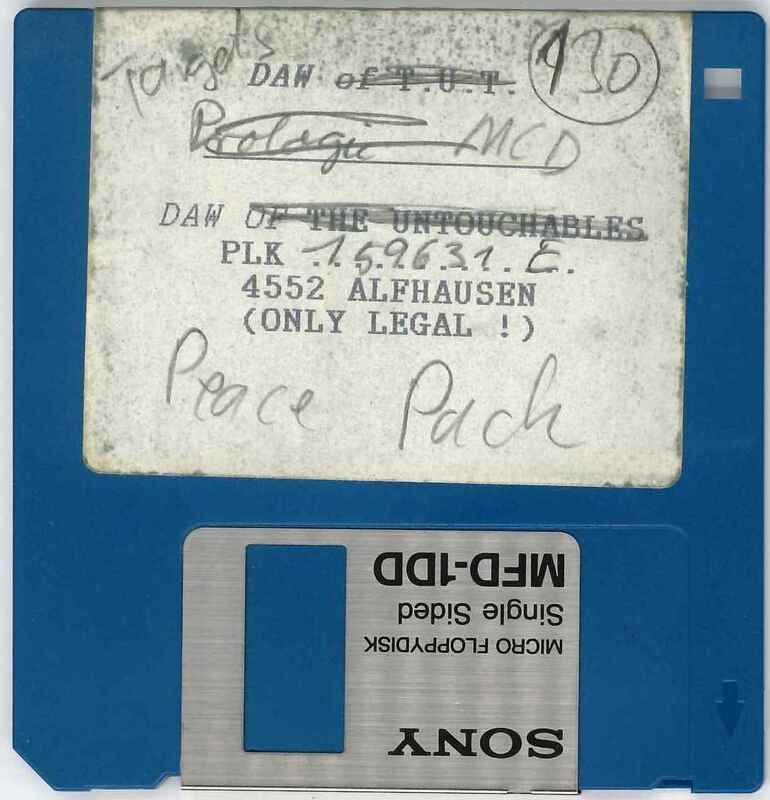 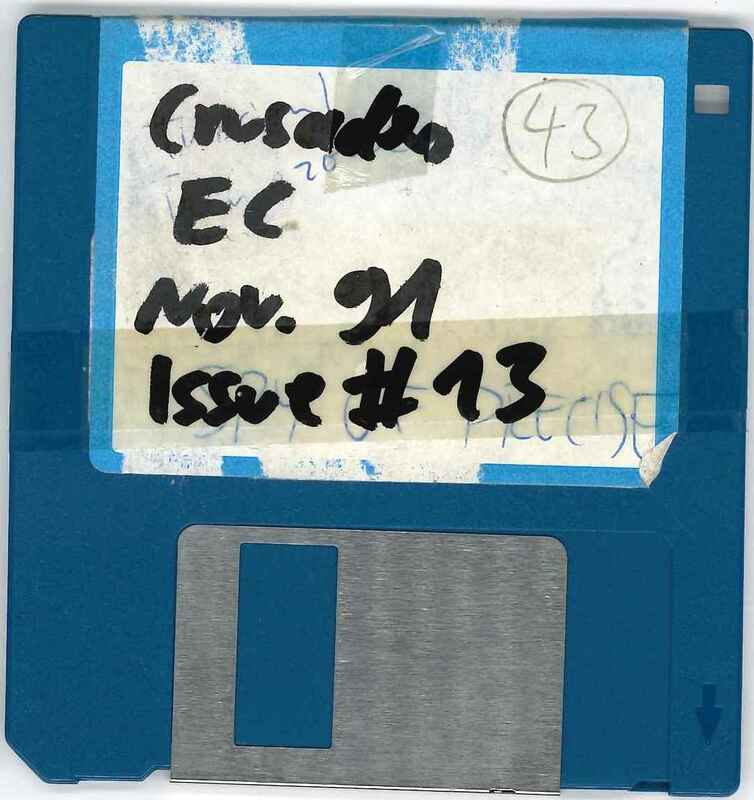 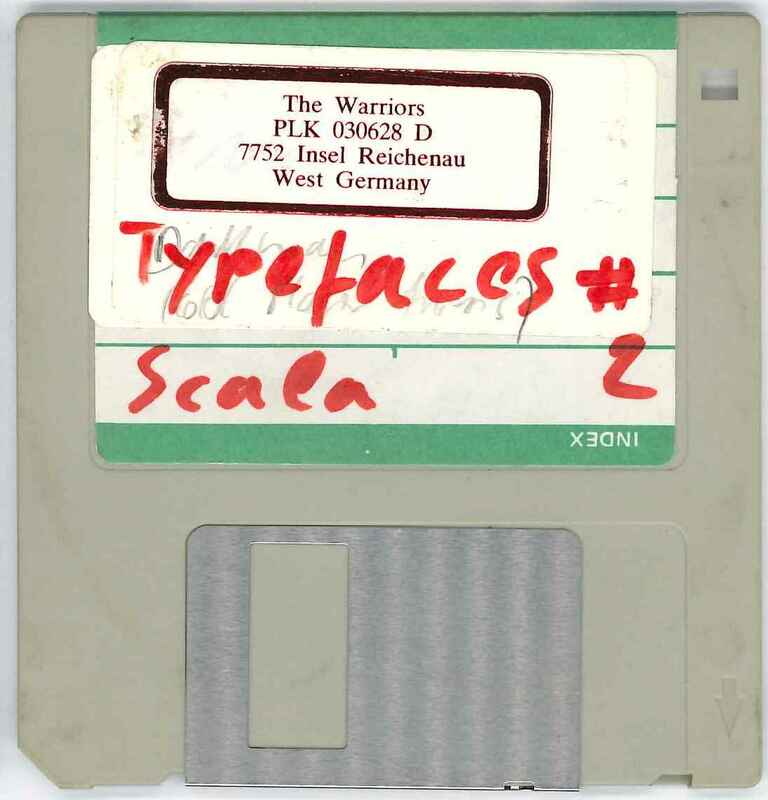 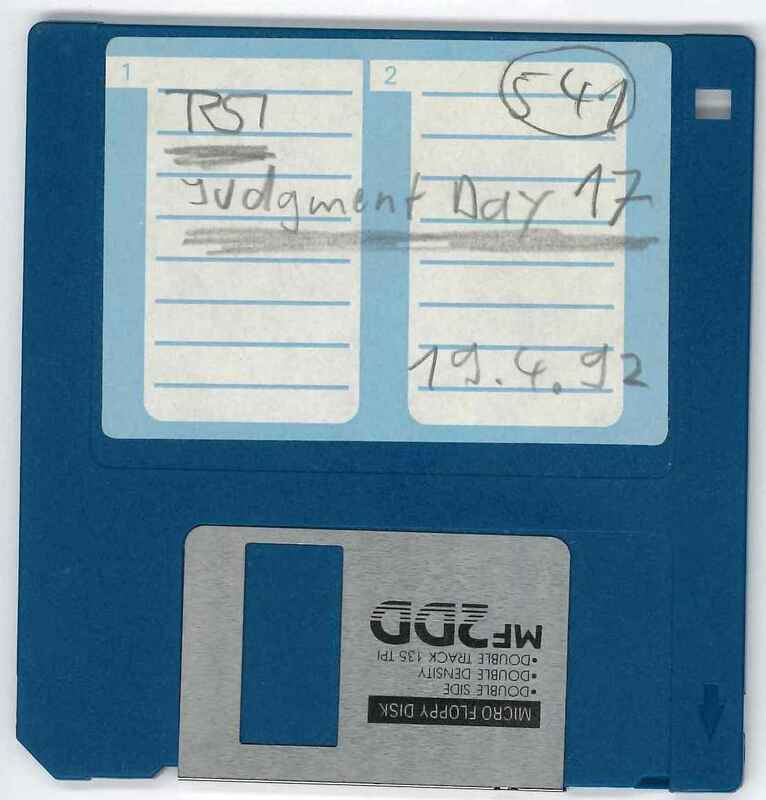 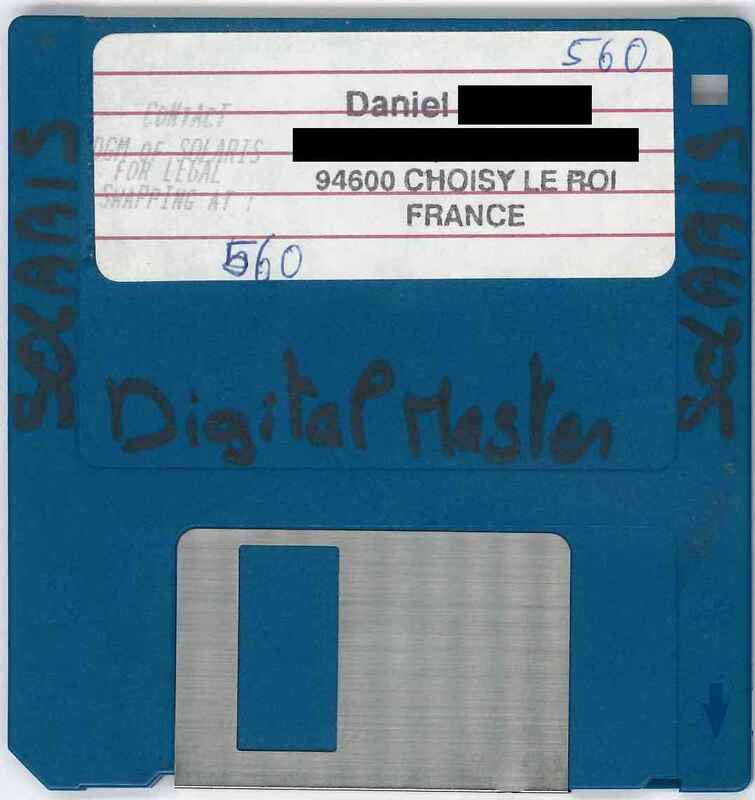 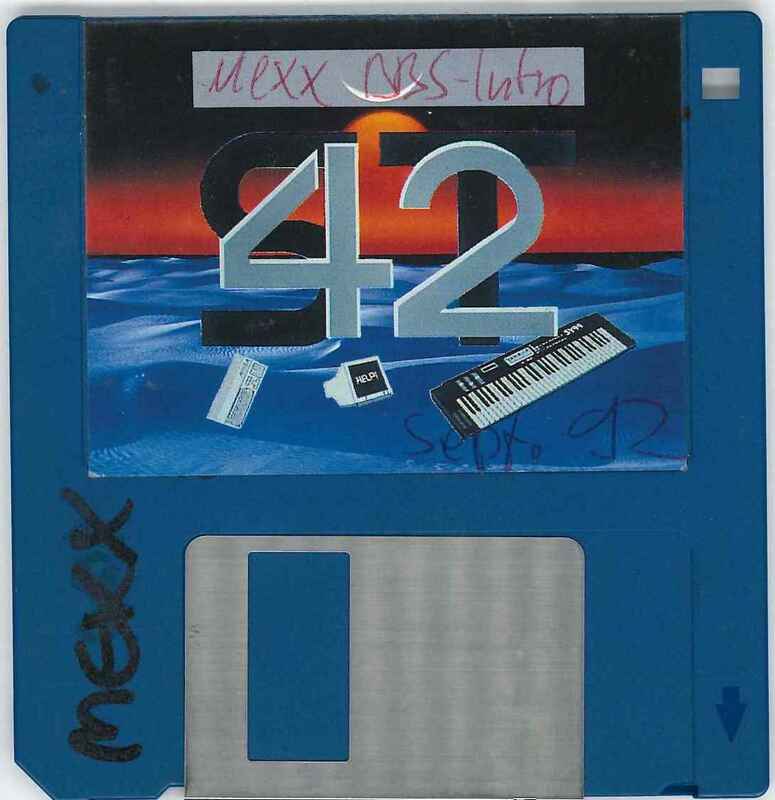 This resulted in a search warrant, which ordered the local police to confiscate from TMA’s home “disks; computers and [other] machines for the manufacturing and copying of disks, such as computers with disk drives, tape-to-tape recorders; counterfeit print materials, stickers, backup disks etc. 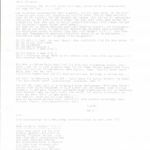 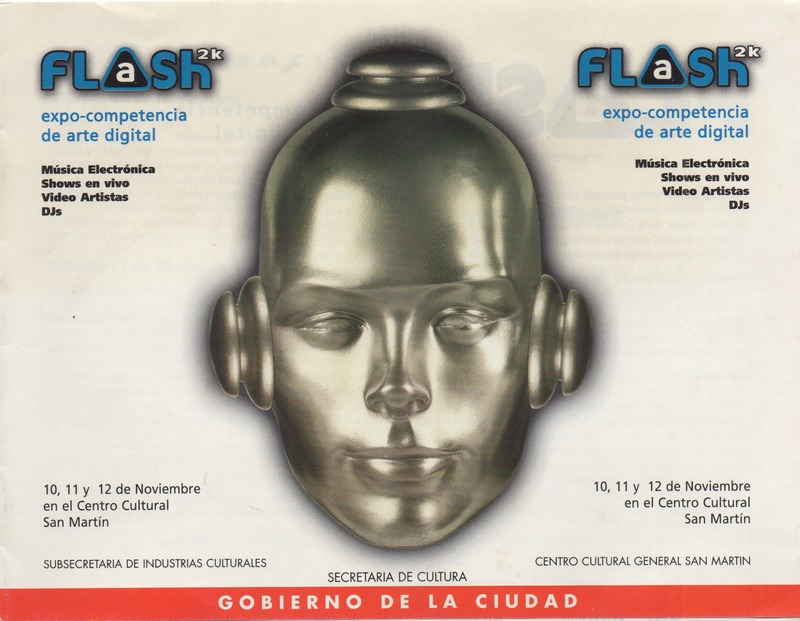 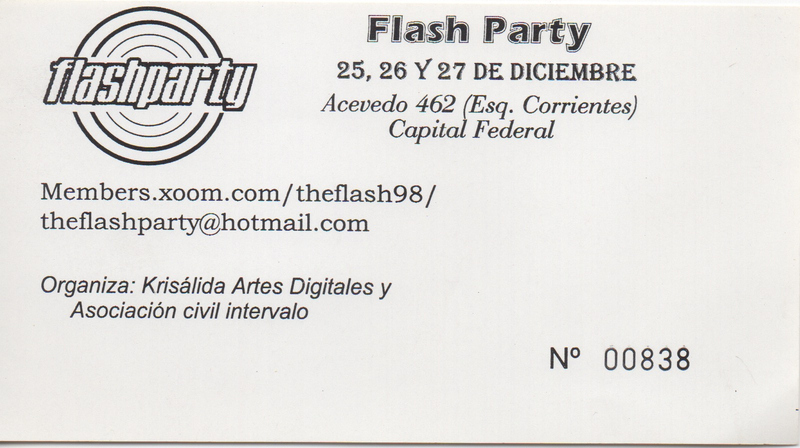 ; customers’ addresses, bank statements, word processing programs etc.” (p. 1-2). 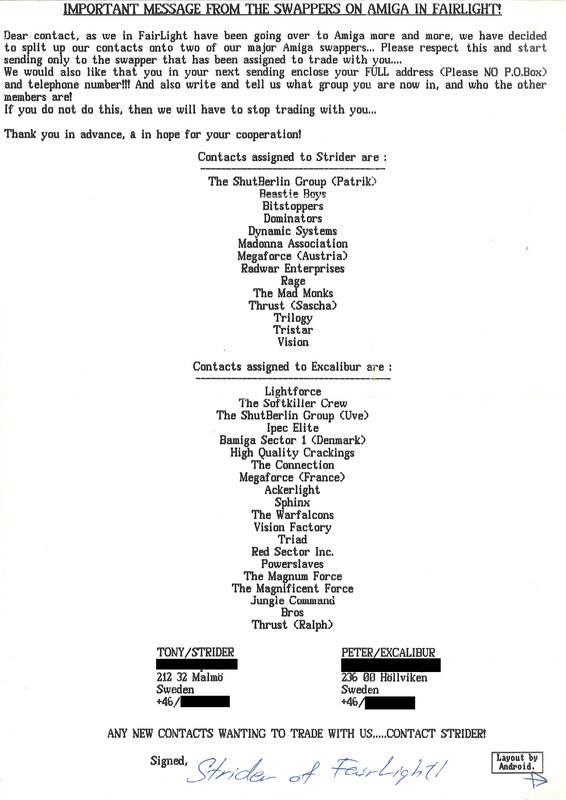 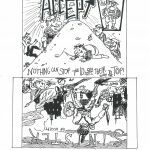 The wording was obviously made to match commercial piracy rather than hobbyist activism. 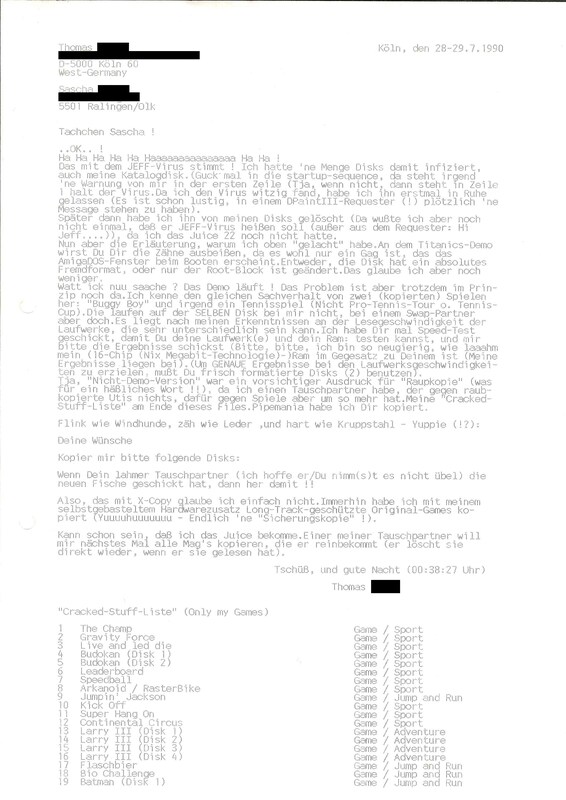 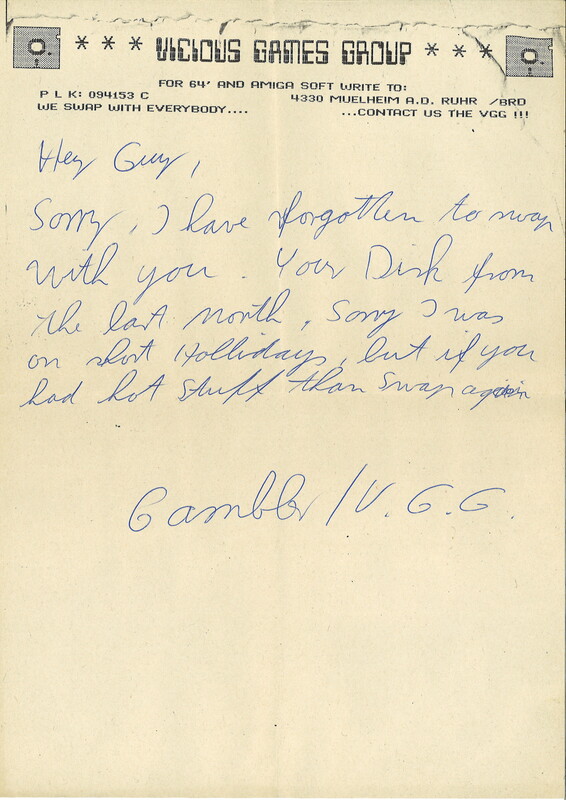 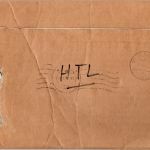 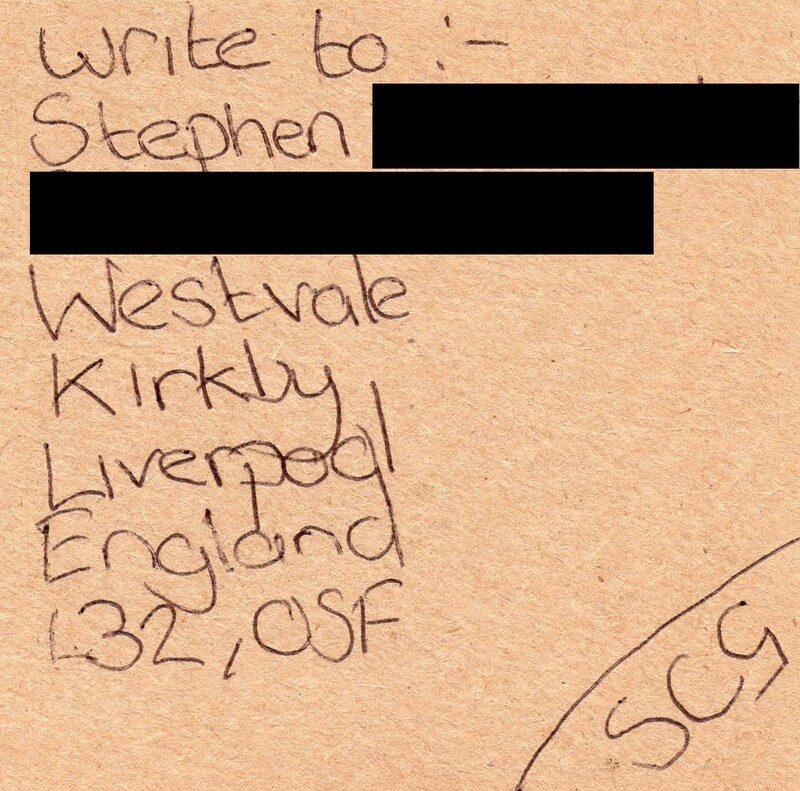 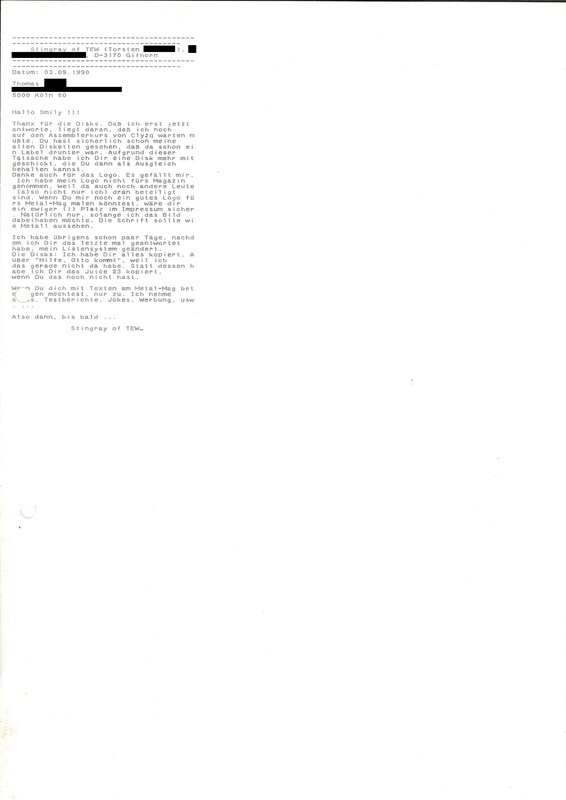 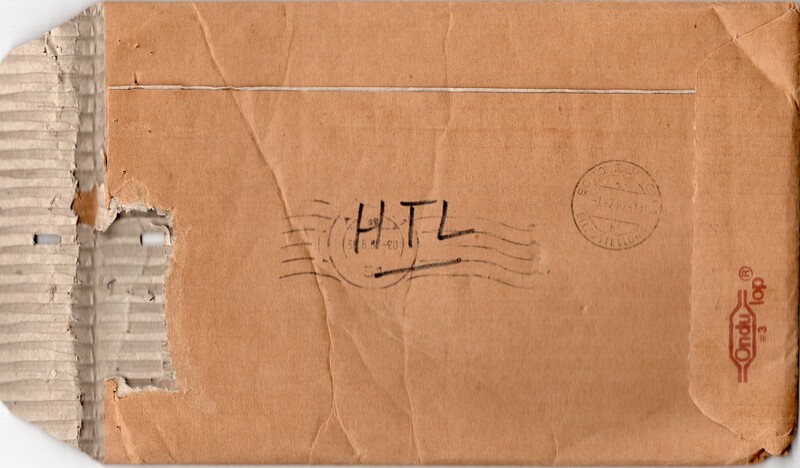 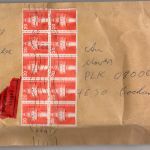 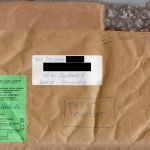 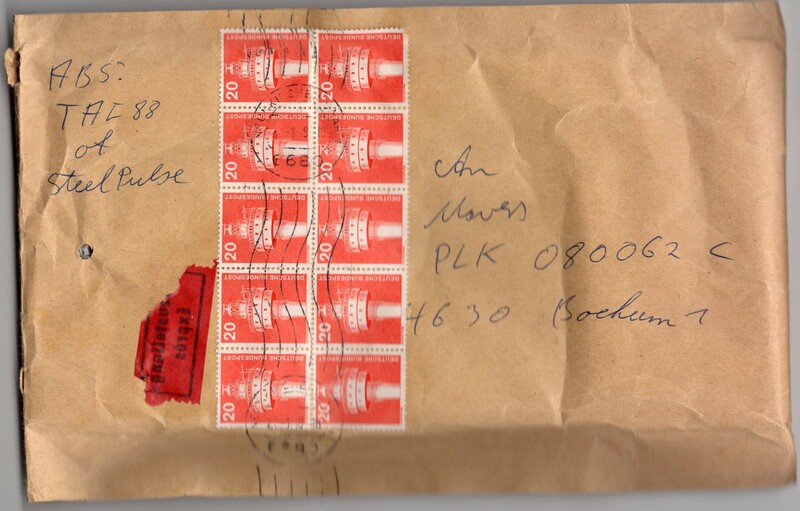 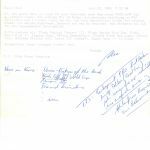 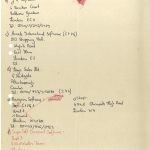 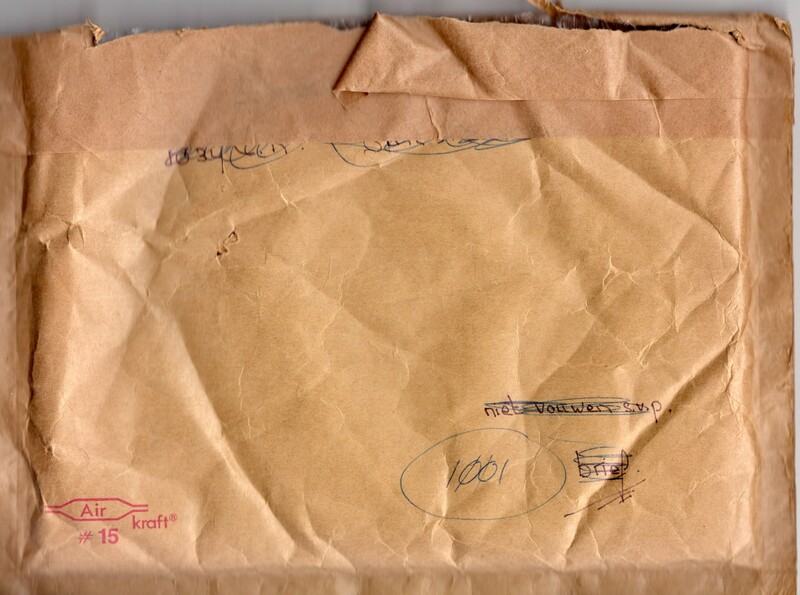 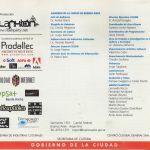 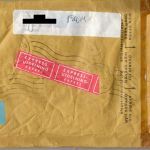 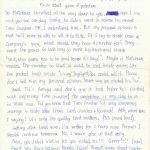 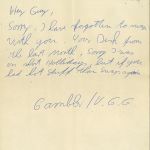 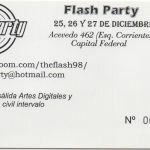 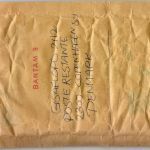 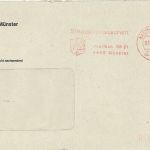 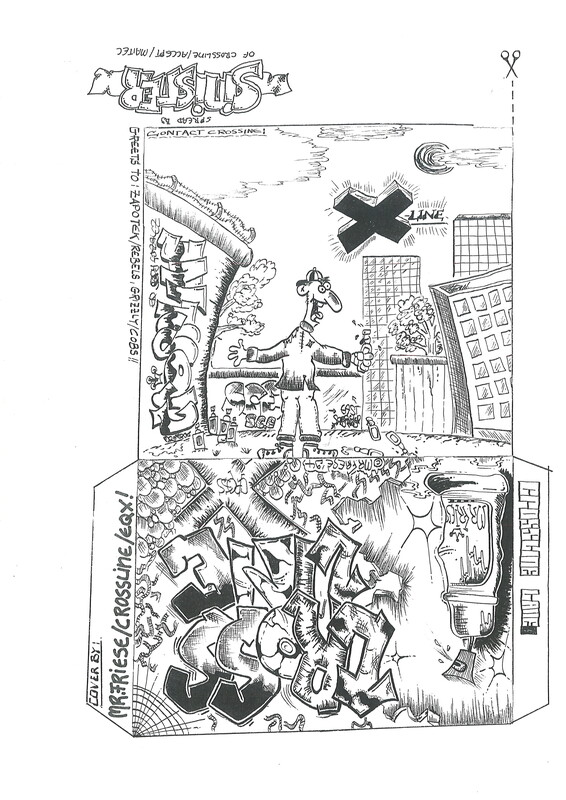 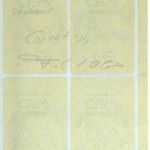 The house search was conducted a few months later, resulting in about 200 disks, PLK cards and postal envelopes (but no address books) being confiscated (p. 3-4). 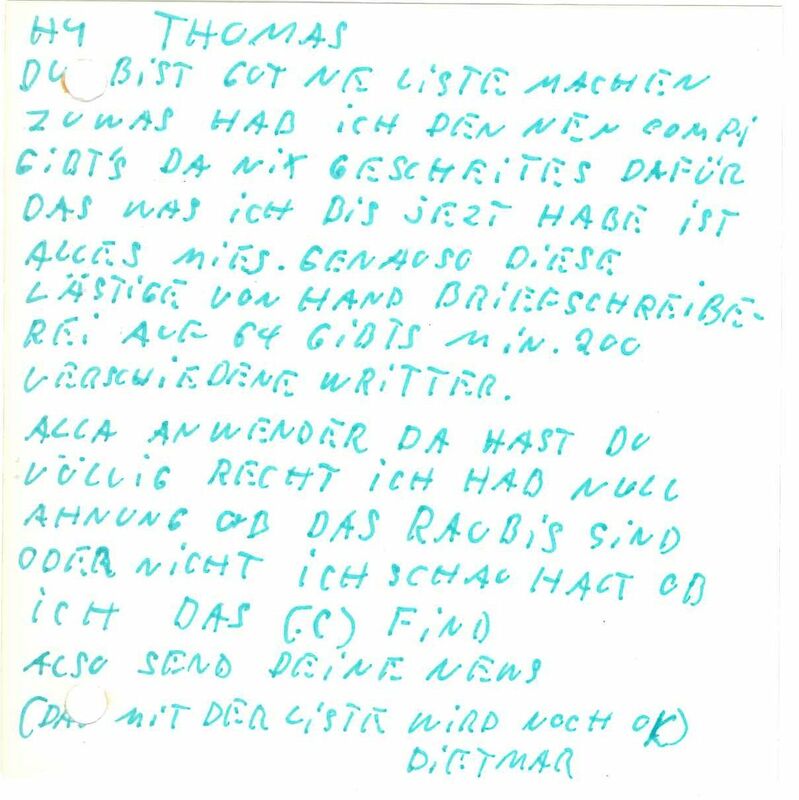 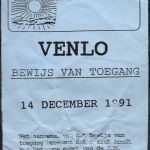 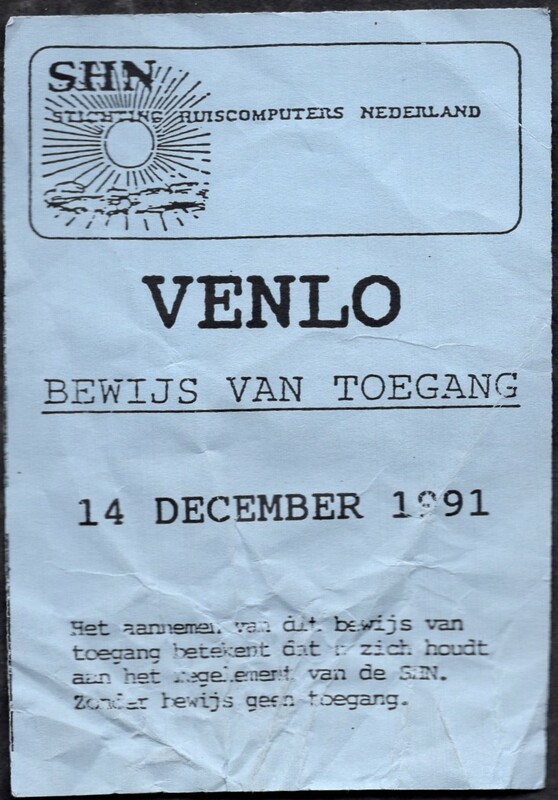 Despite the seemingly vast evidence, the case, like so often, came to a halt: In May 1991, TMA’s parents were informed by the public prosecutor that the proceedings have been stopped “as [your son] has been warned enough through the consequences of his actions. 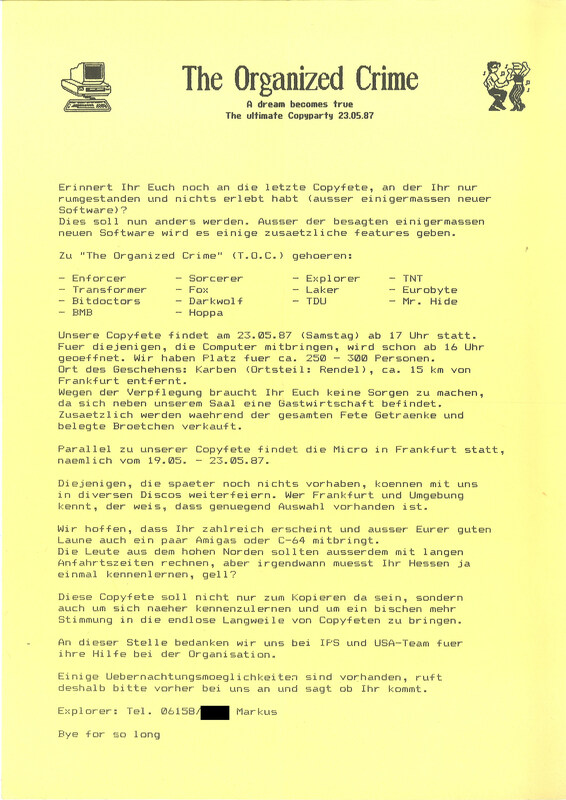 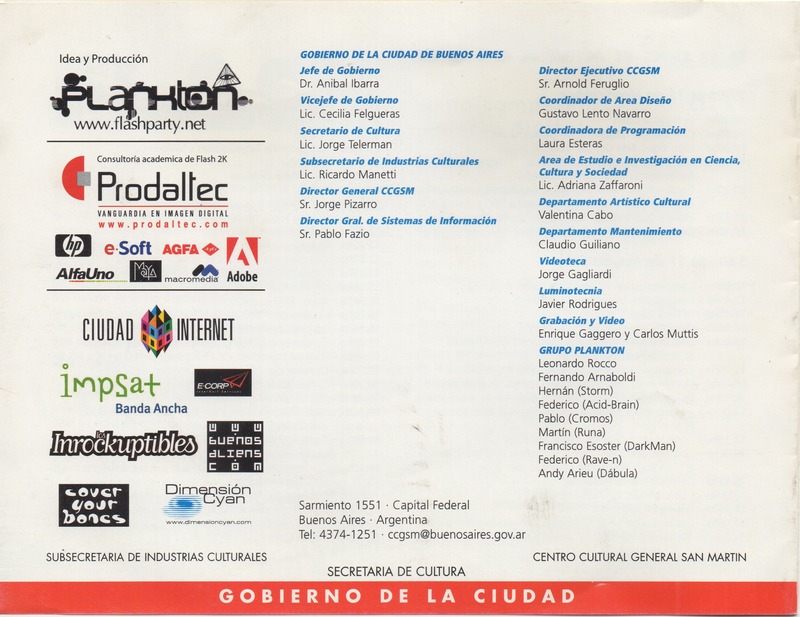 I assume that in the future he will conduct himself orderly when it comes to the usage of computer programs, and ask you to undertake educational measures” (p. 5-6). 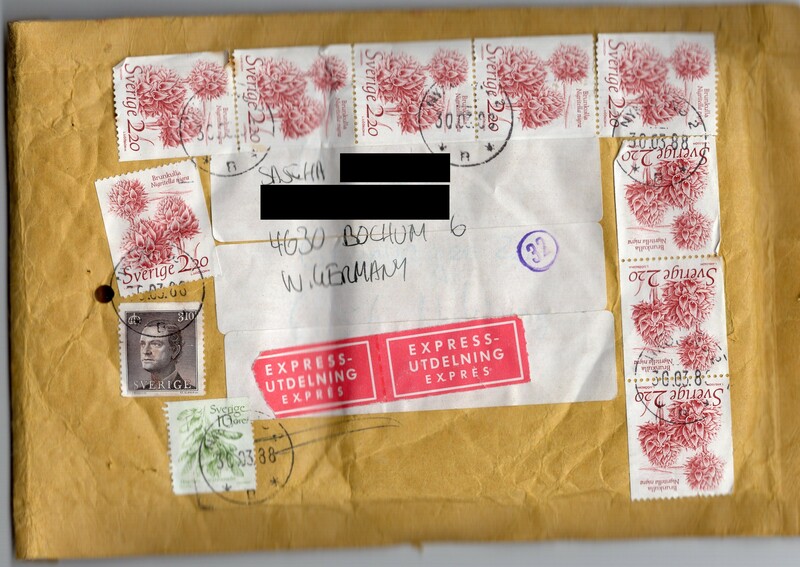 After getting off so lightly, TMA even received one (!) 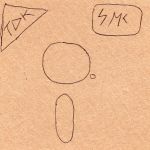 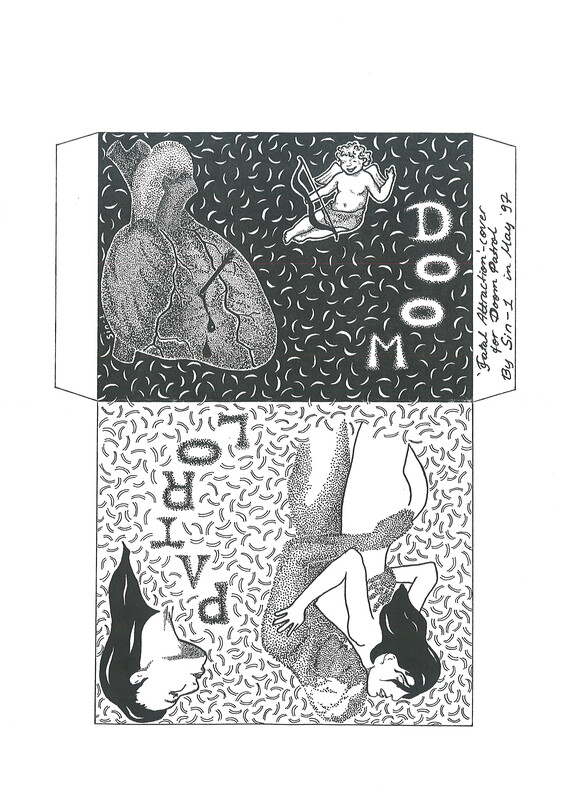 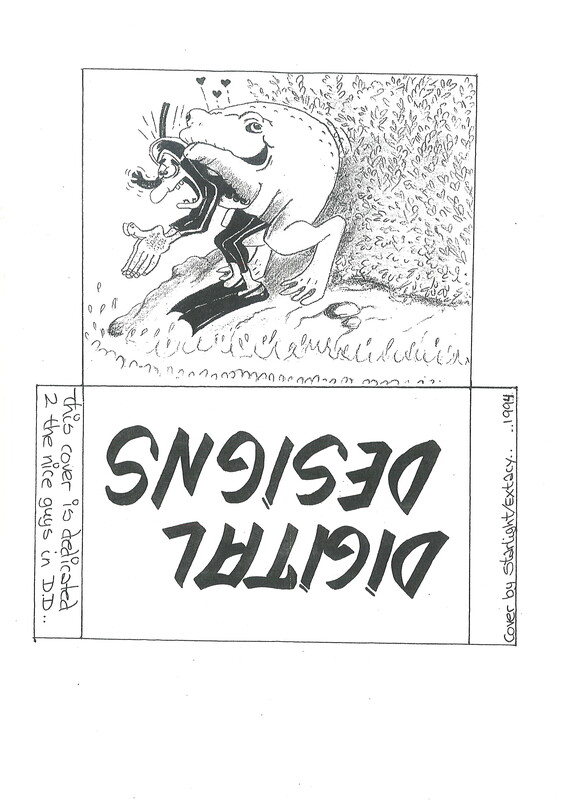 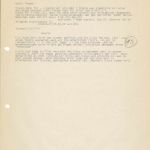 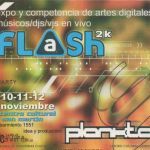 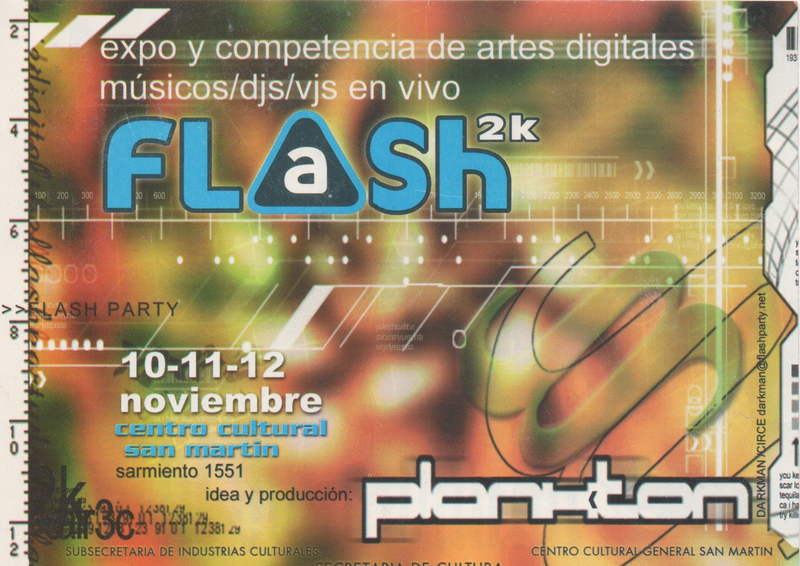 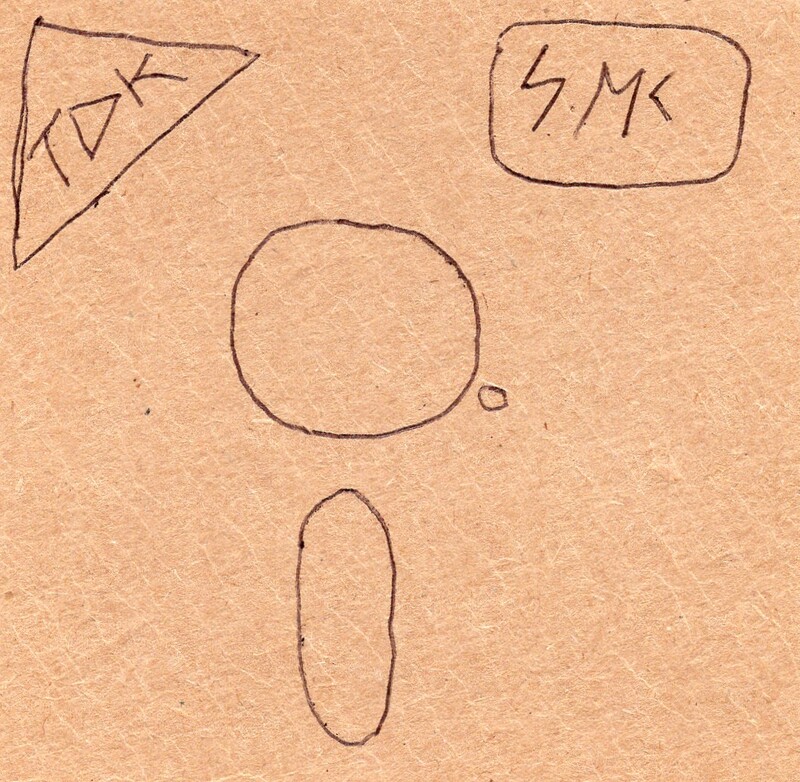 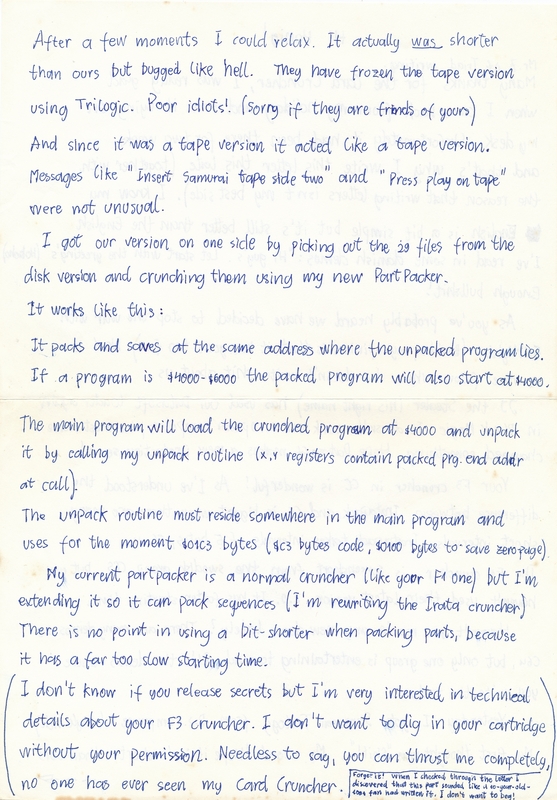 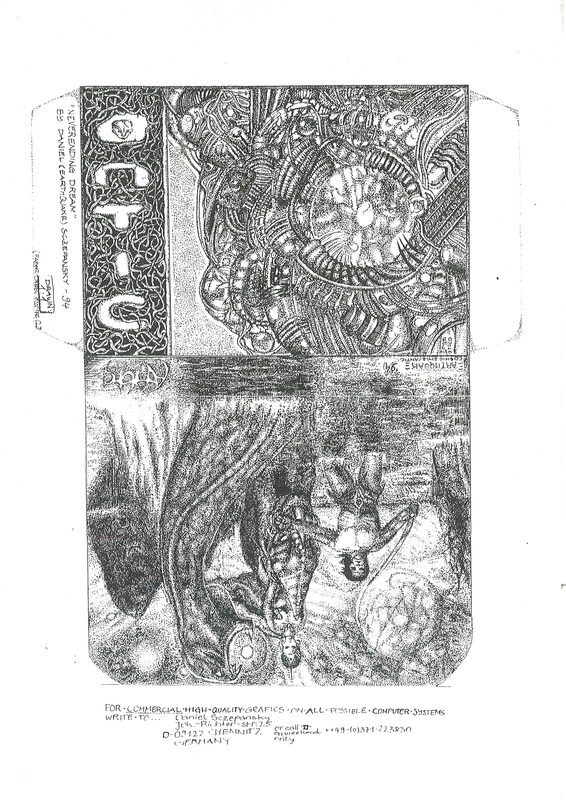 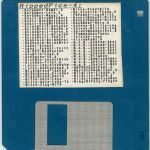 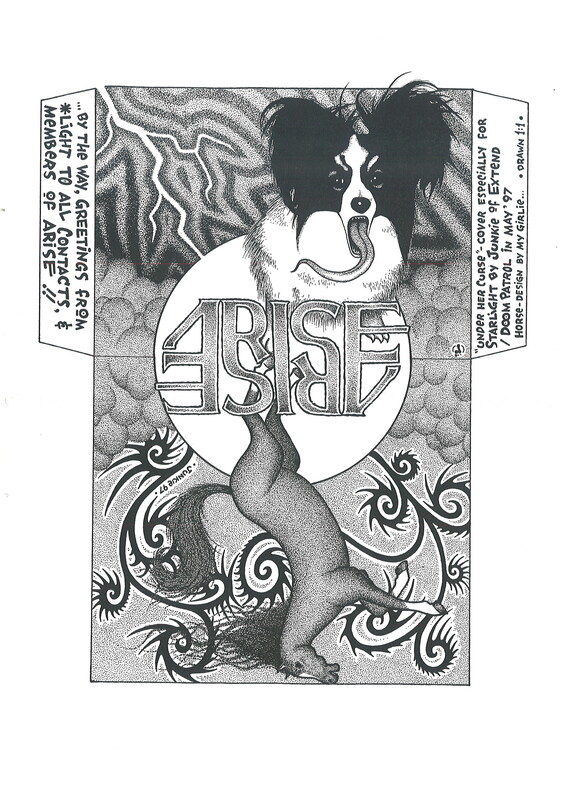 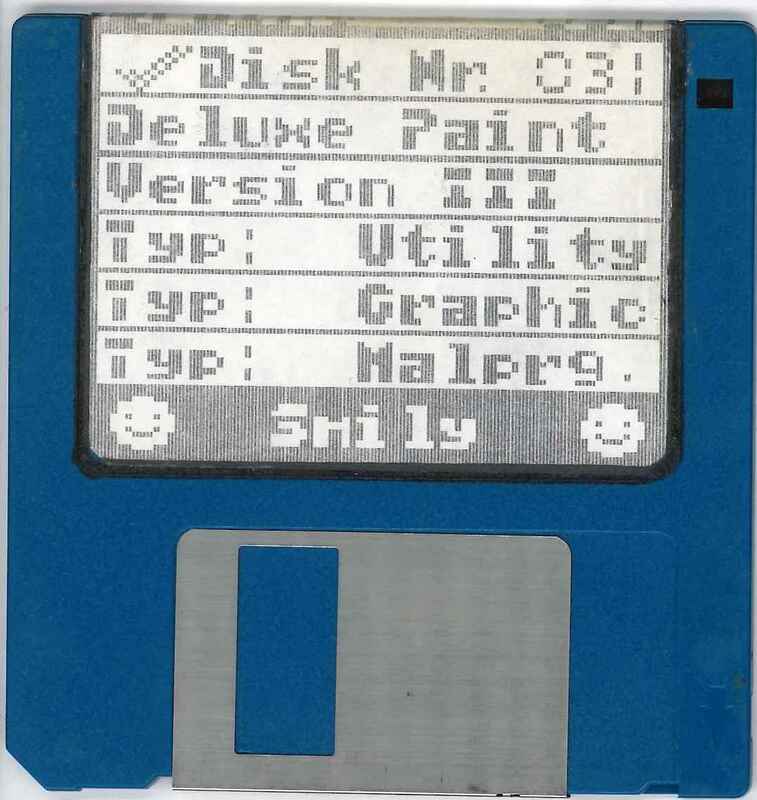 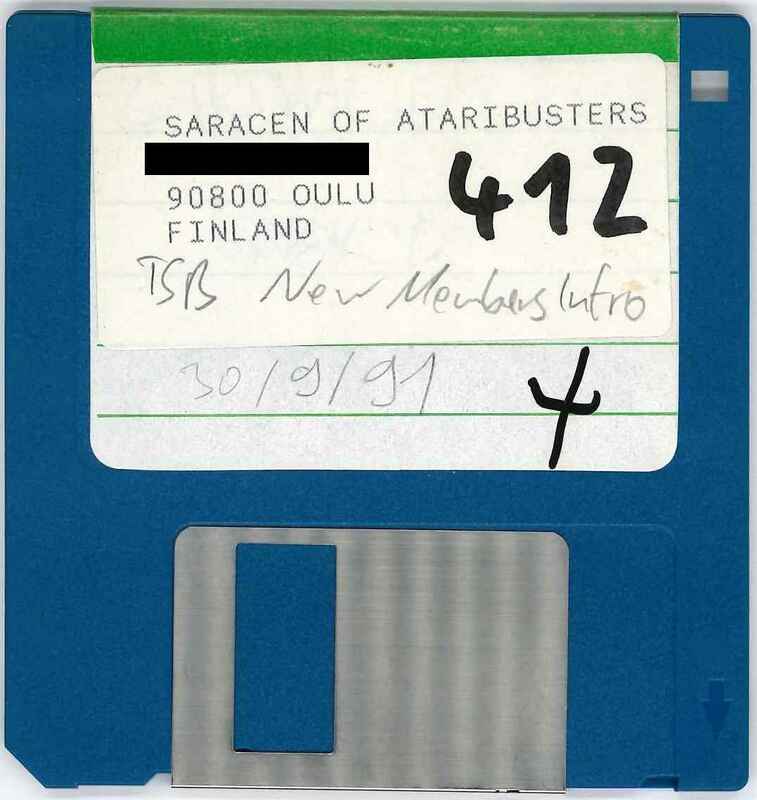 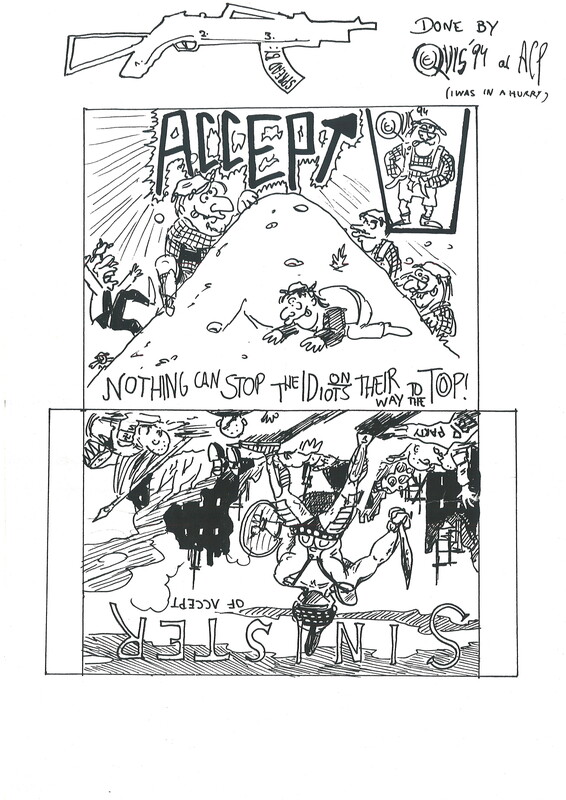 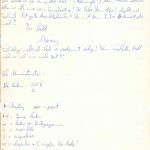 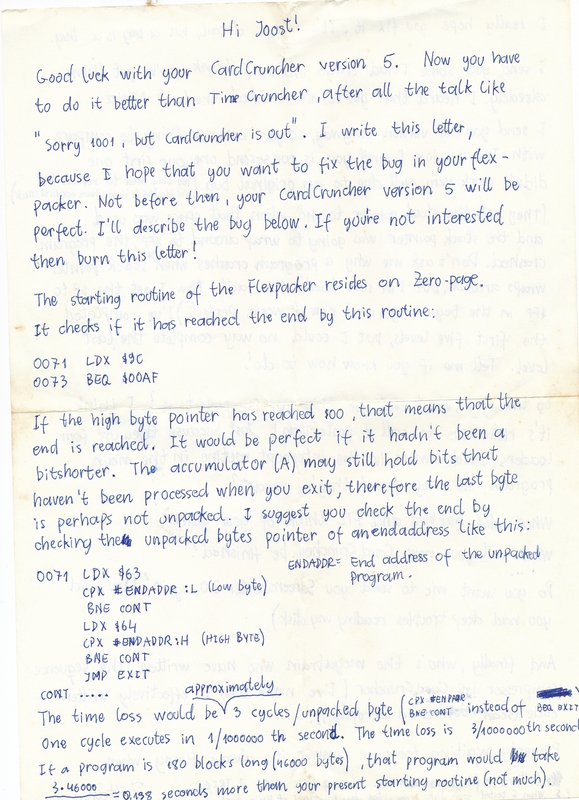 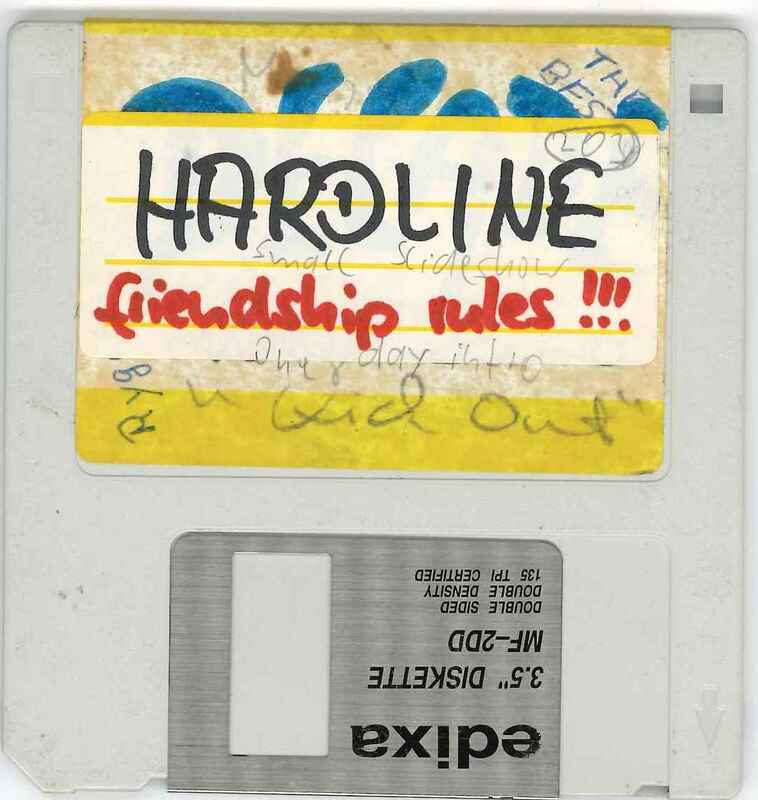 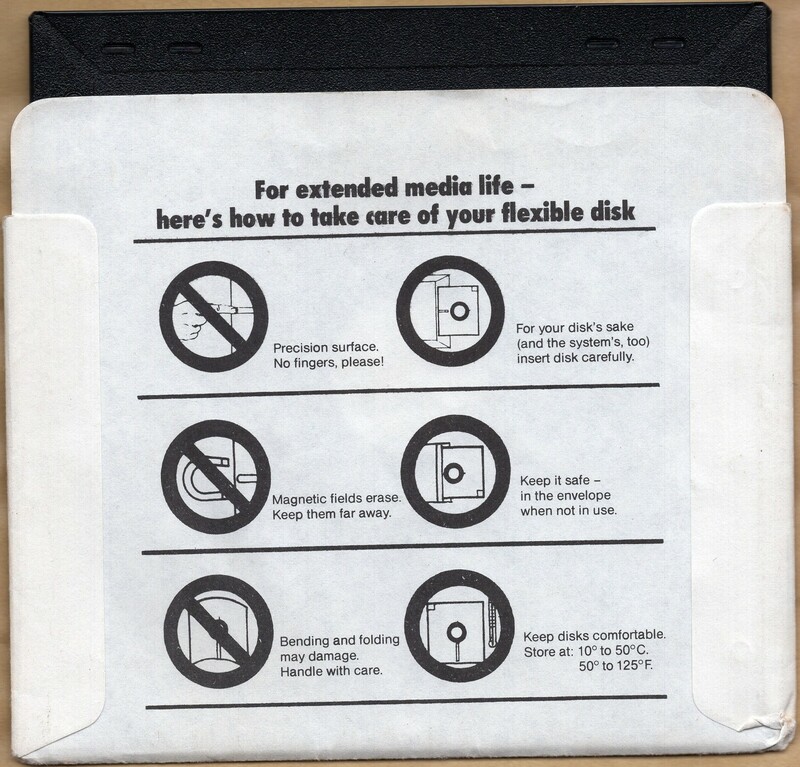 disk back (p. 7-8). 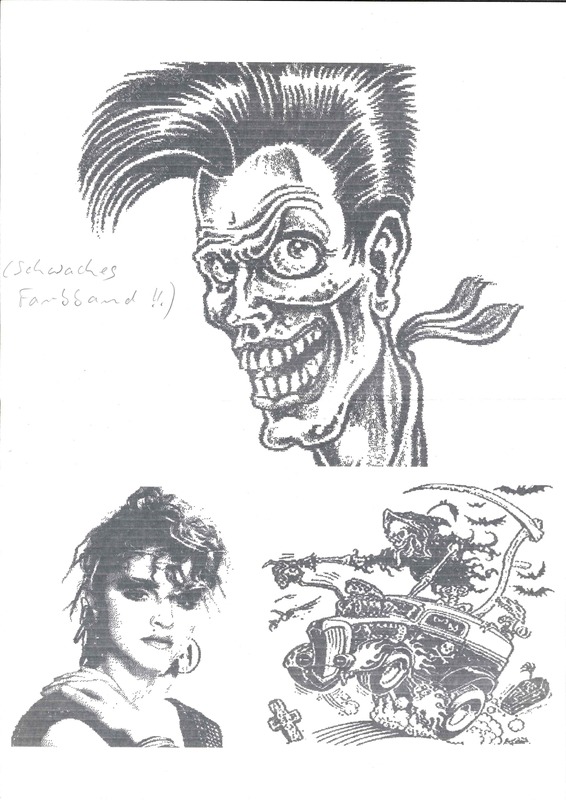 You can view the scans in the gallery below, or download them from our archive here.